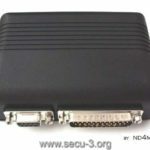 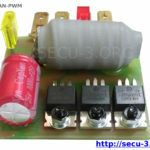 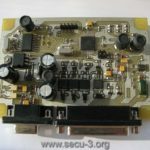 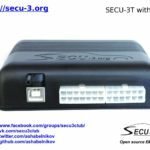 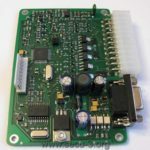 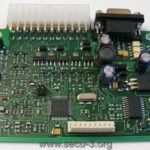 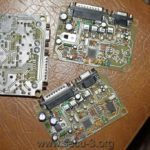 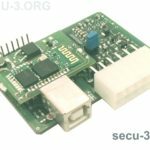 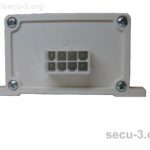 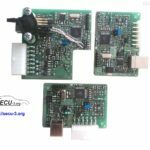 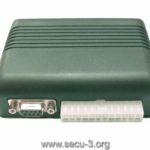 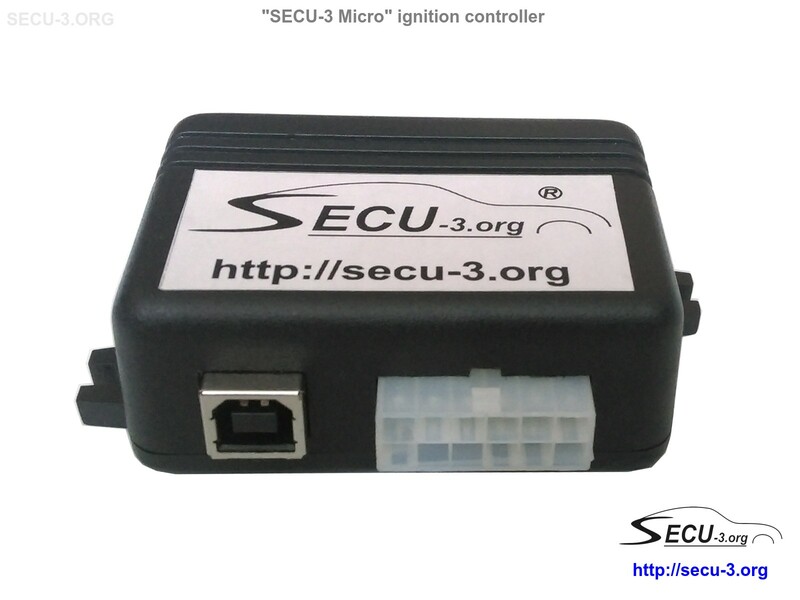 History of the SECU-3 project has its origins back in 2005 when the author (A. Shabelnikov) began to develop the first version of the SECU-1 unit (ignition controller). 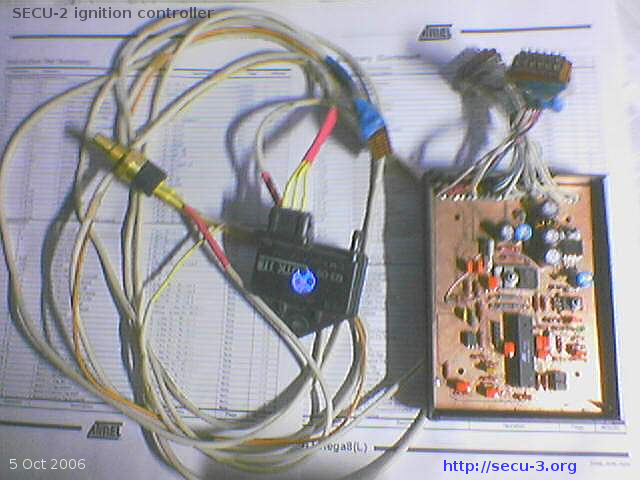 This ignition controller was performed on the ATmega8 MCU, had synchronization from a Hall sensor and drove two wasted spark coils. 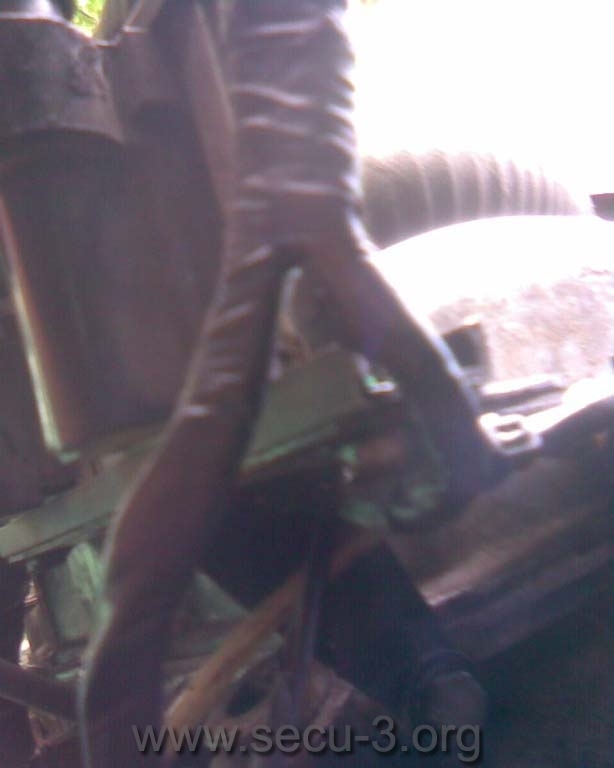 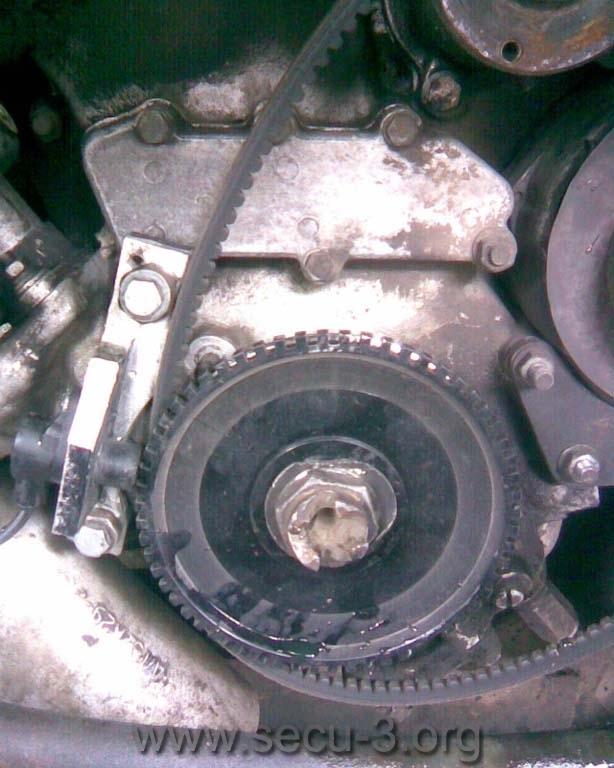 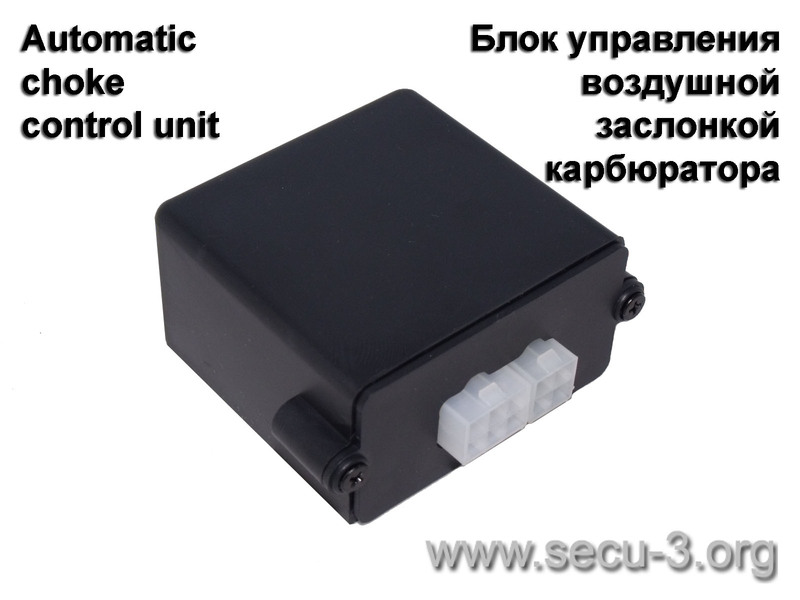 This unit was even provided the opportunity of synchronization from the contact interrupter. 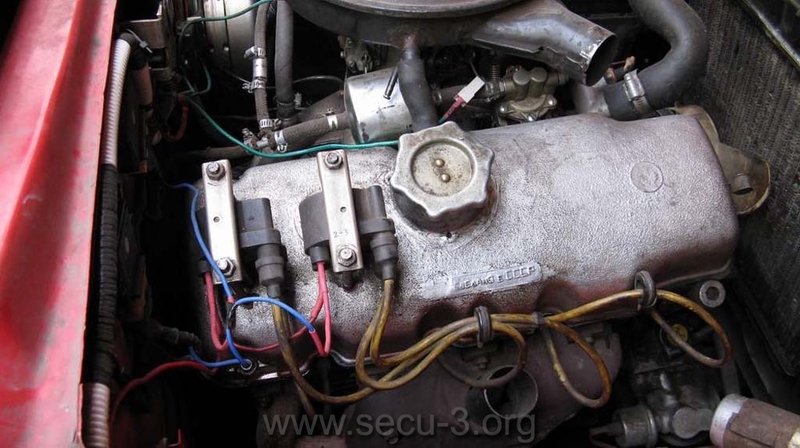 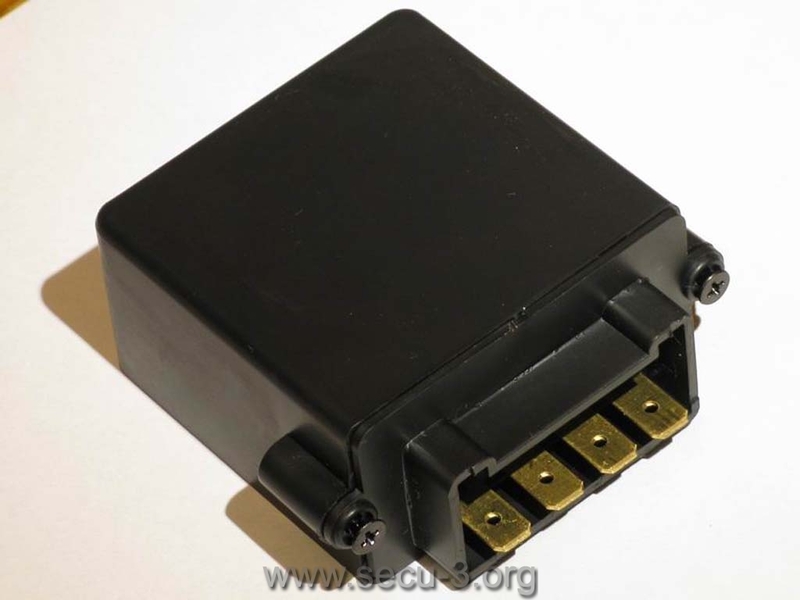 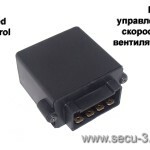 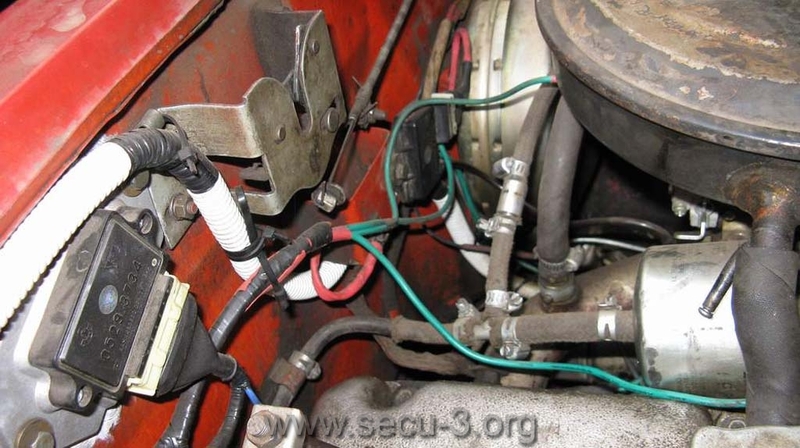 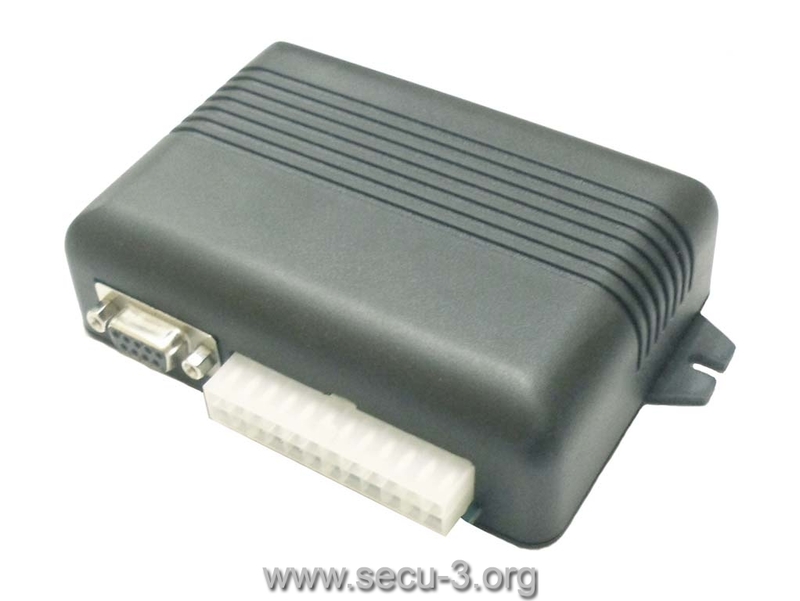 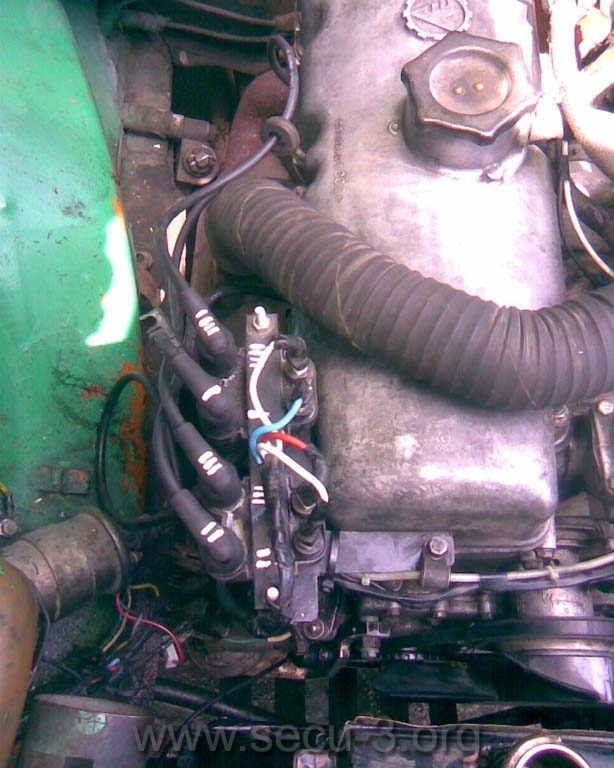 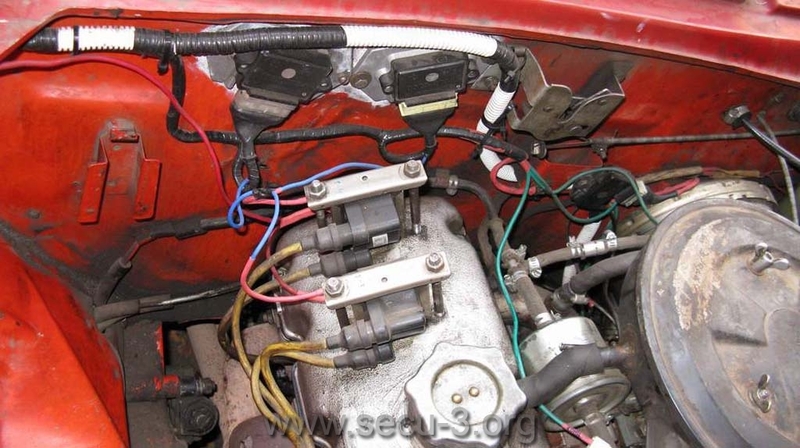 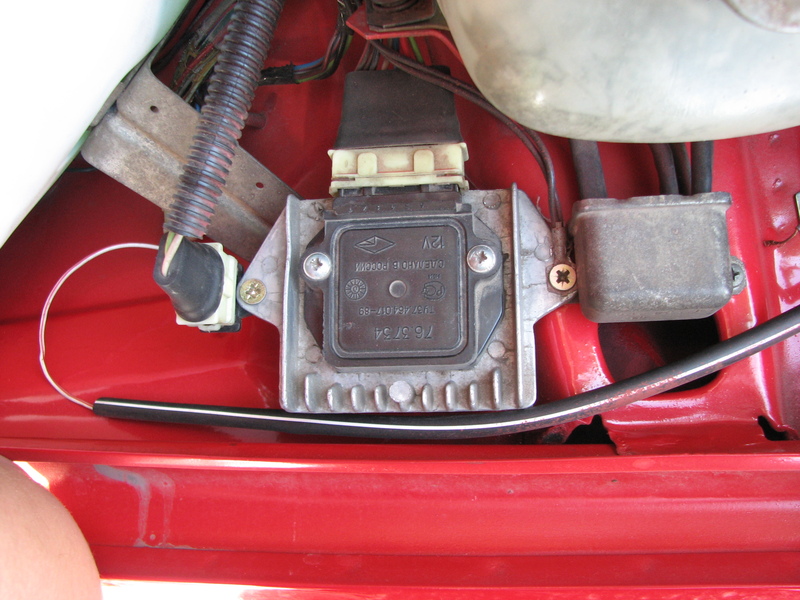 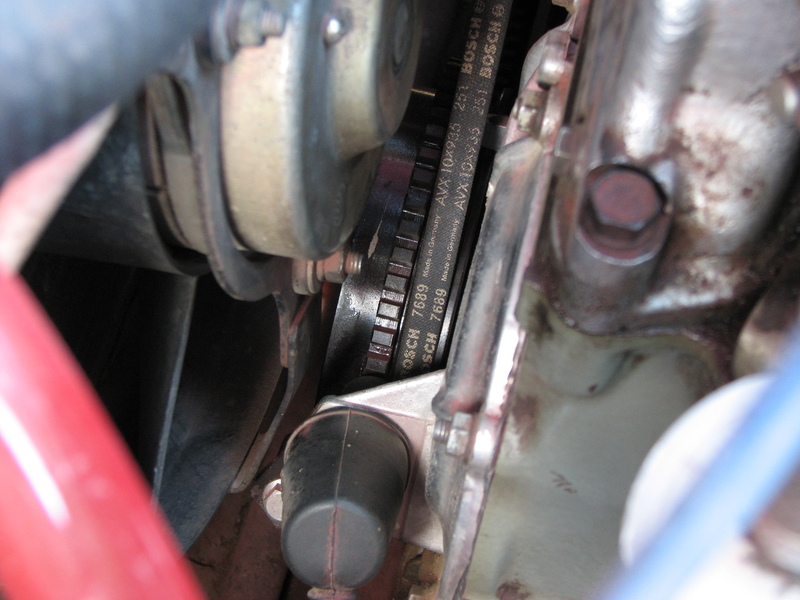 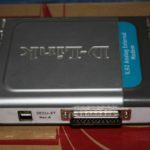 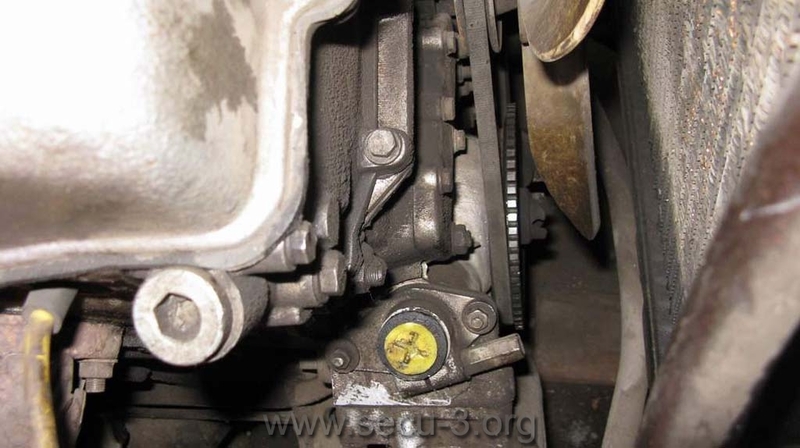 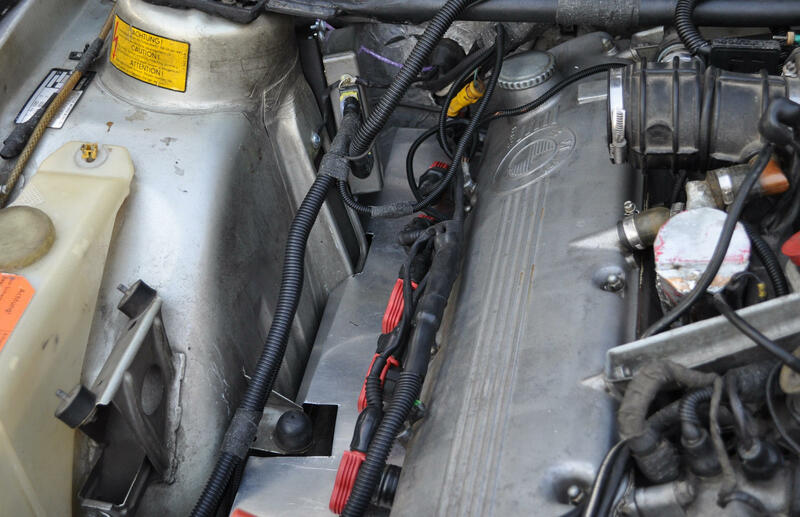 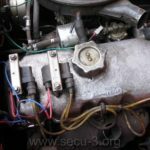 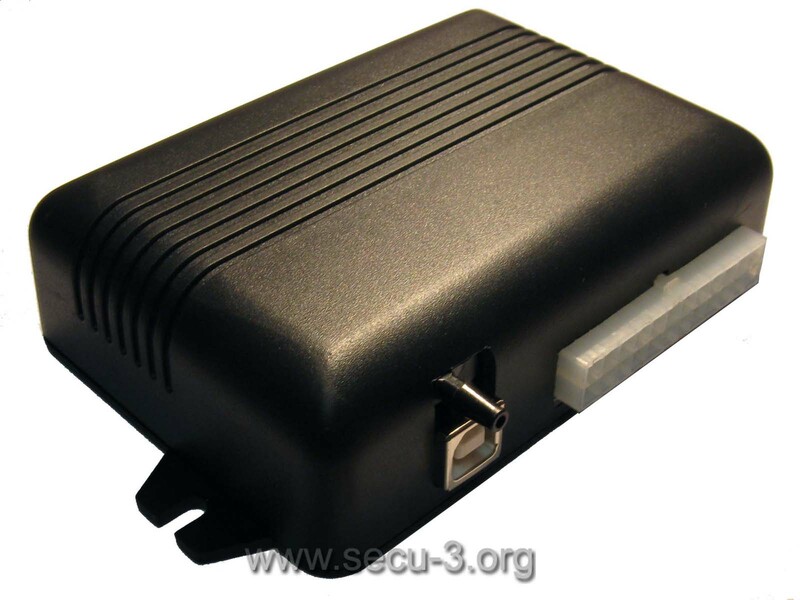 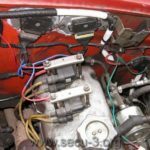 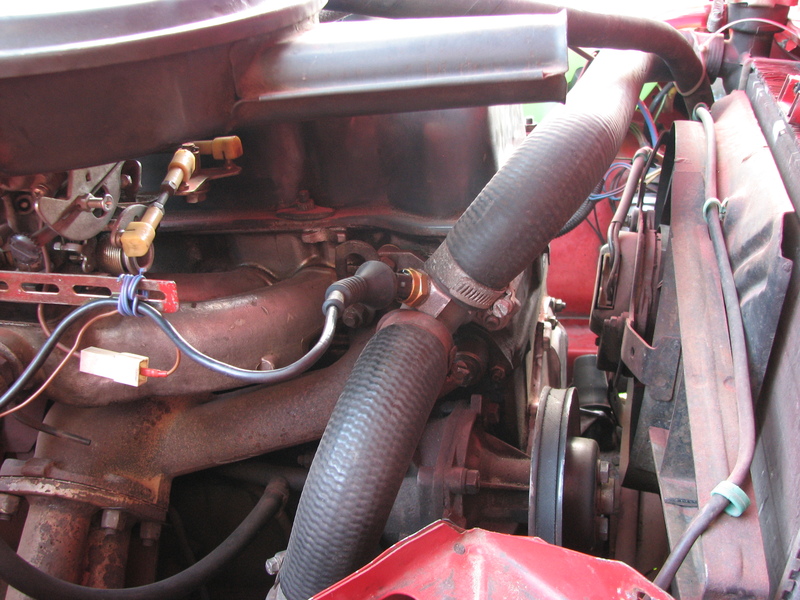 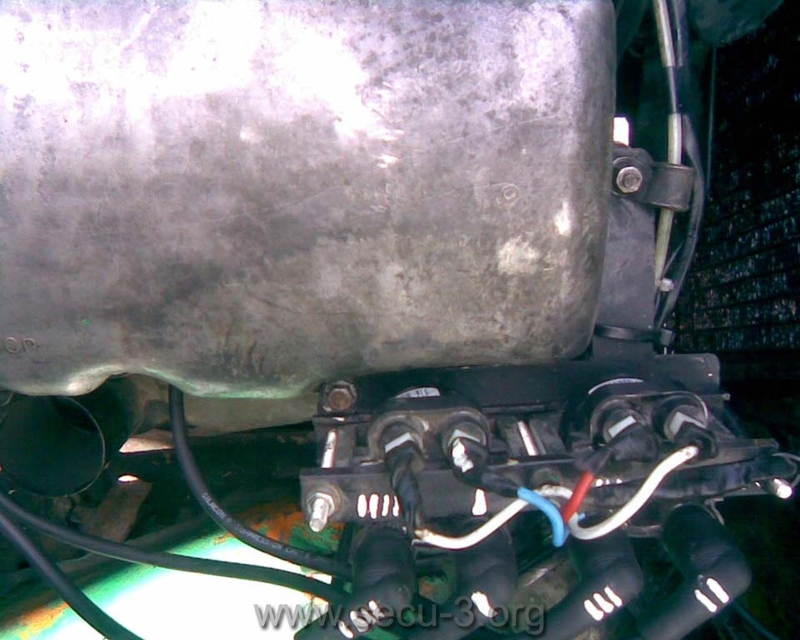 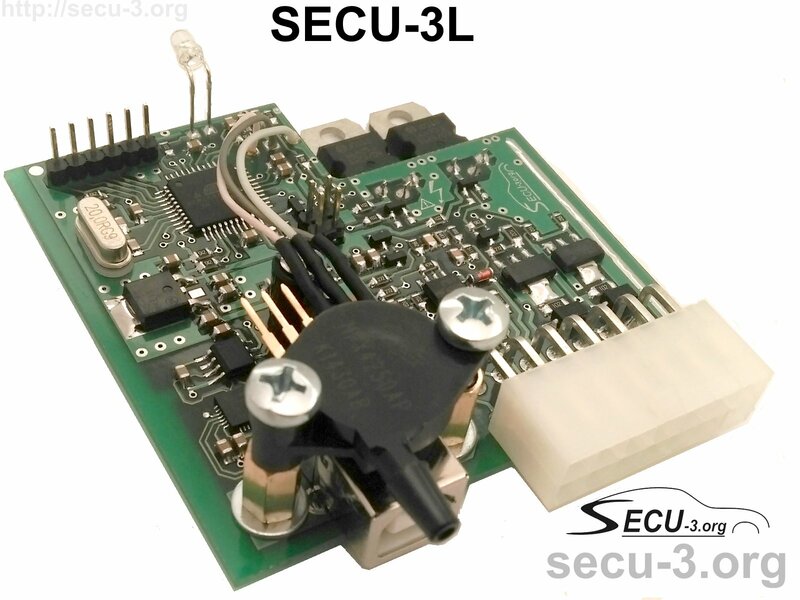 Then there was the SECU-2, which had differences from the predecessor in board and additional features (MAP sensor input, output for the starter ‘s relay control etc). 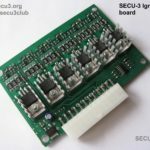 First two photos show board made by the author in person. 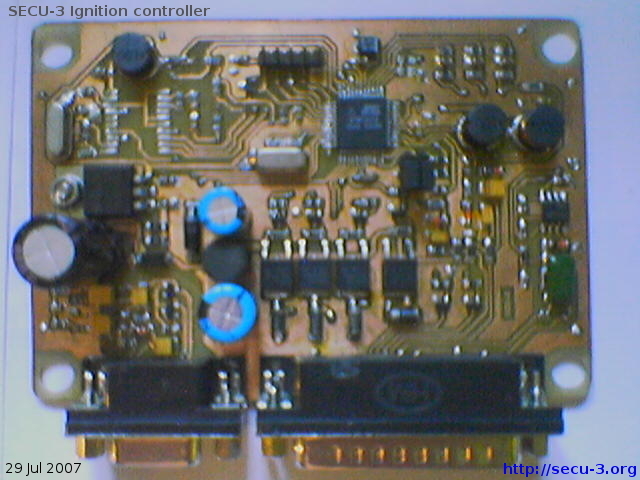 Other photos depict examples of boards that are made by different users. 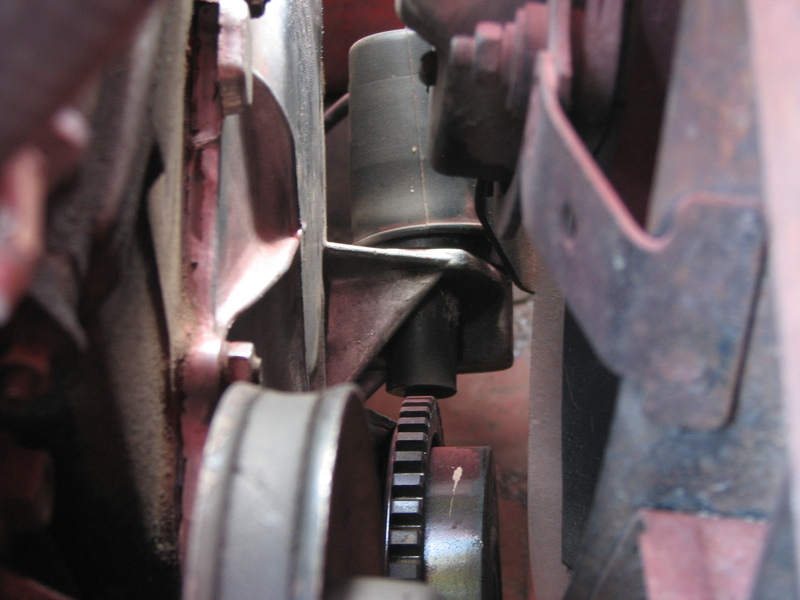 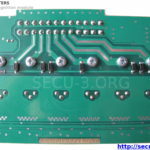 When the software features have become superior to the hardware capabilities, a new, improved modification of unit was developed – SECU-3T (autumn 2011). 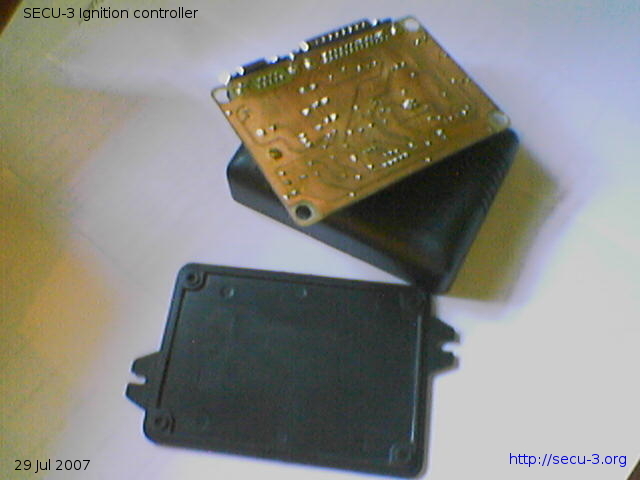 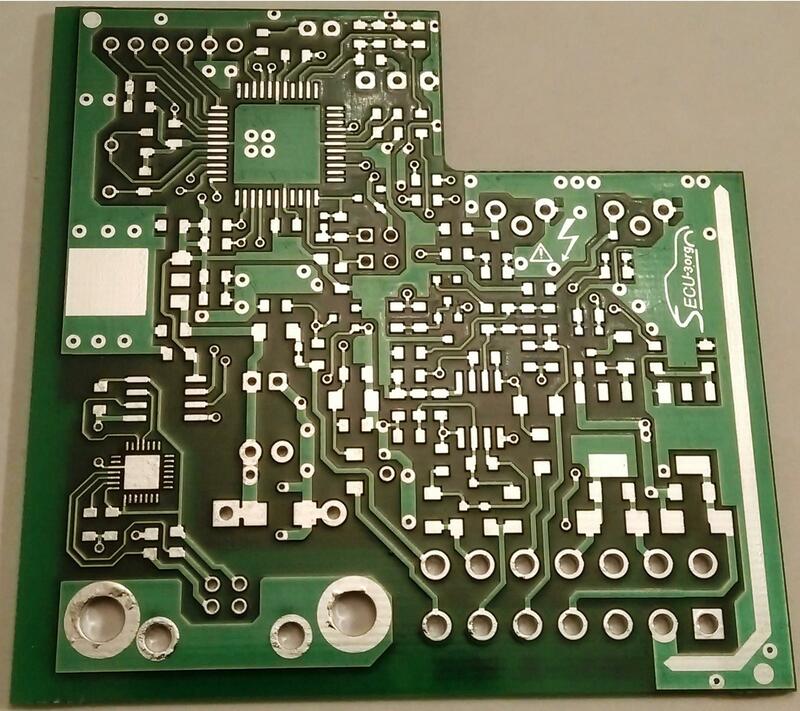 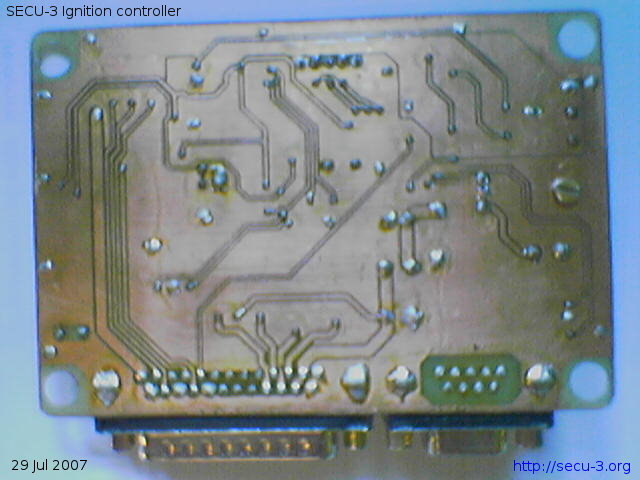 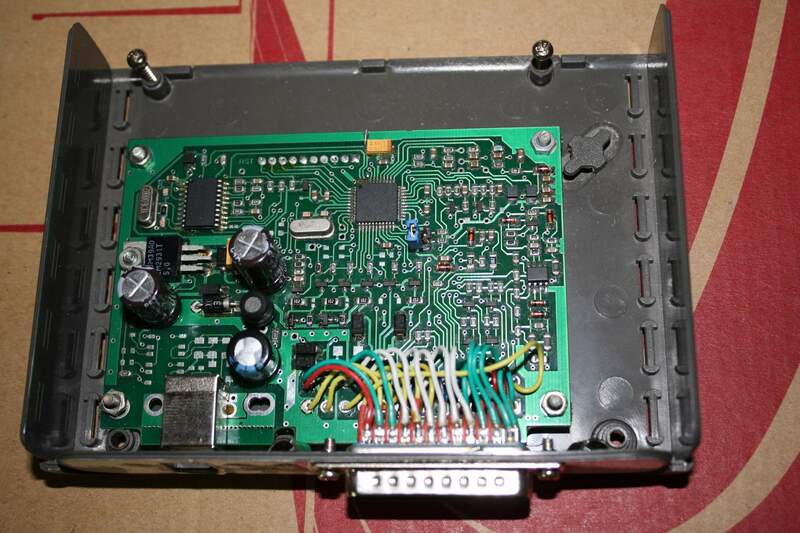 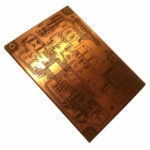 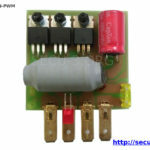 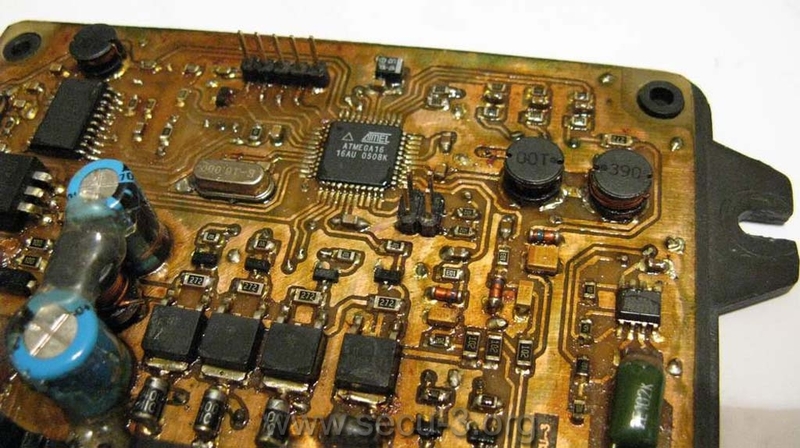 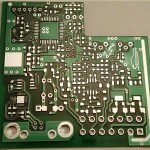 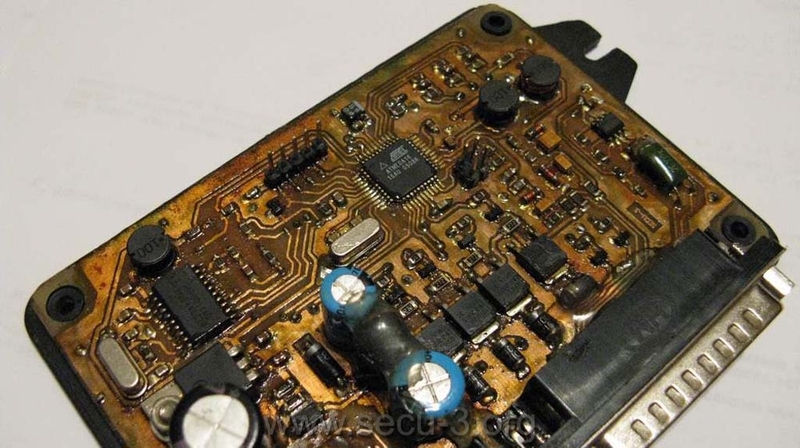 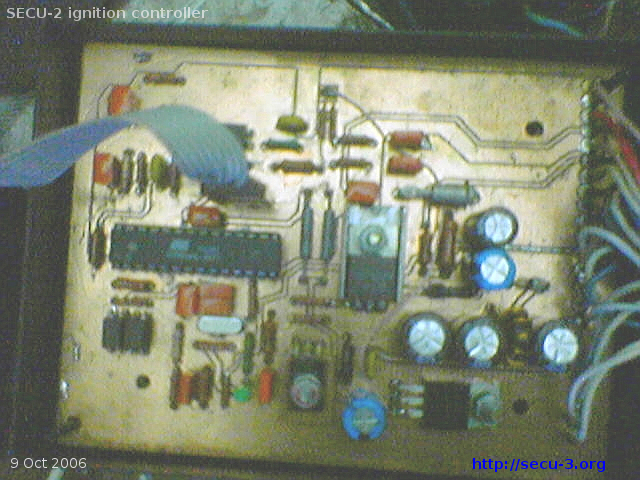 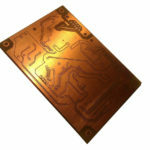 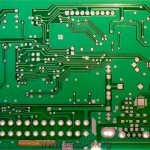 In December 2011 PCB drawing was ready and it was sent to a production. 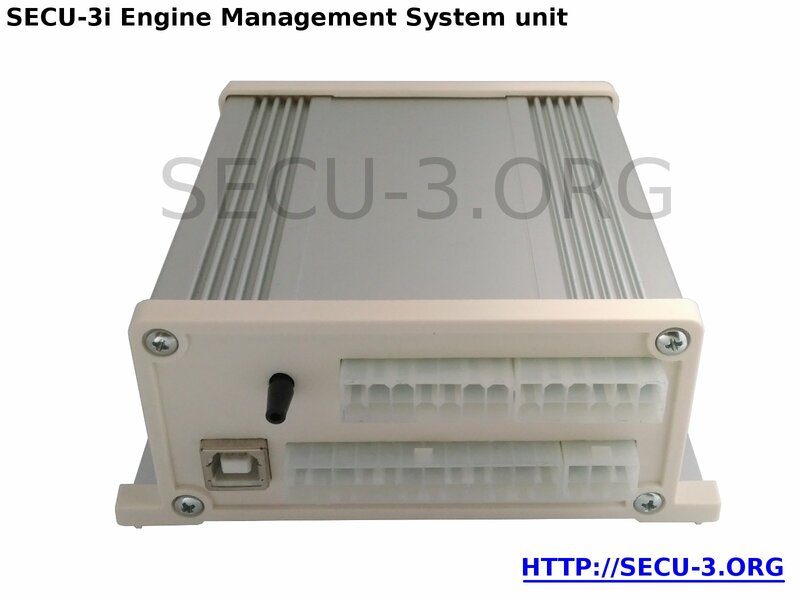 This unit is produced and to this day. 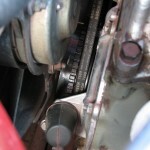 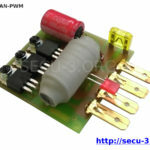 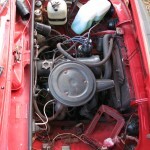 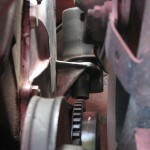 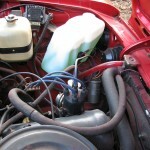 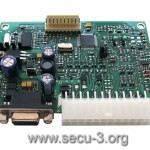 For many years the author was working on expanding of the software and making minor changes to the board of this unit. 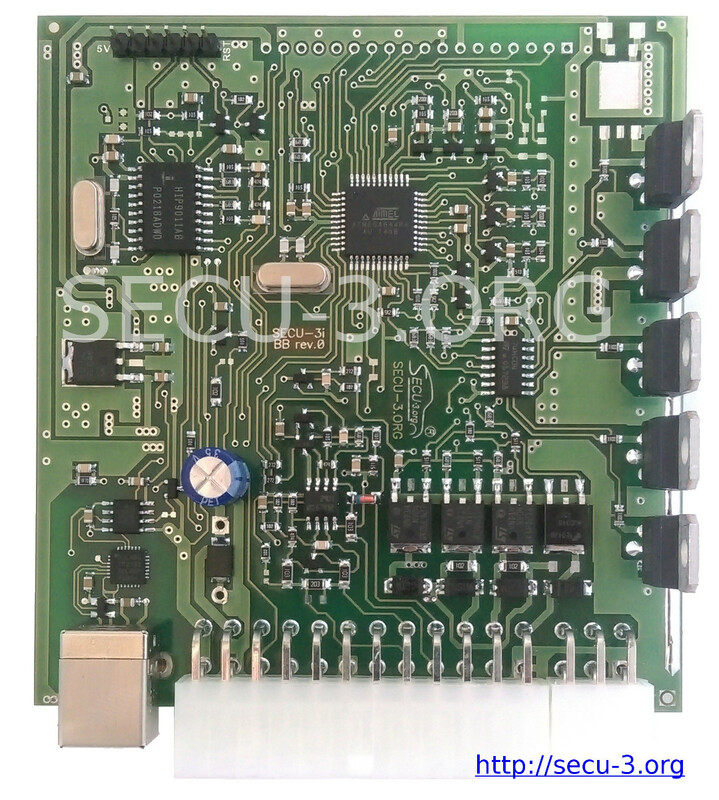 As a result, there is a set revisions of the board. 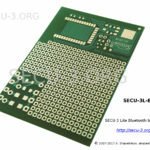 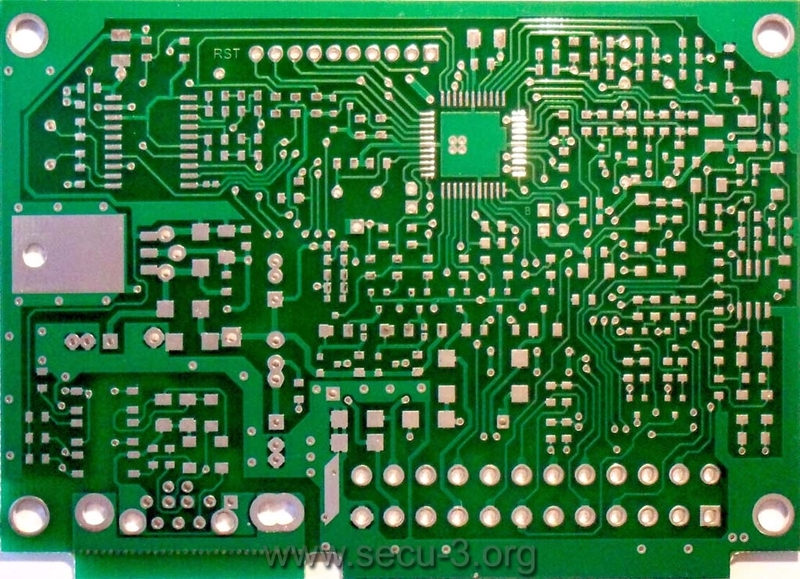 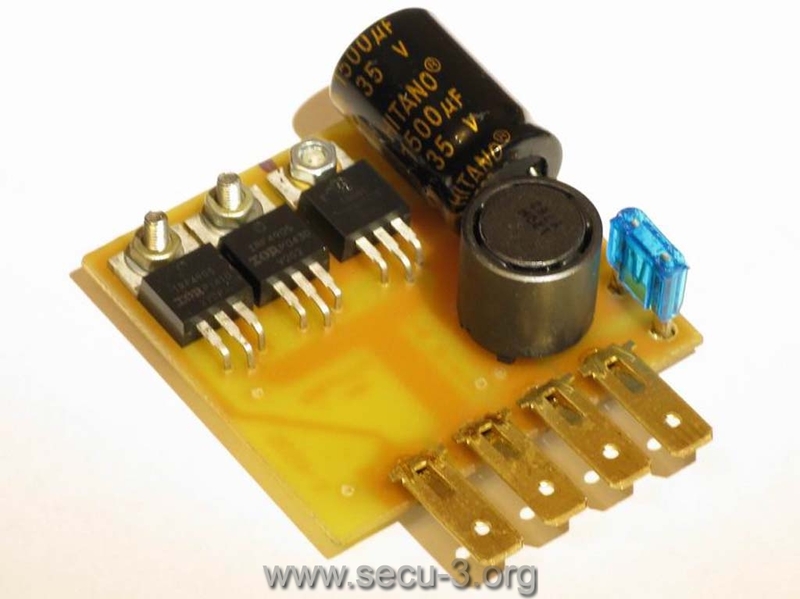 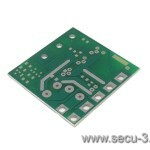 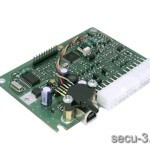 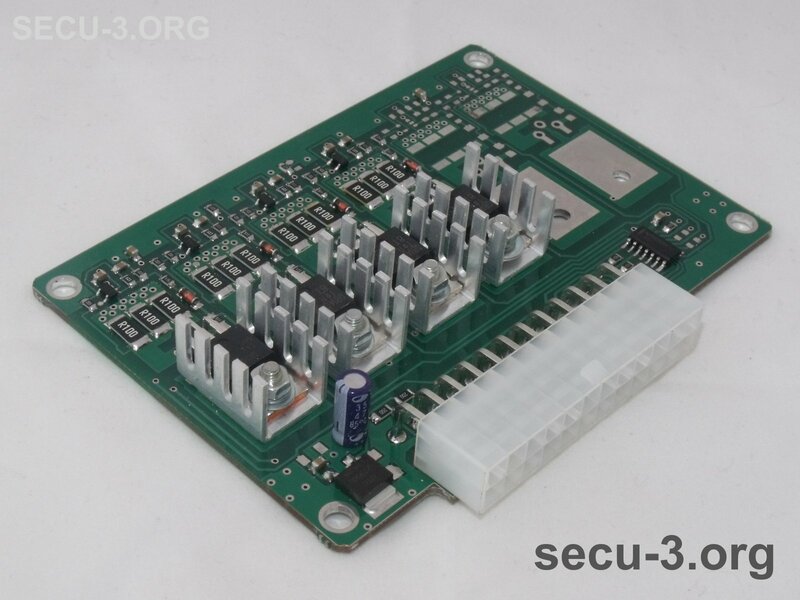 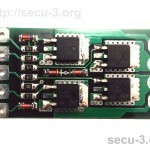 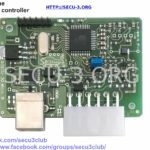 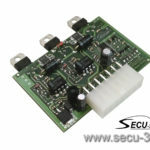 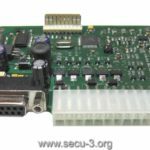 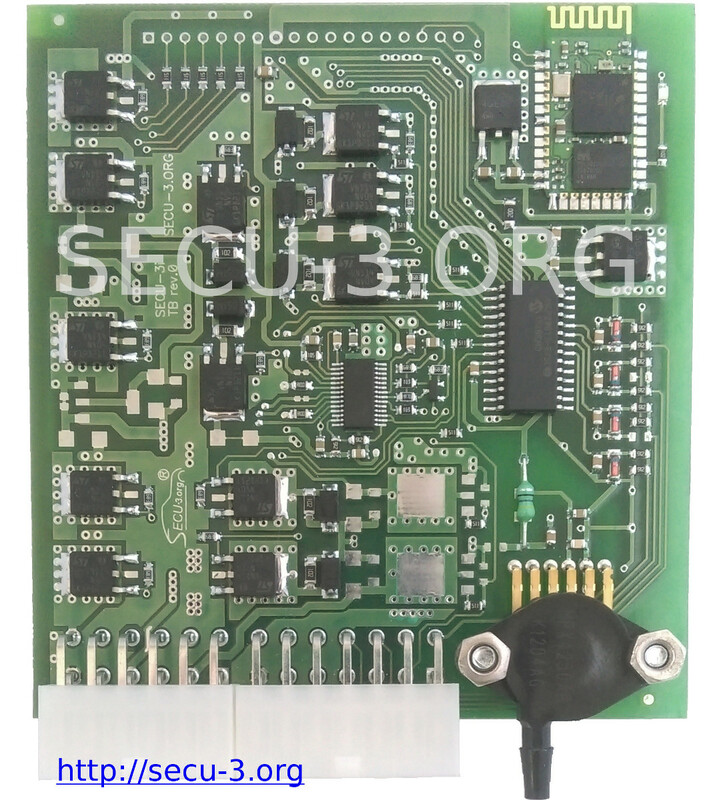 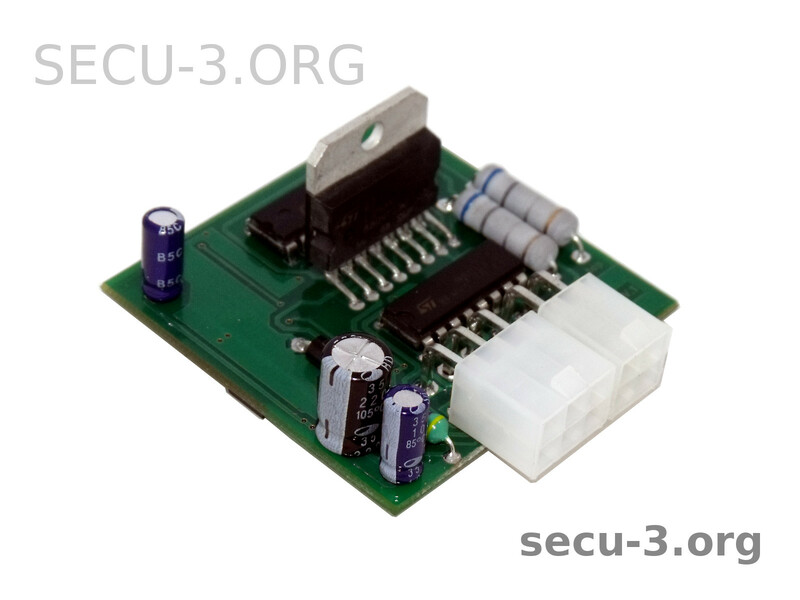 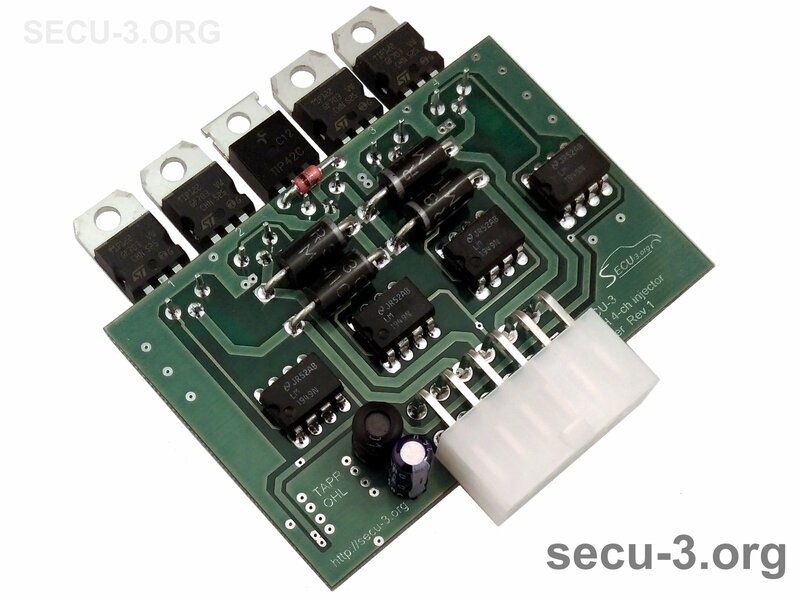 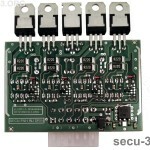 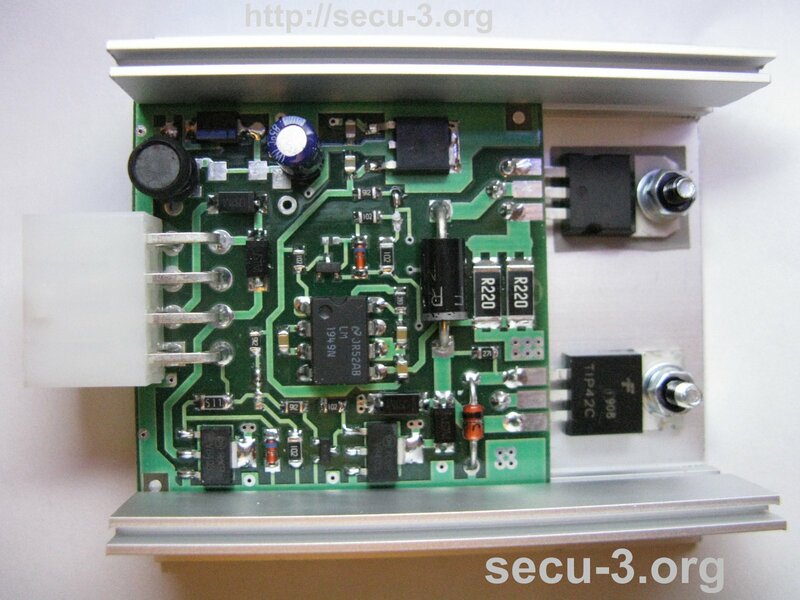 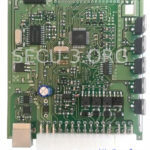 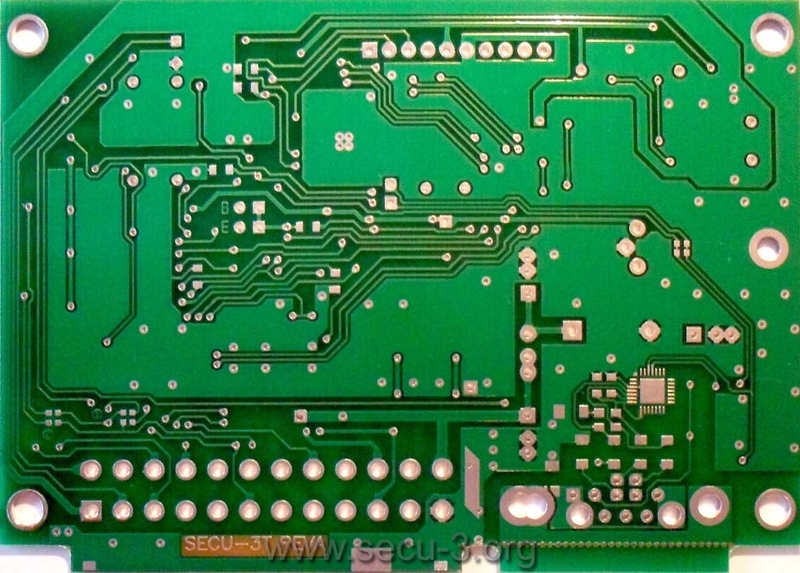 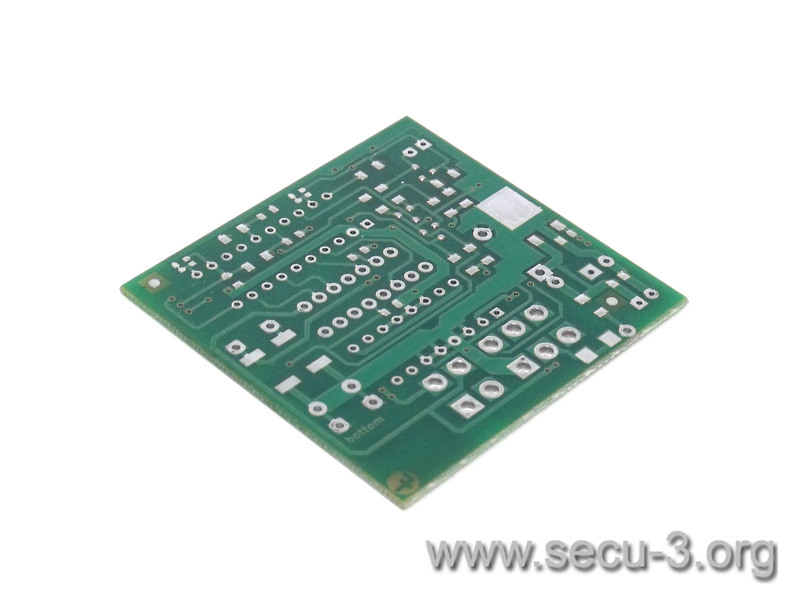 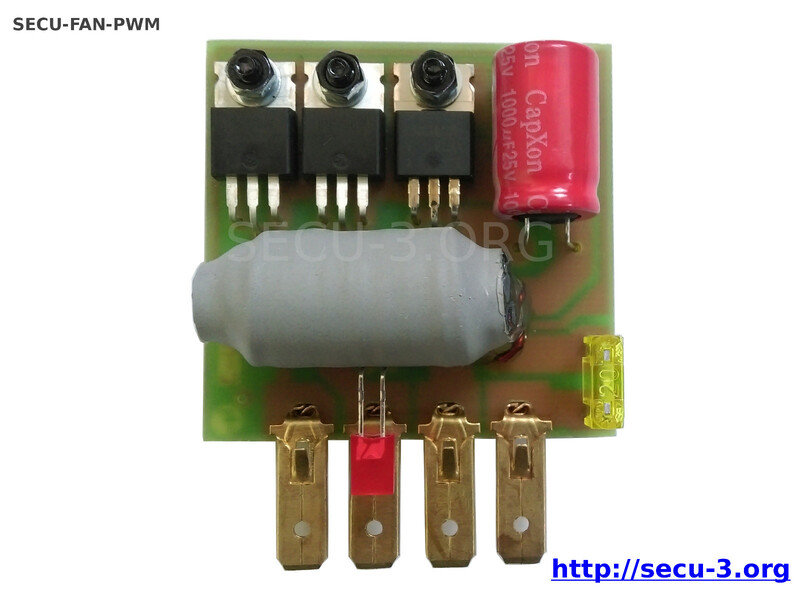 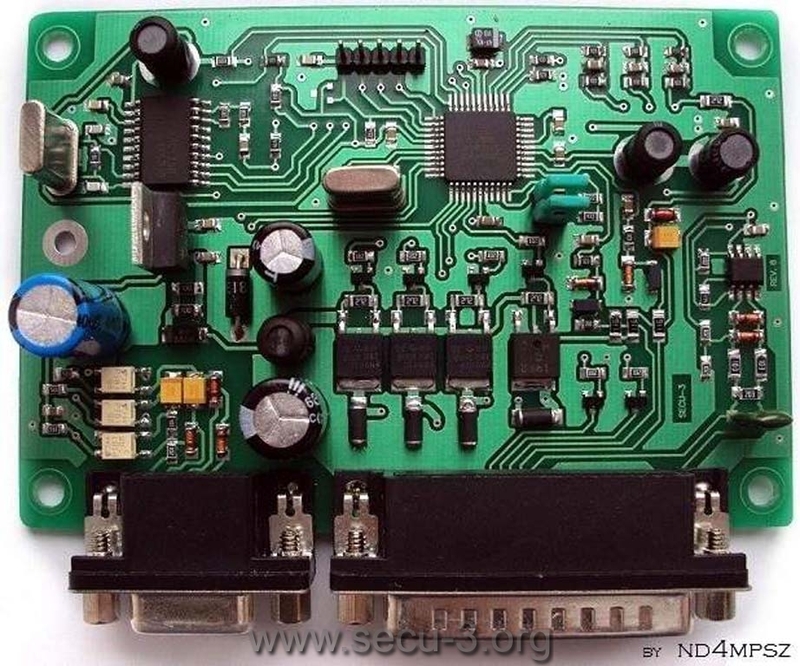 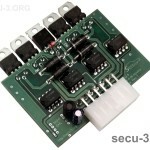 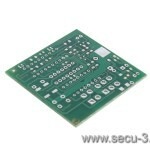 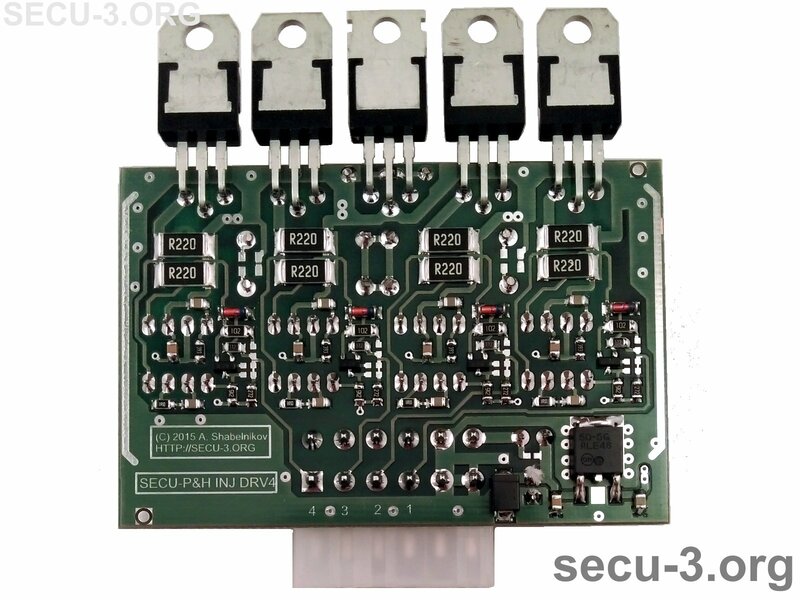 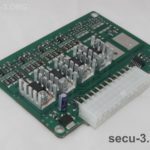 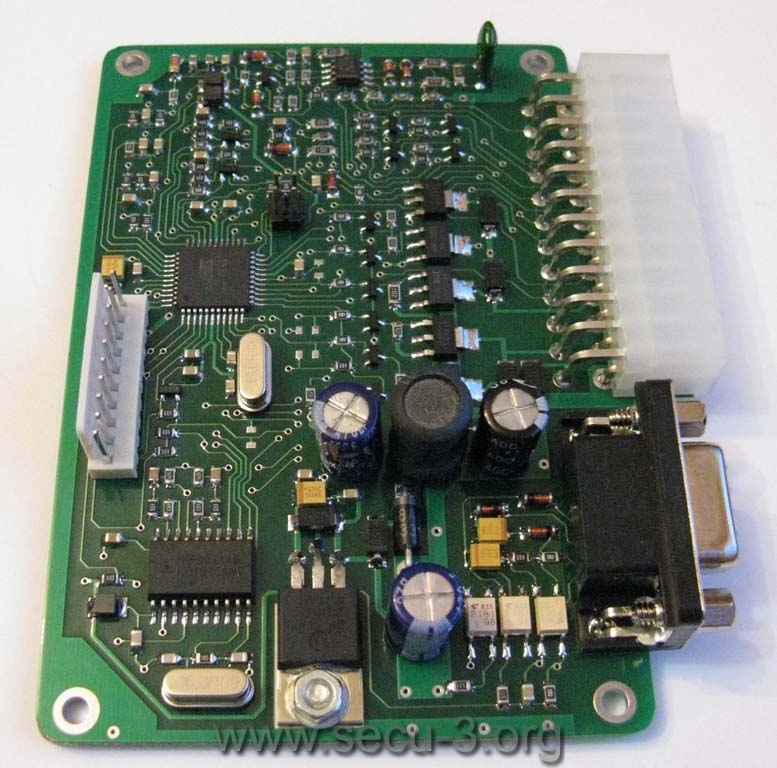 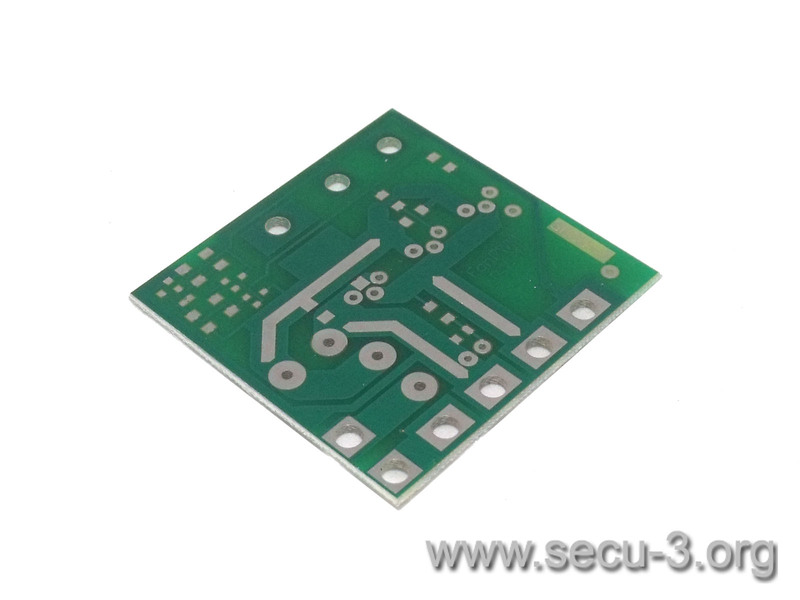 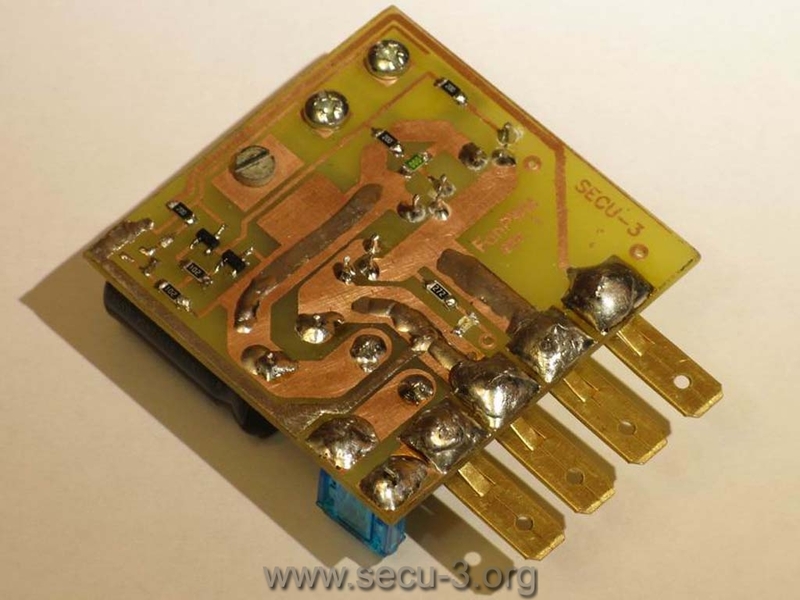 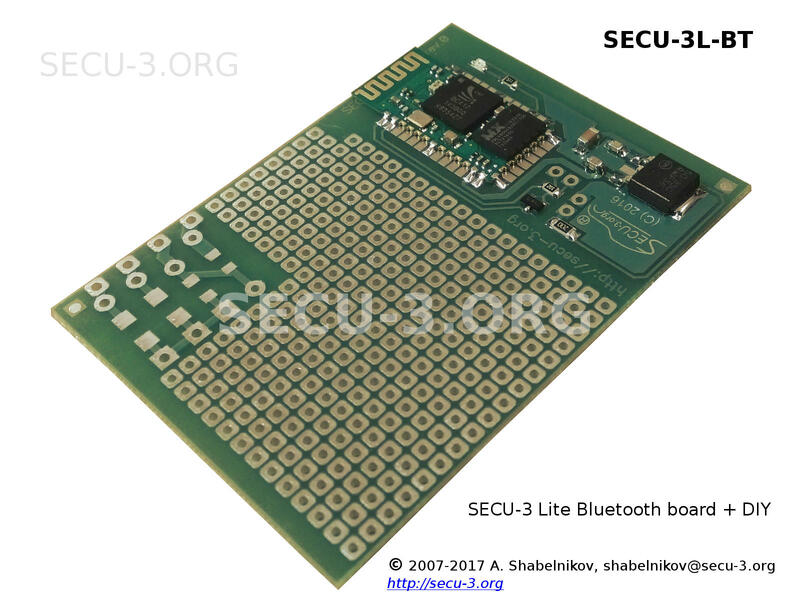 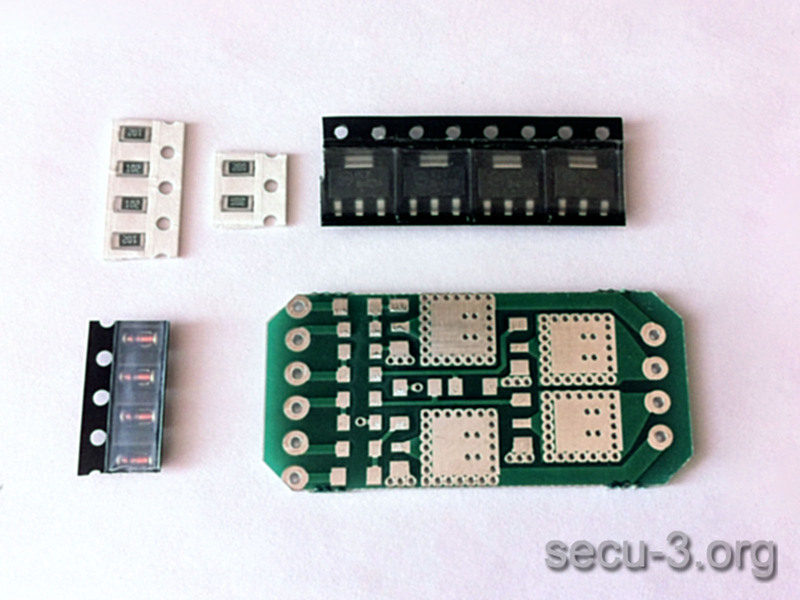 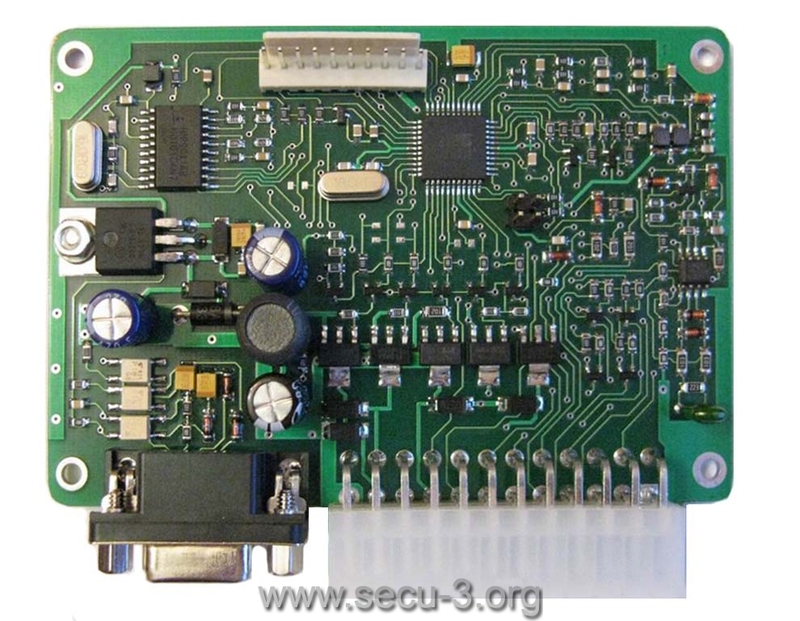 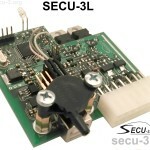 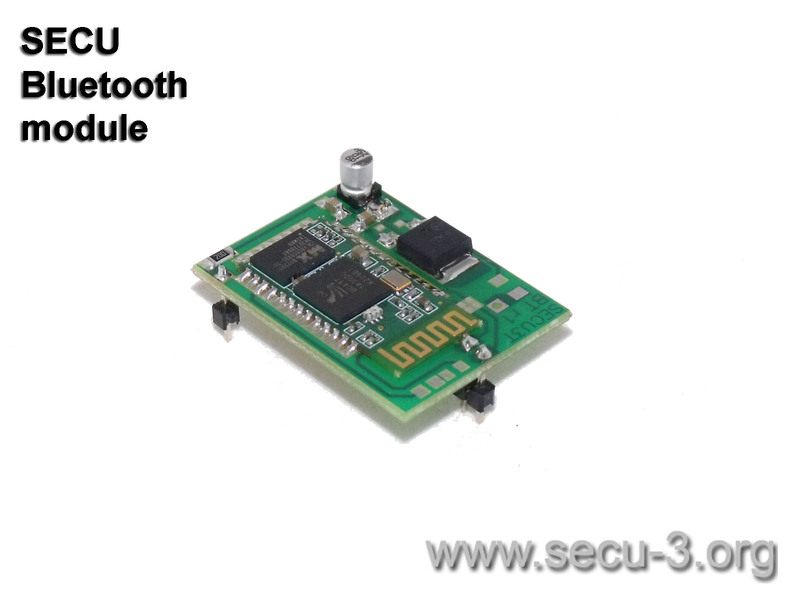 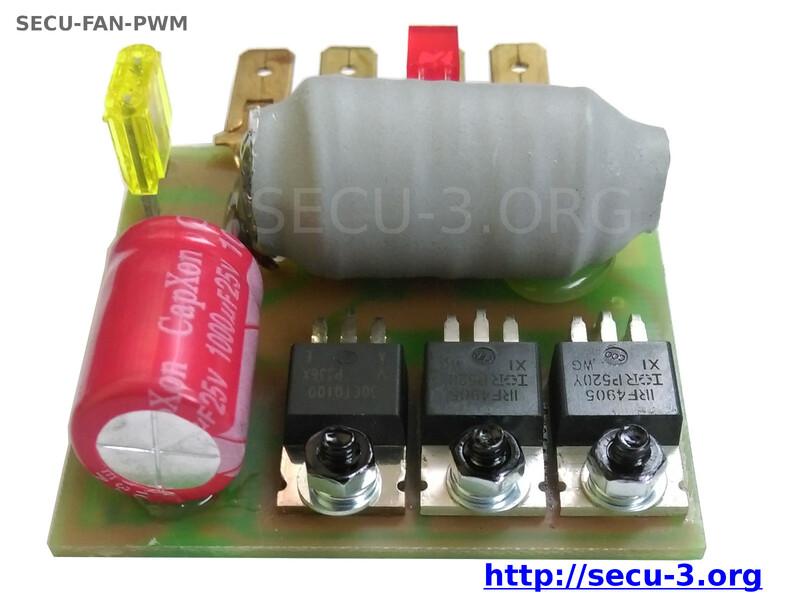 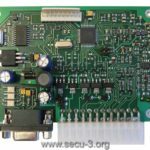 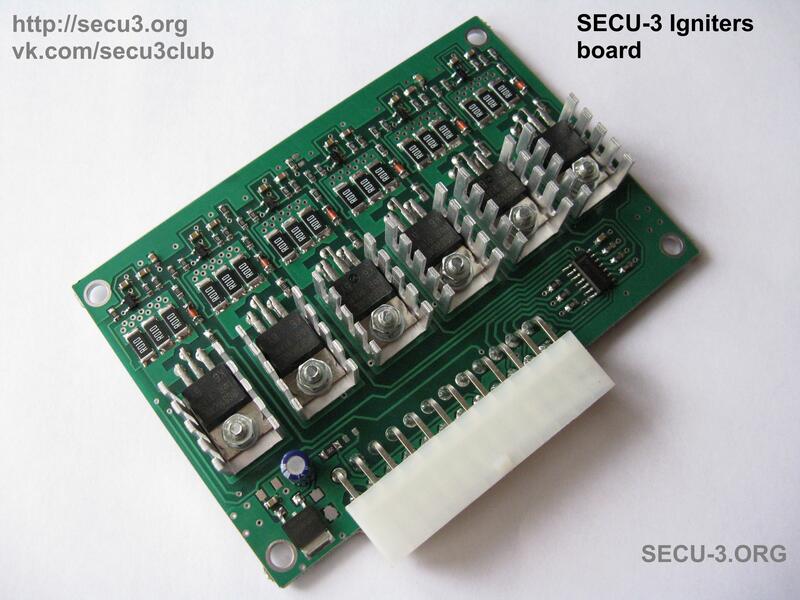 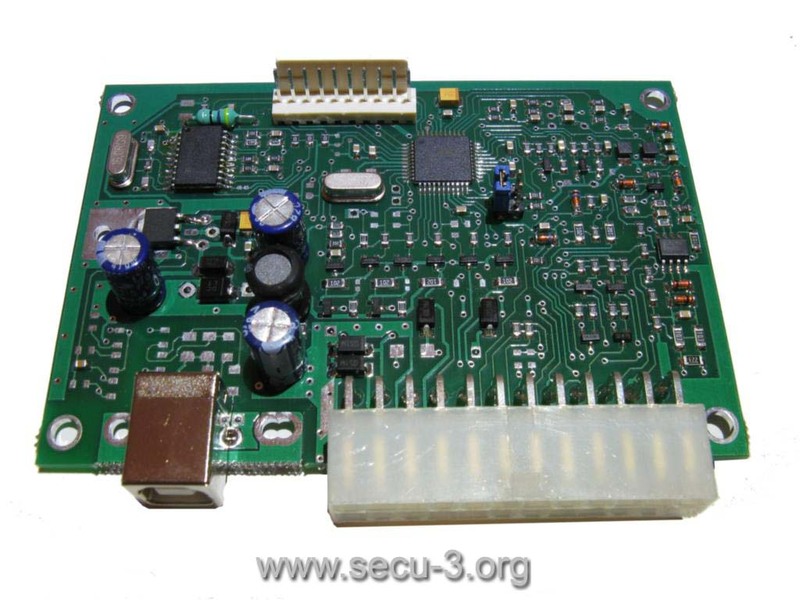 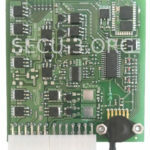 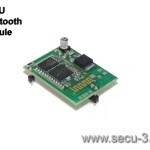 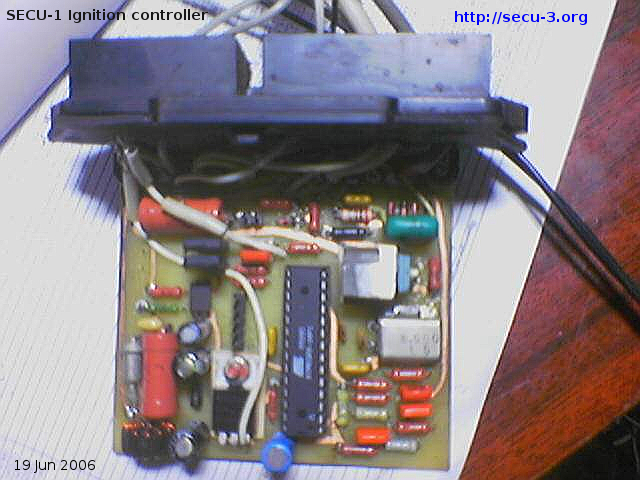 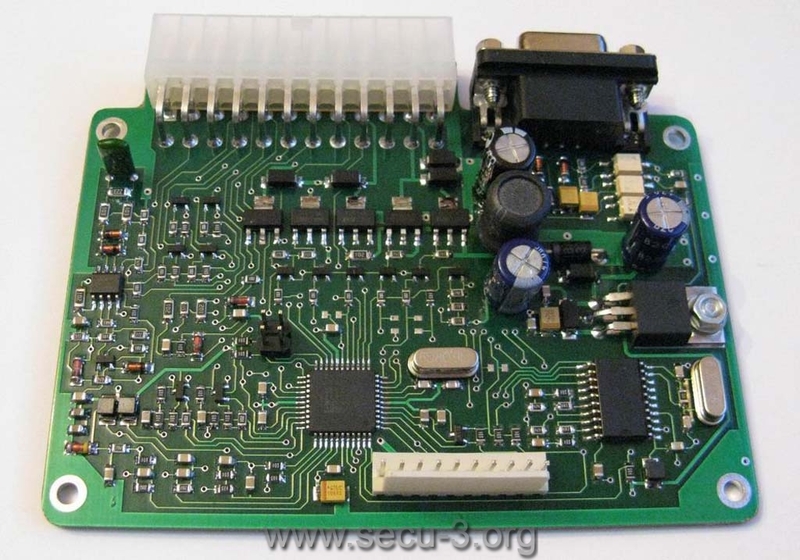 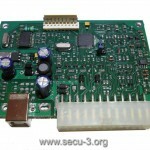 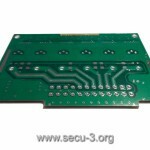 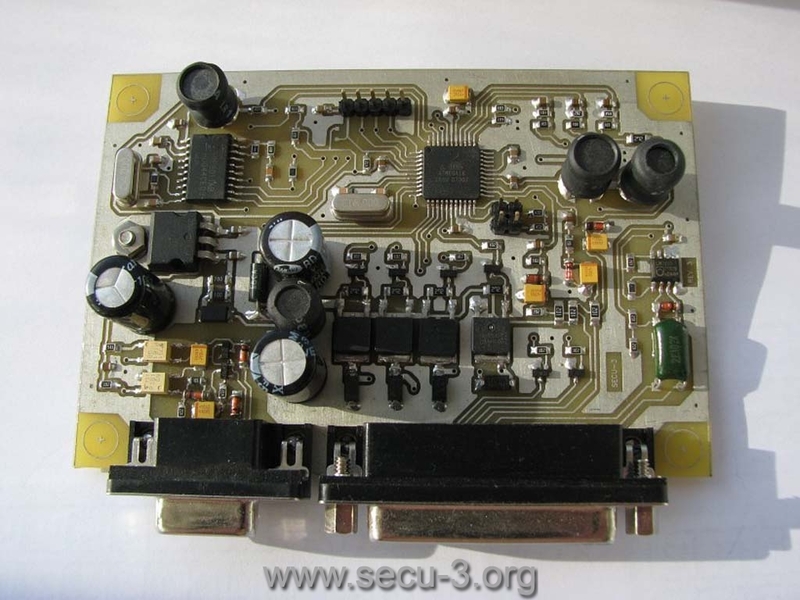 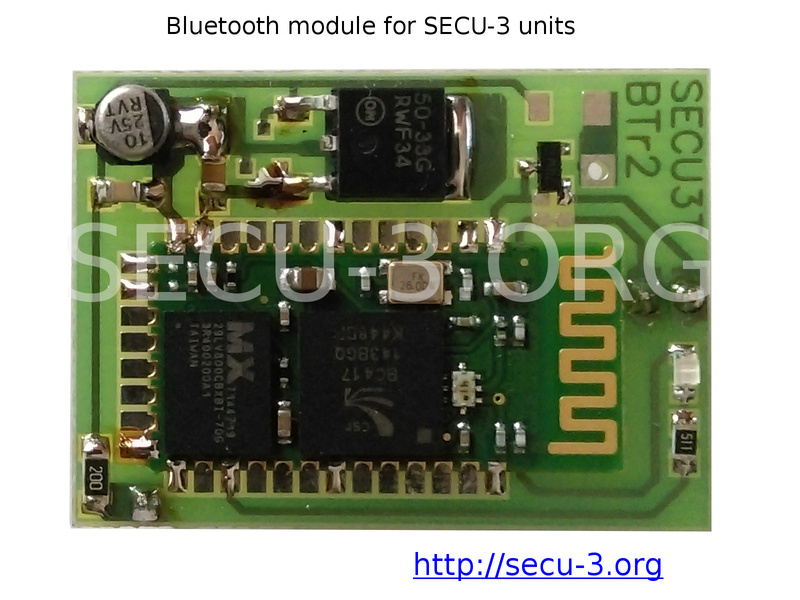 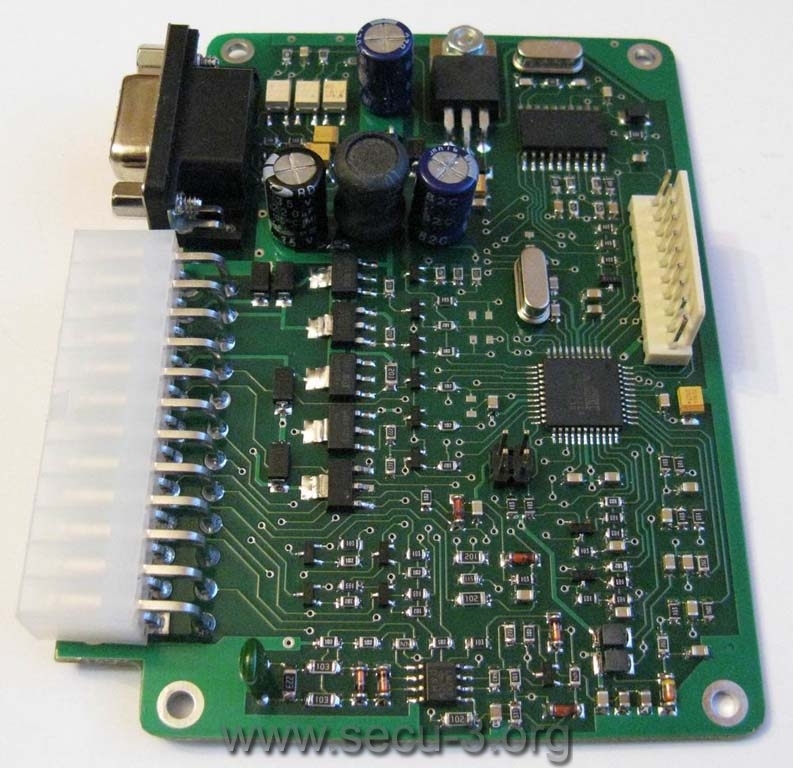 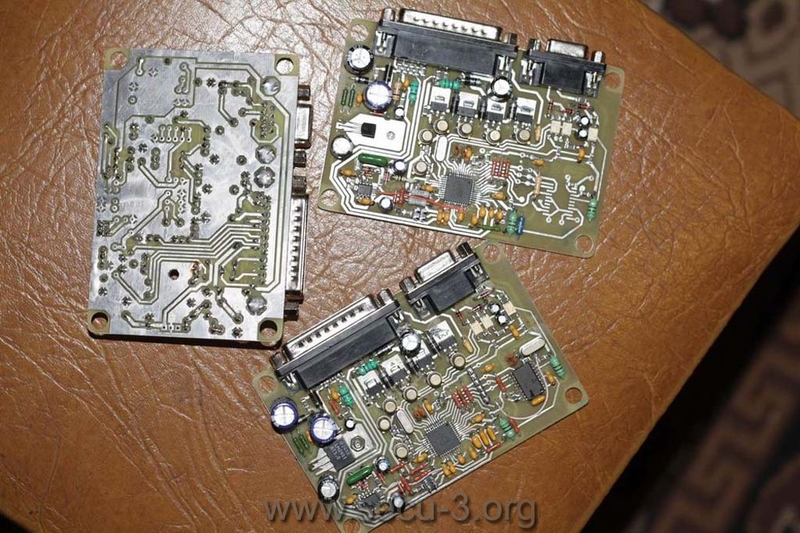 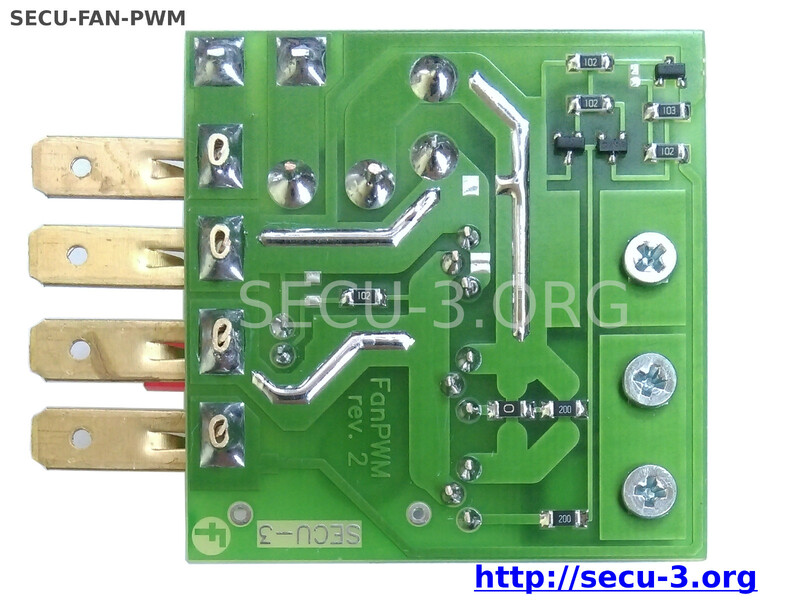 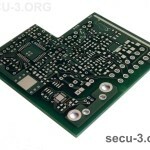 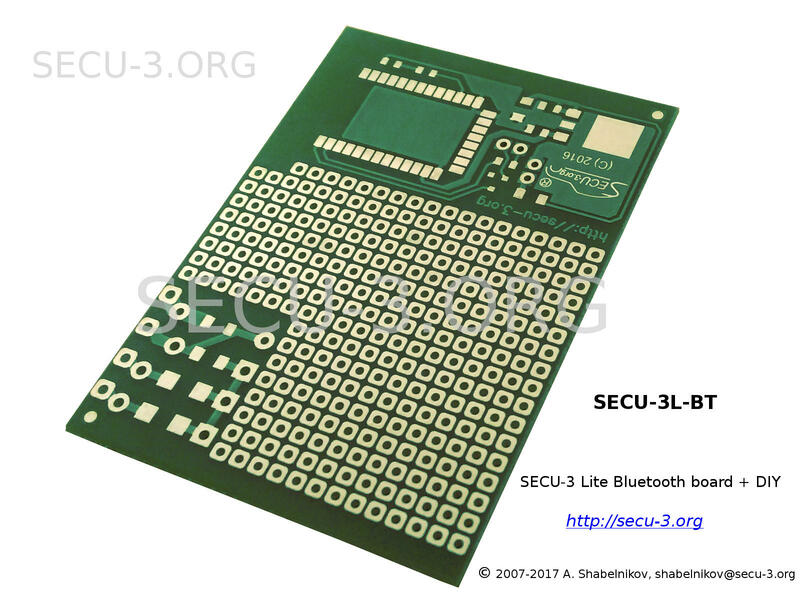 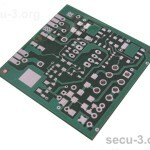 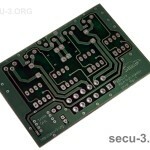 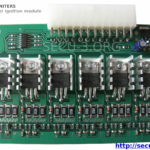 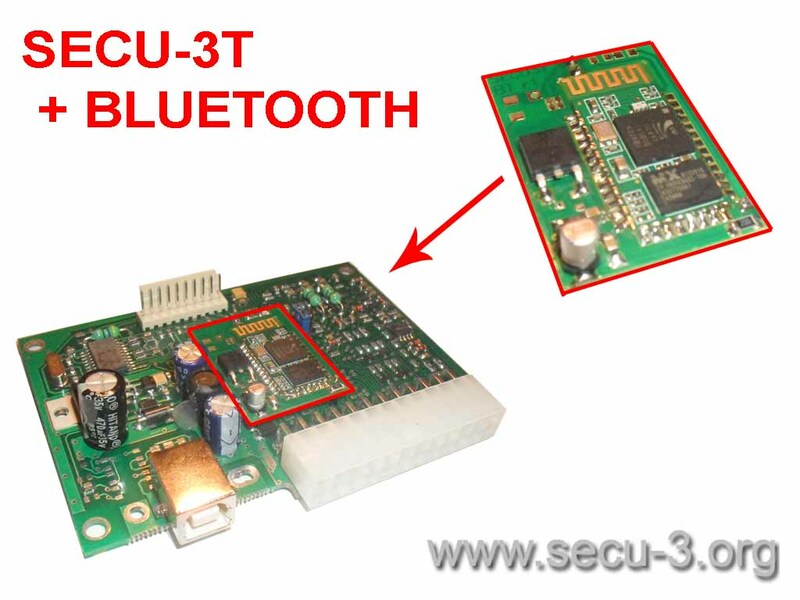 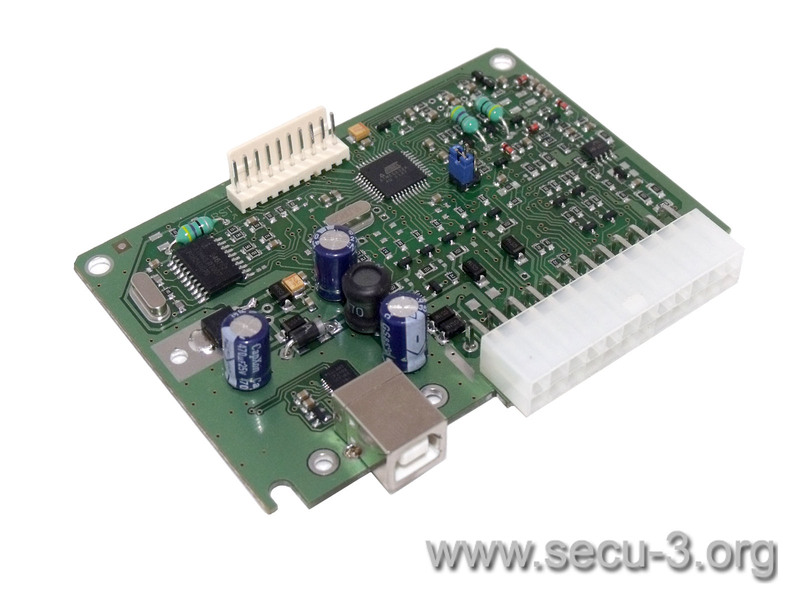 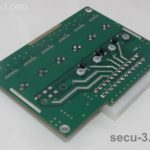 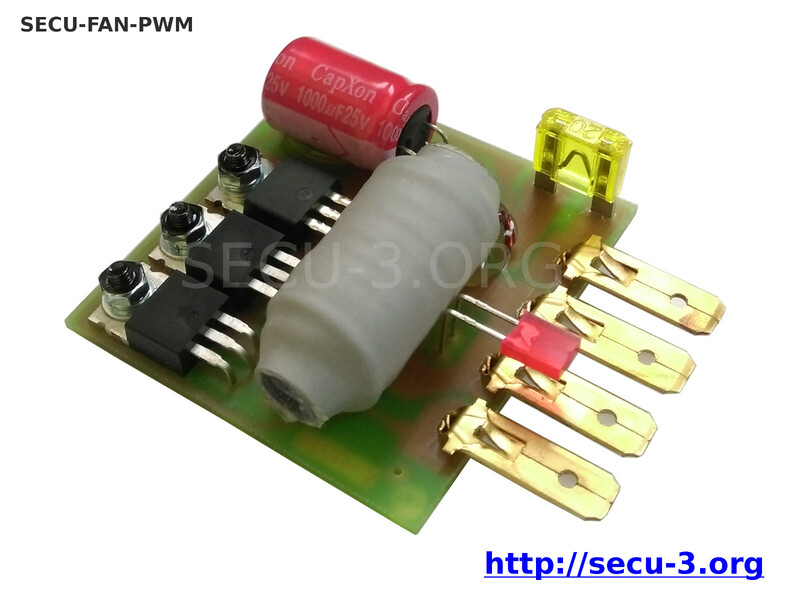 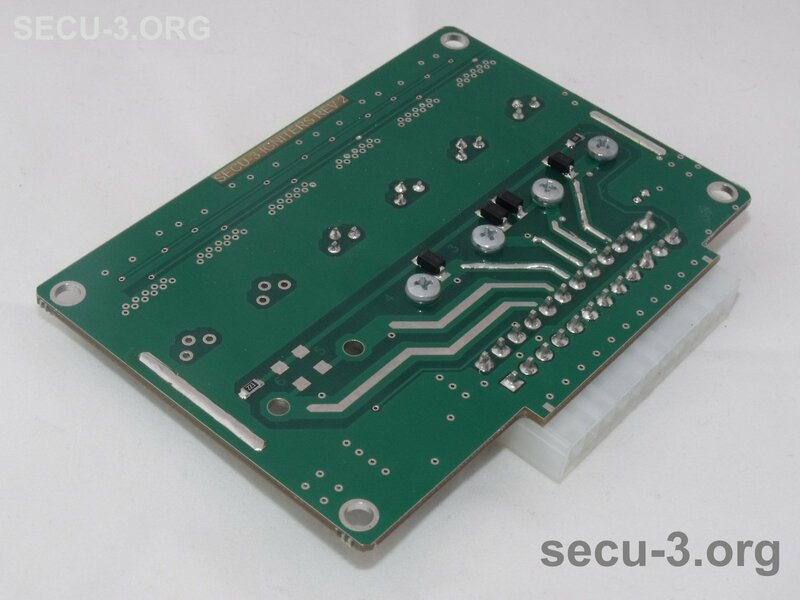 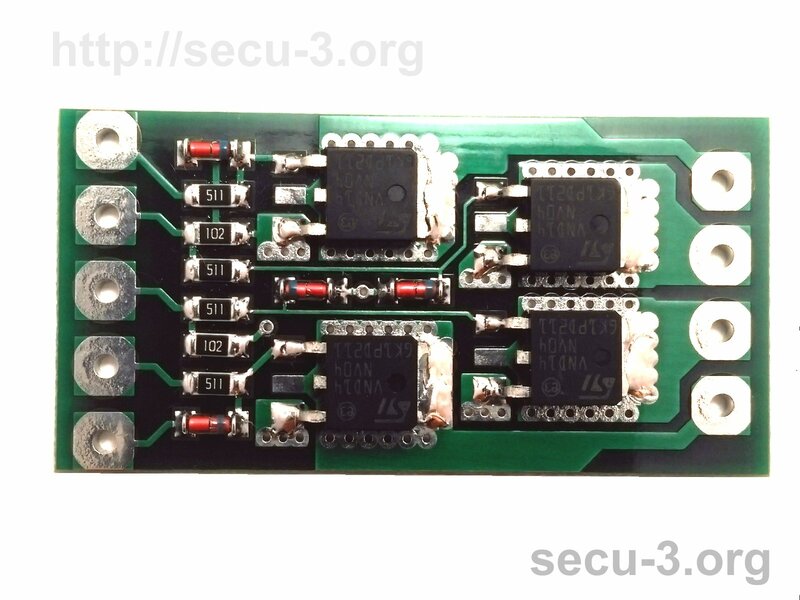 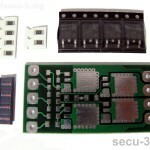 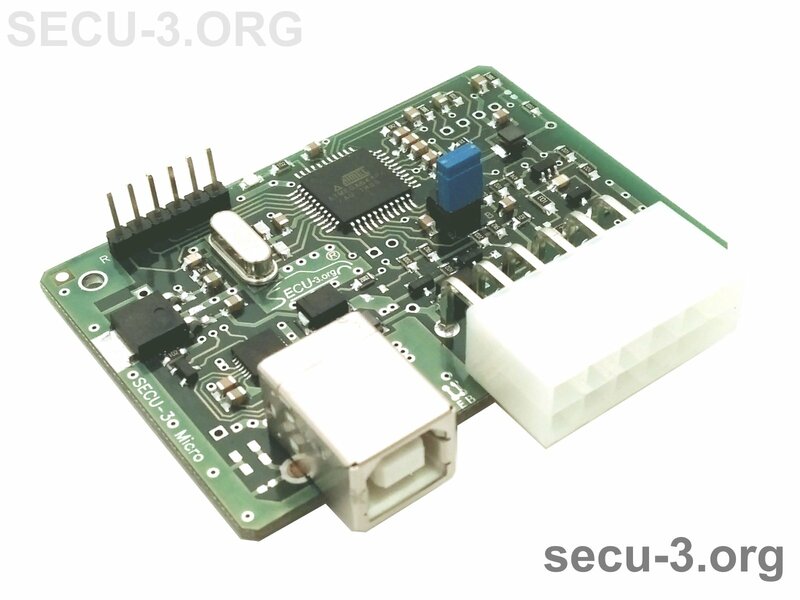 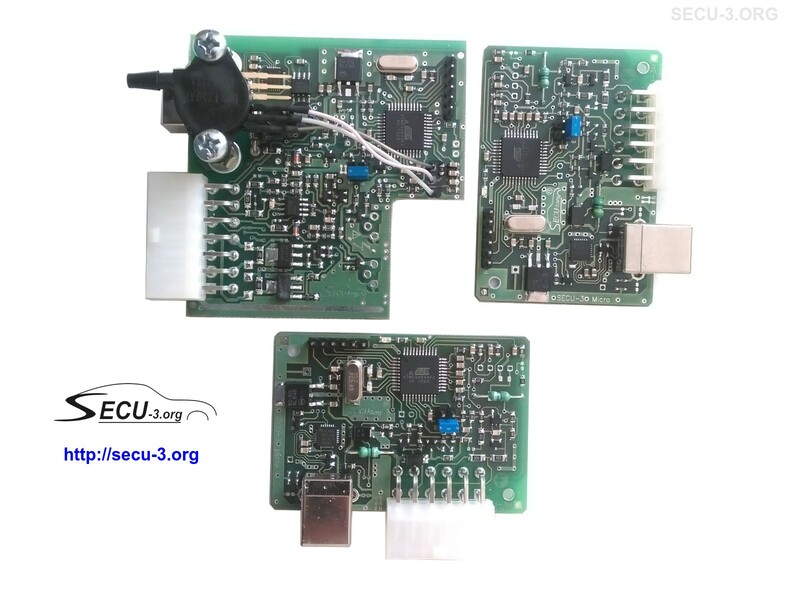 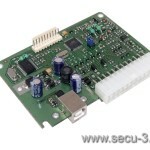 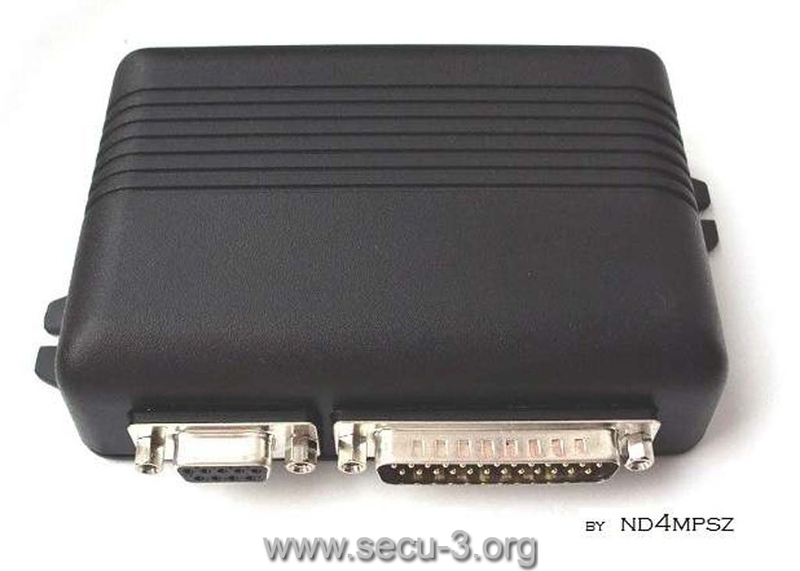 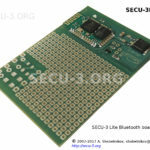 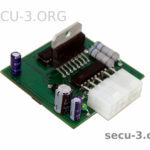 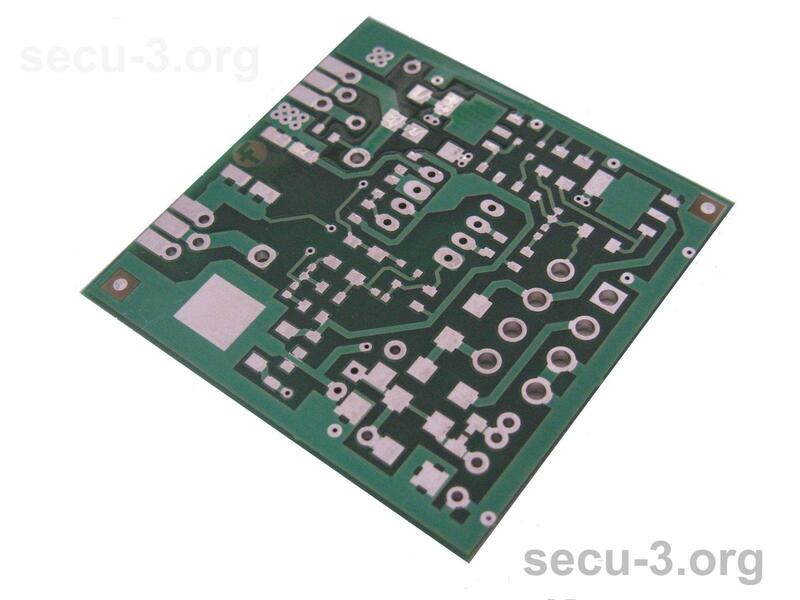 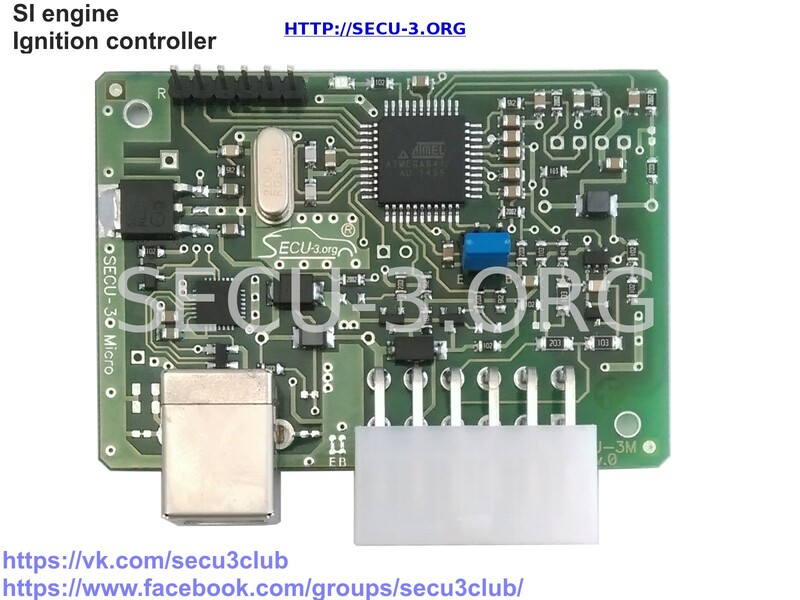 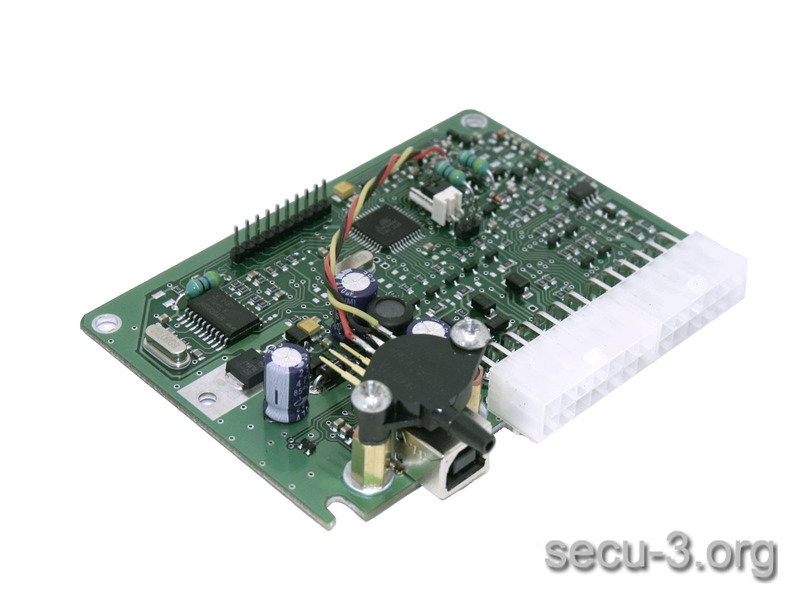 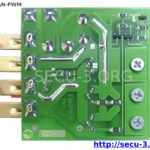 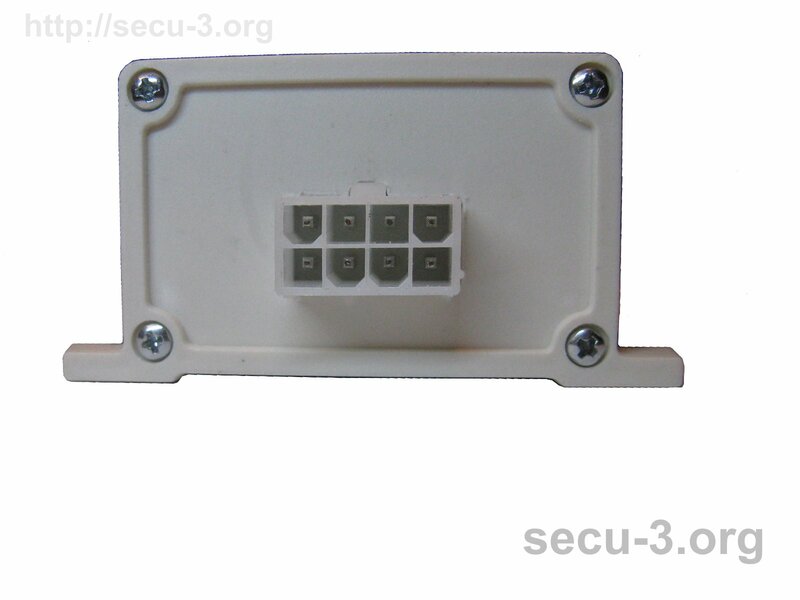 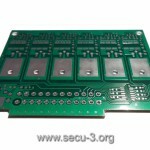 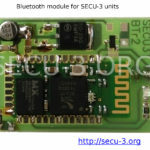 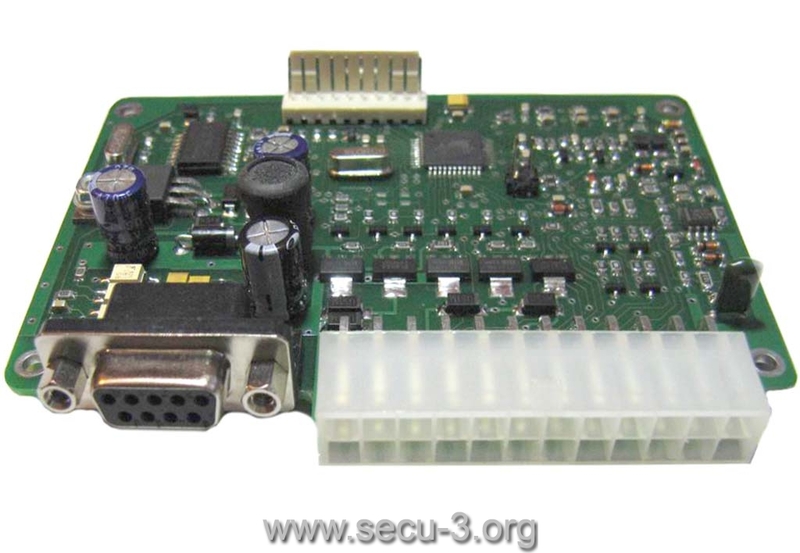 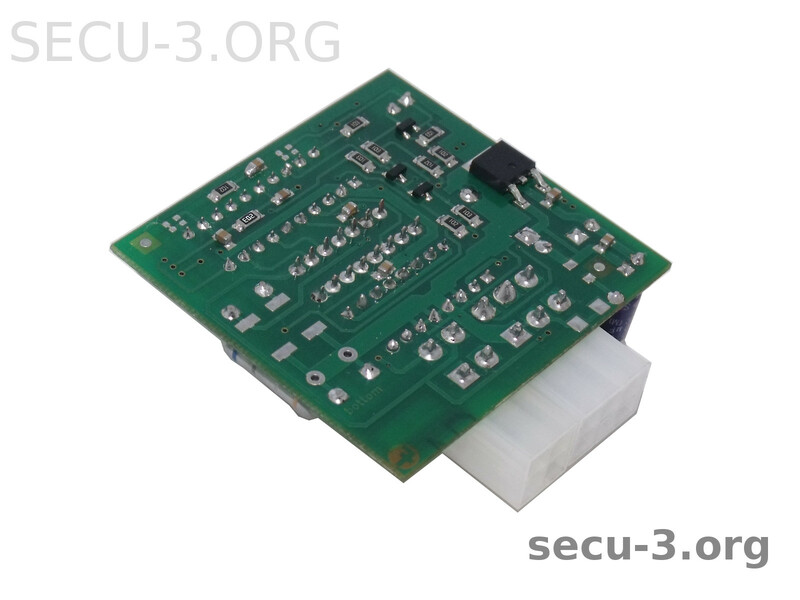 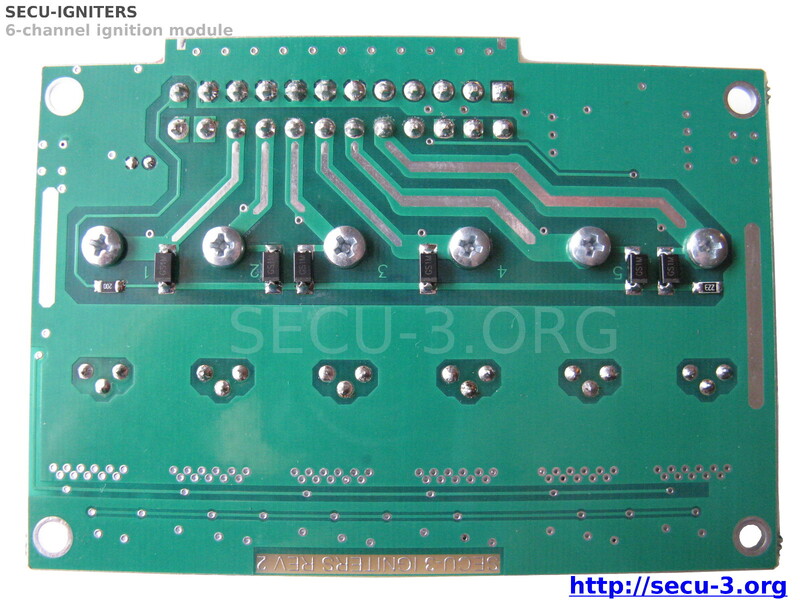 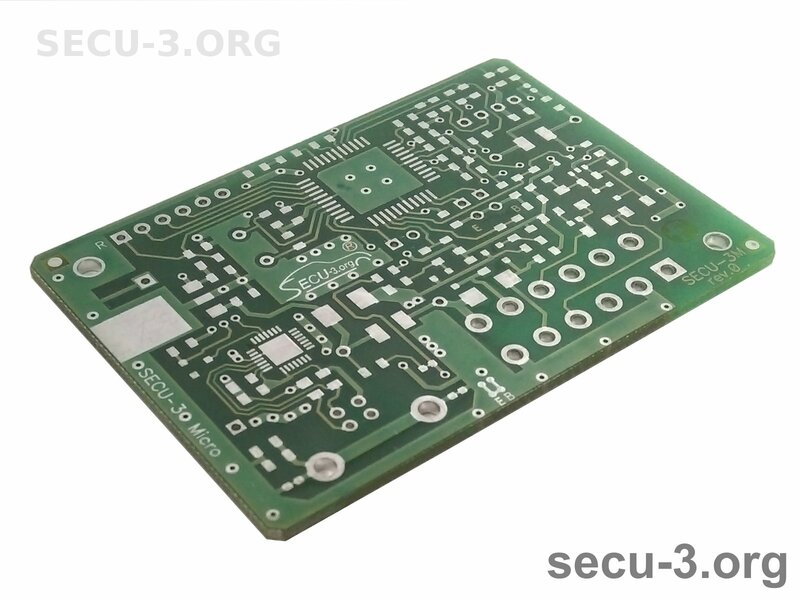 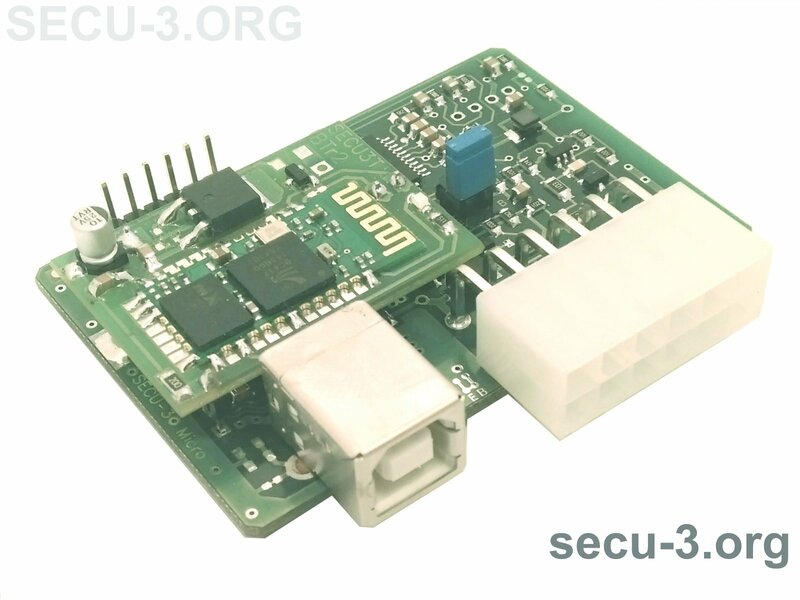 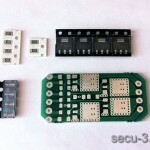 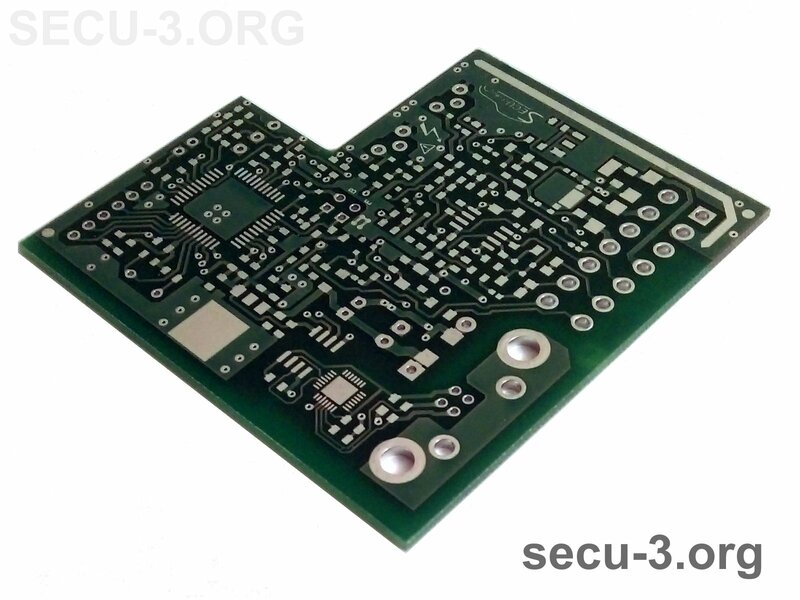 First version of the SECU-3T board, developed in 2011. 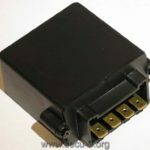 Revision 6. 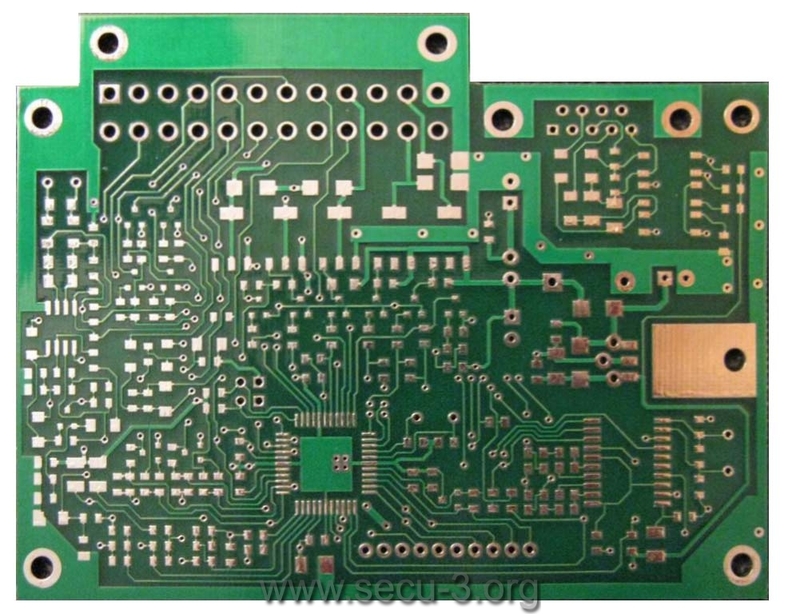 This was followed by board of revisions 9, A, B, C, D. In these revisions big transistors were changed to small and additional space on the PCB was appeared and used for extra components. 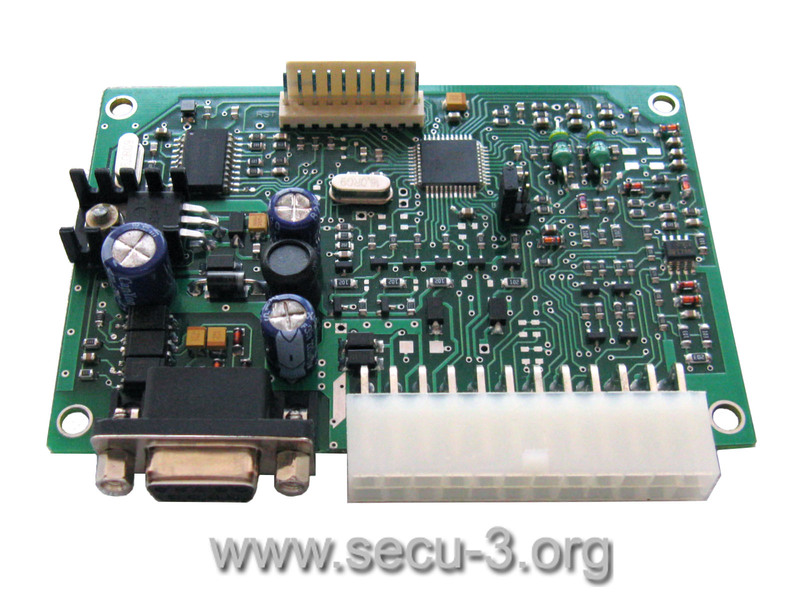 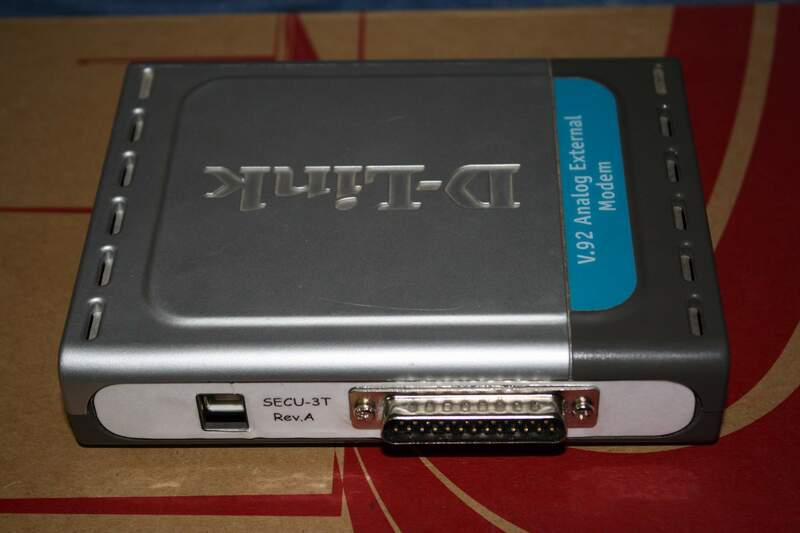 Board of revision A is versatile in terms of interface (RS-232 or USB). 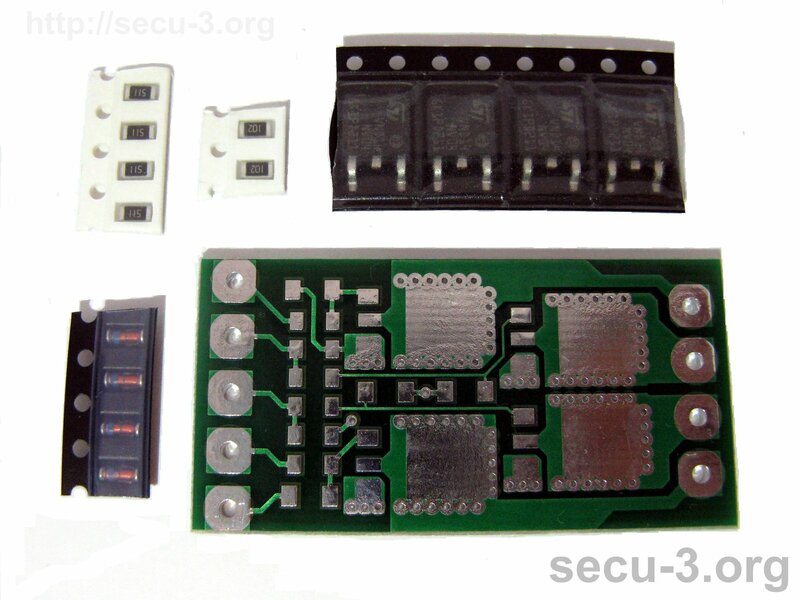 On the top side of board components for RS-232 interface provided, while on the bottom side are components for USB interface. 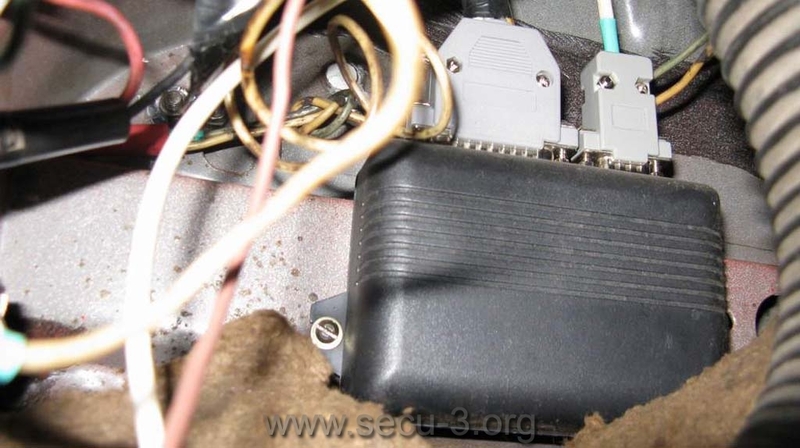 Starting from revision C, two connectors with 14 and 12 pins were used instead of single 24-pin connector, because of this, inputs of the second VR sensor were put into separate connector pins (split from 3 and 4 ignition outputs). 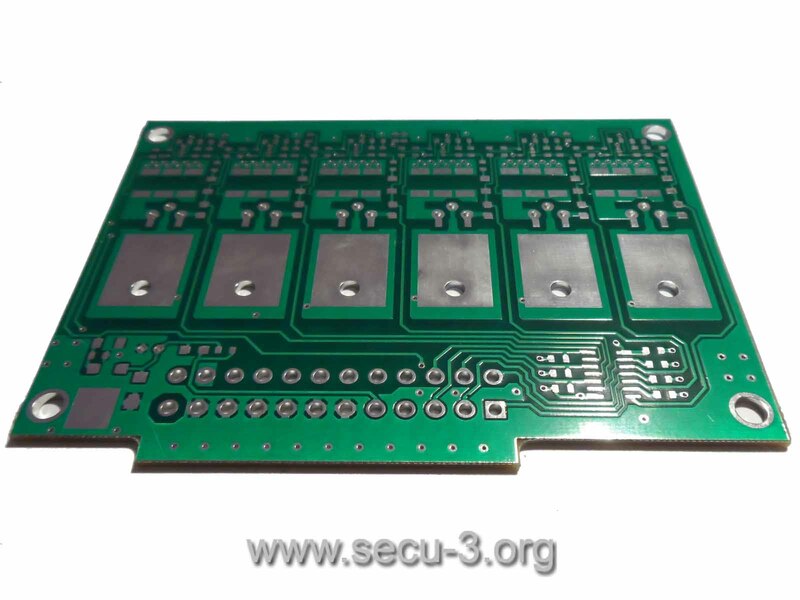 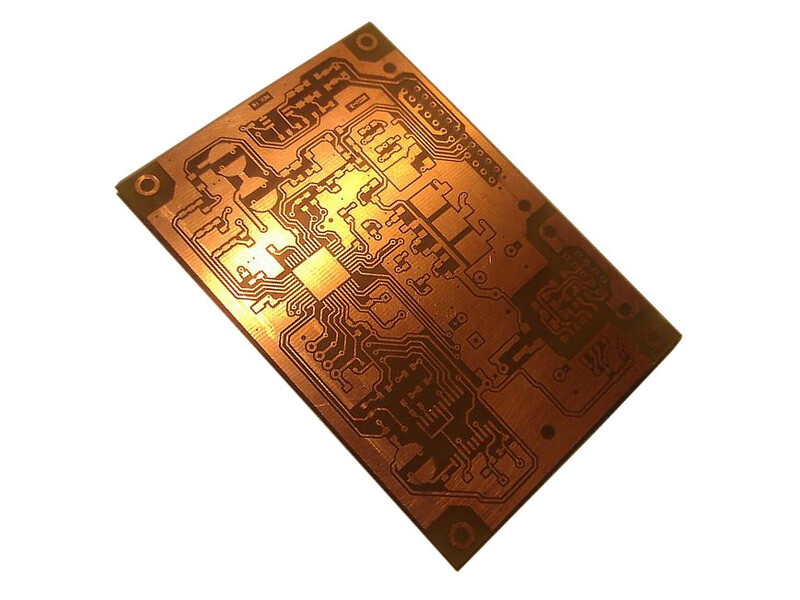 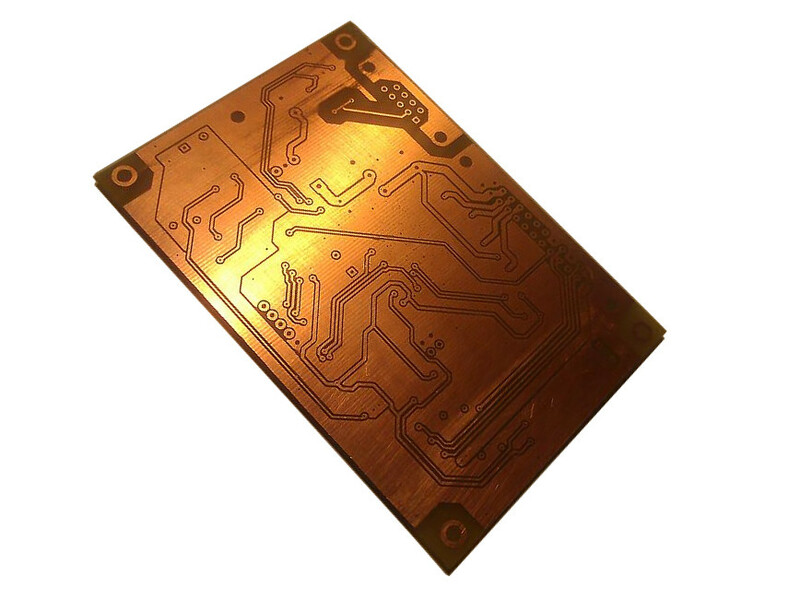 In spring 2015 schematic diagram was developed and in summer PCB drawing was already finished and sent to a production. 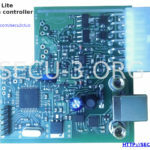 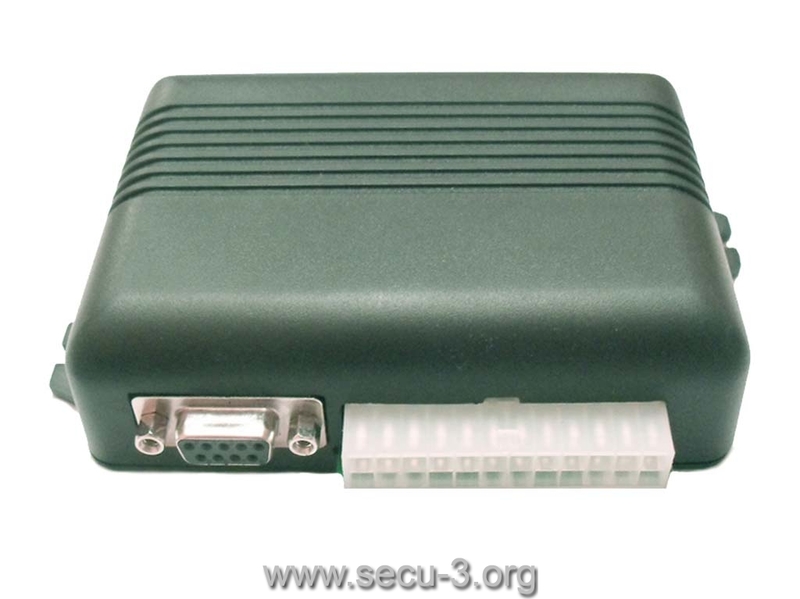 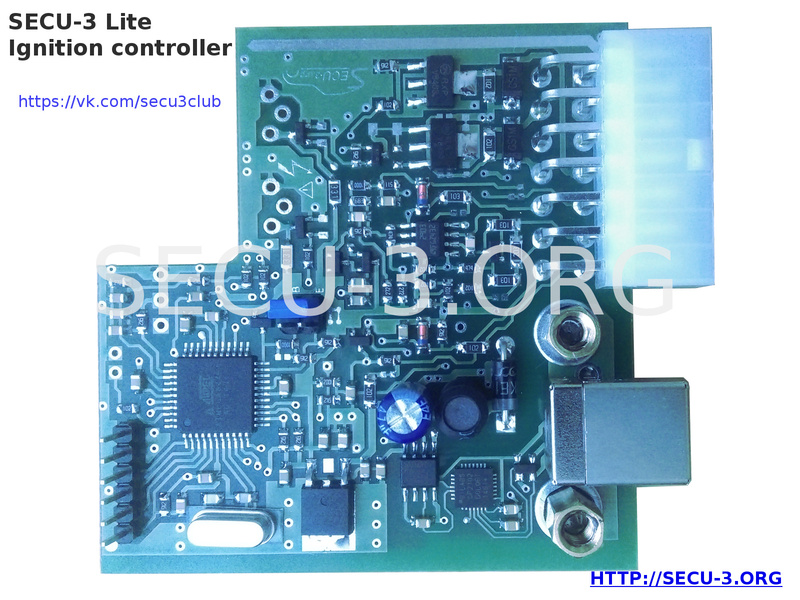 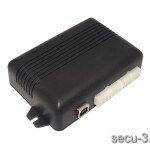 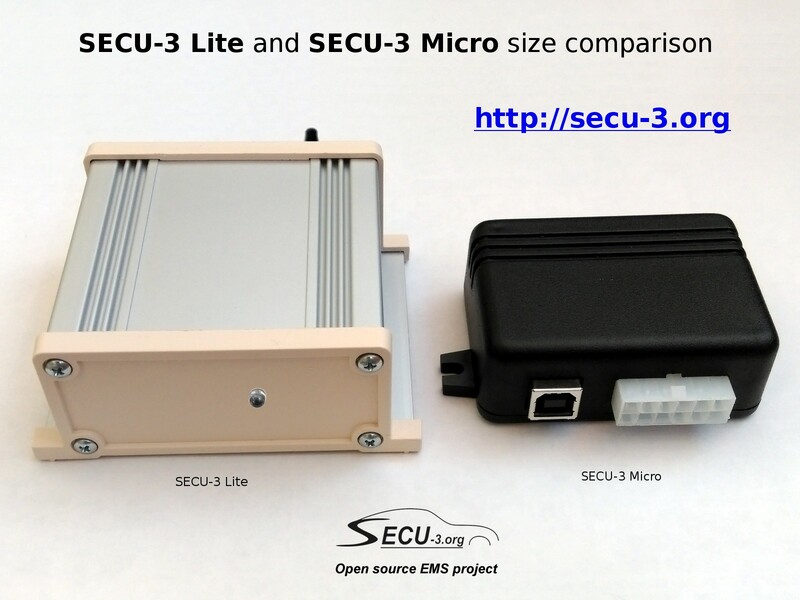 As a result, SECU-3 Lite unit appeared soon. 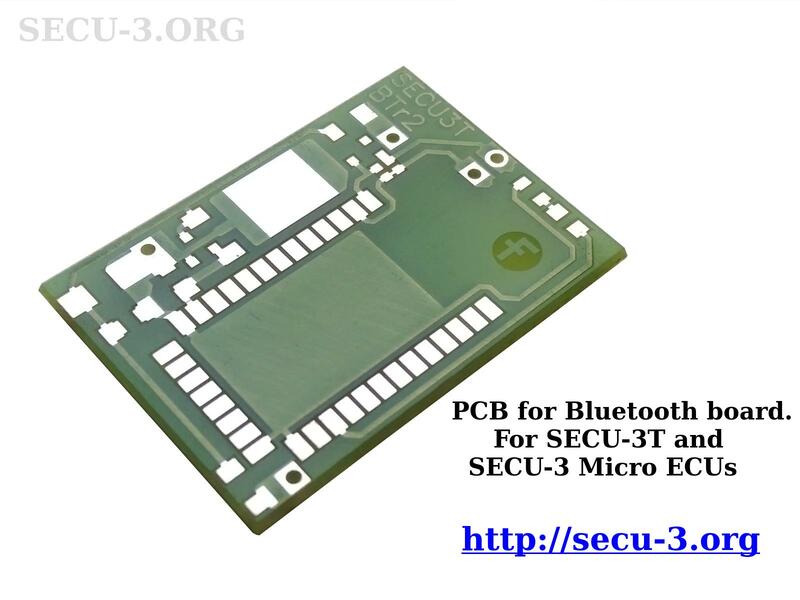 It is externally and internally totally different from its predecessors, however, it is both simplified and modified version of the SECU-3T. 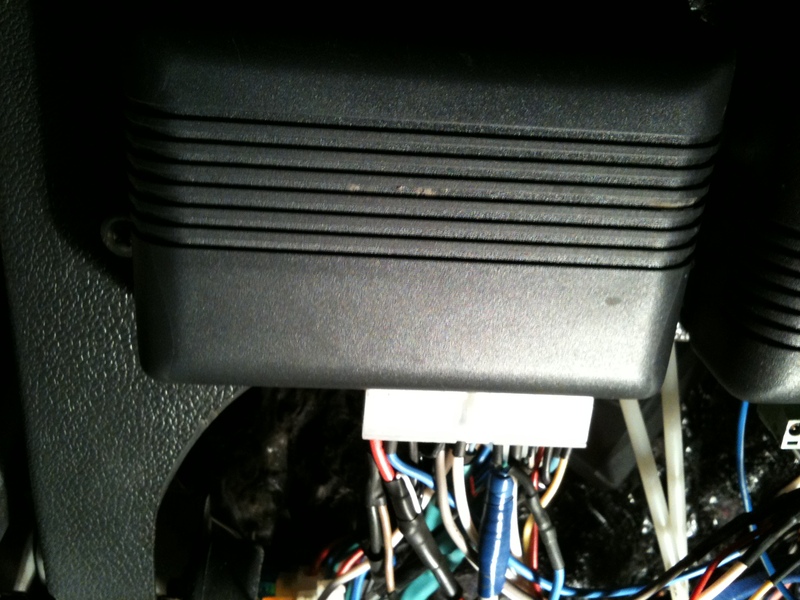 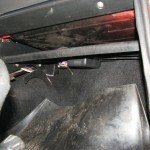 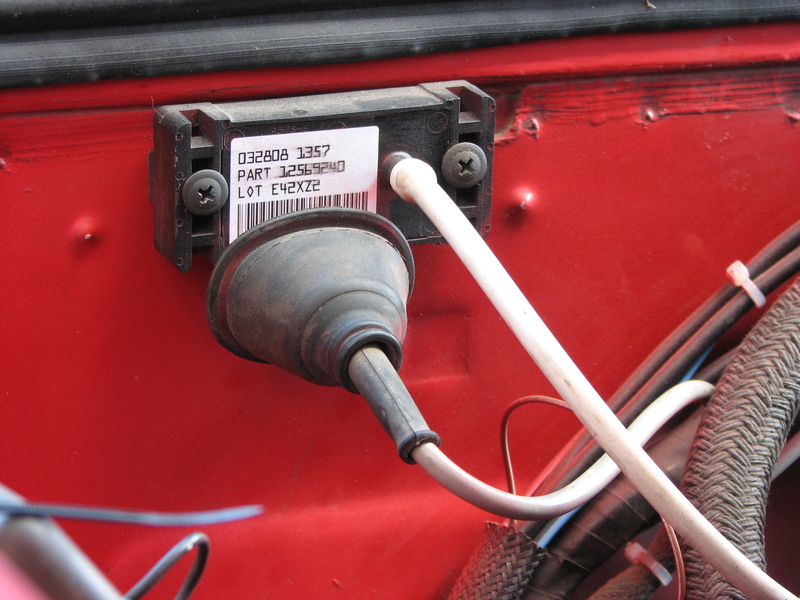 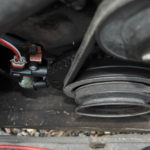 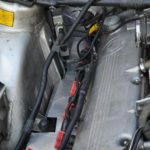 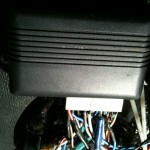 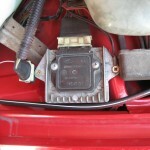 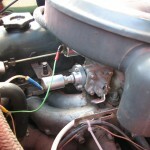 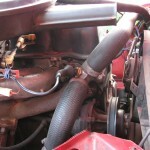 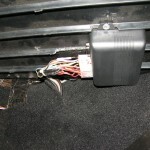 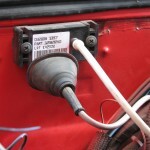 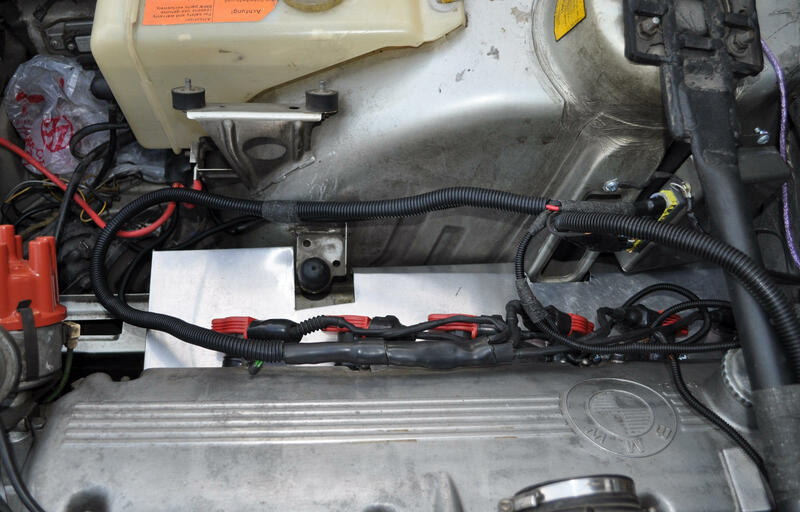 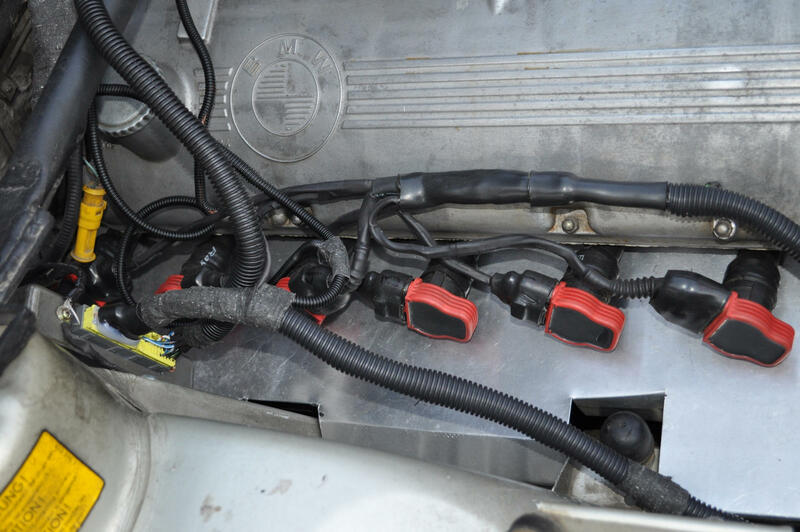 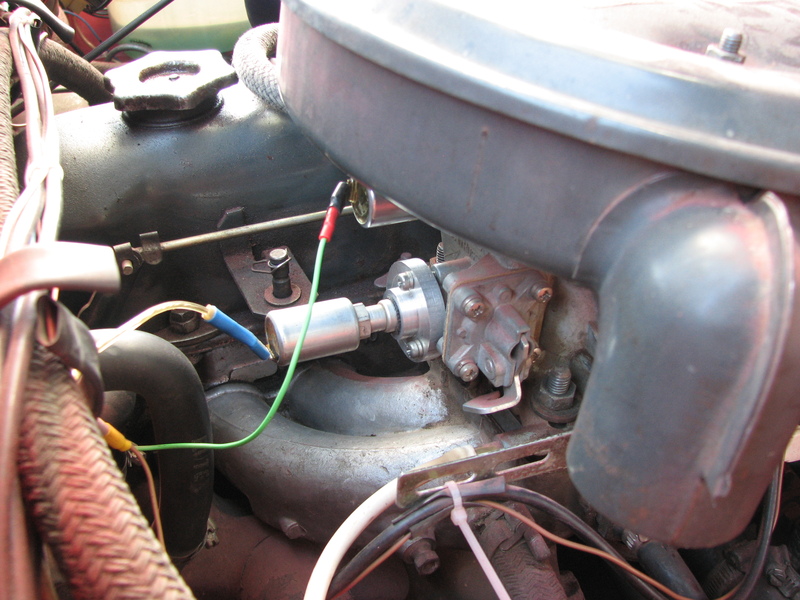 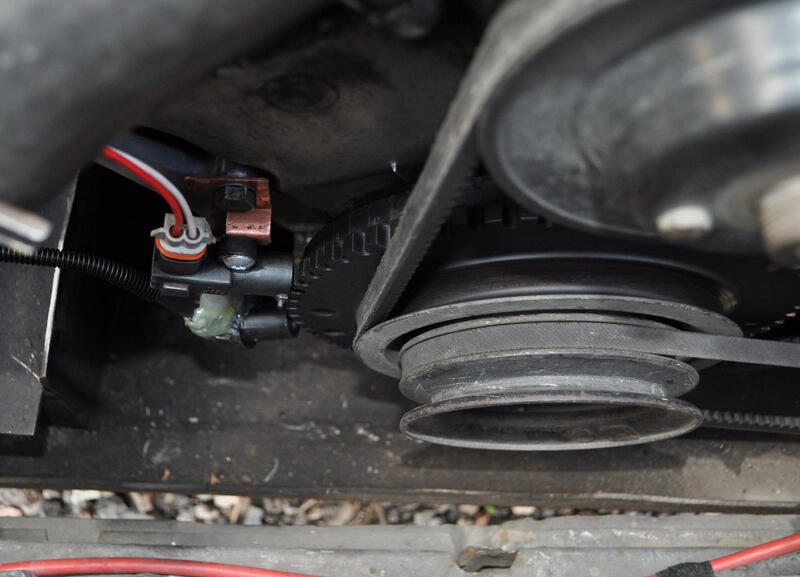 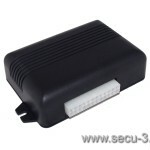 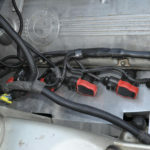 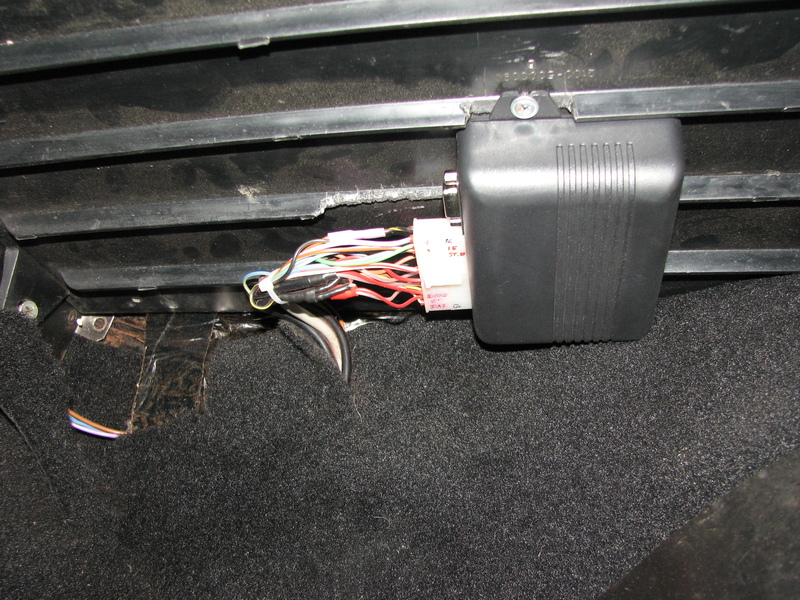 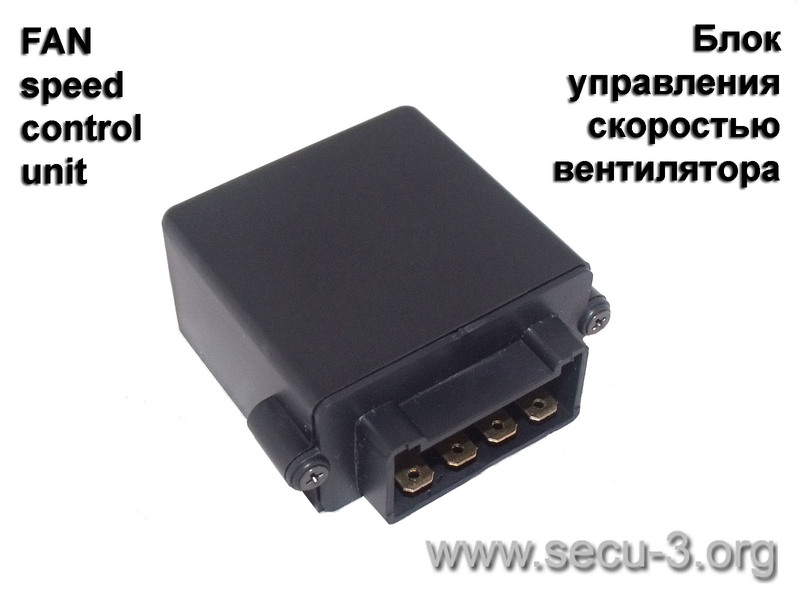 The main and important difference – built-in drivers for ignition coils and electrical isolation of the USB interface. 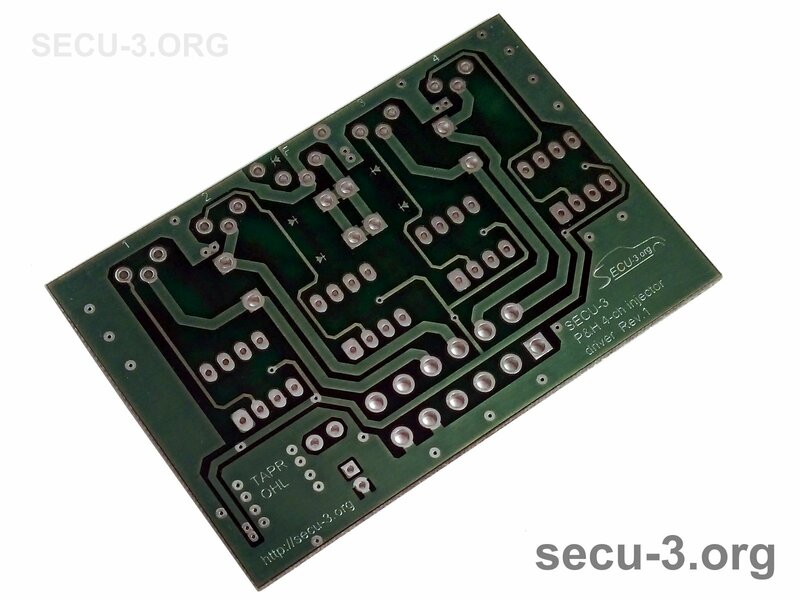 In autumn 2015, development of schematic diagrams simultaneously of two units was started – SECU-3 Micro and SECU-3i. 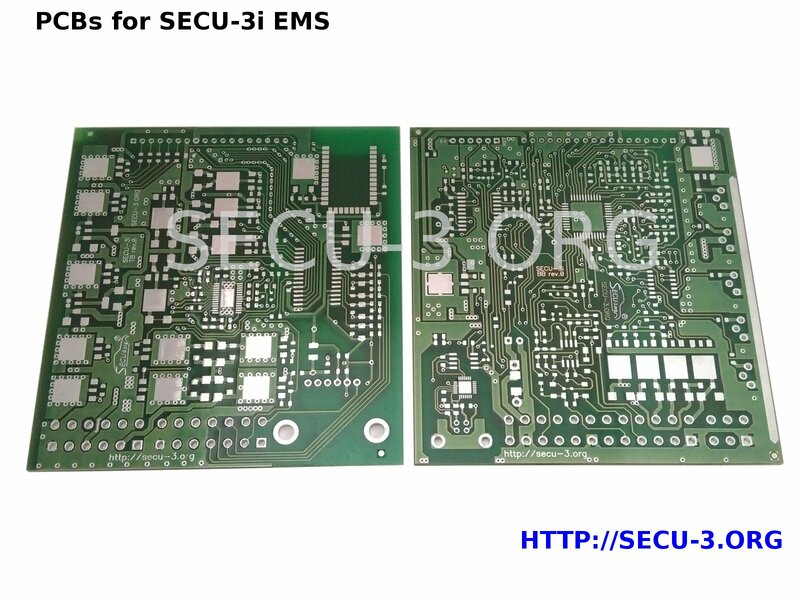 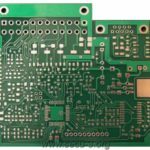 Soon, schematic diagrams were finished and in winter 2015-2016 drawings of PCBs for these units were developed. 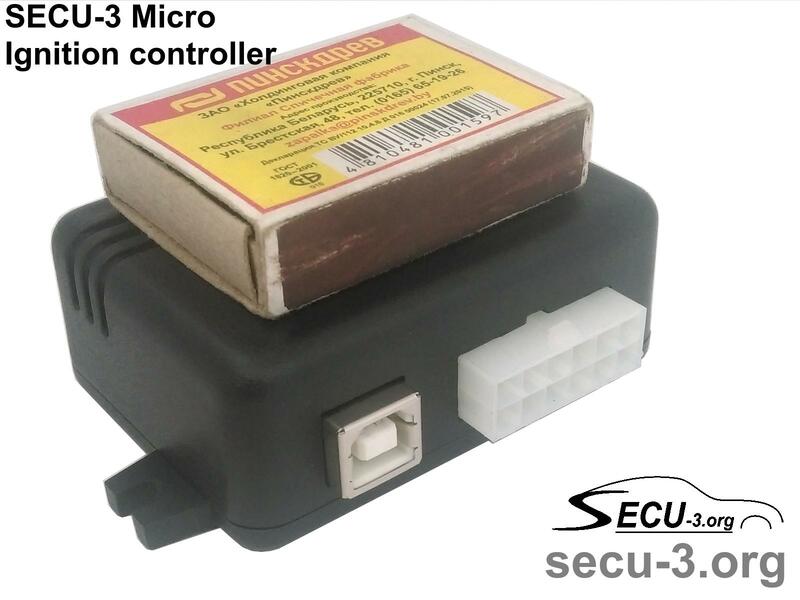 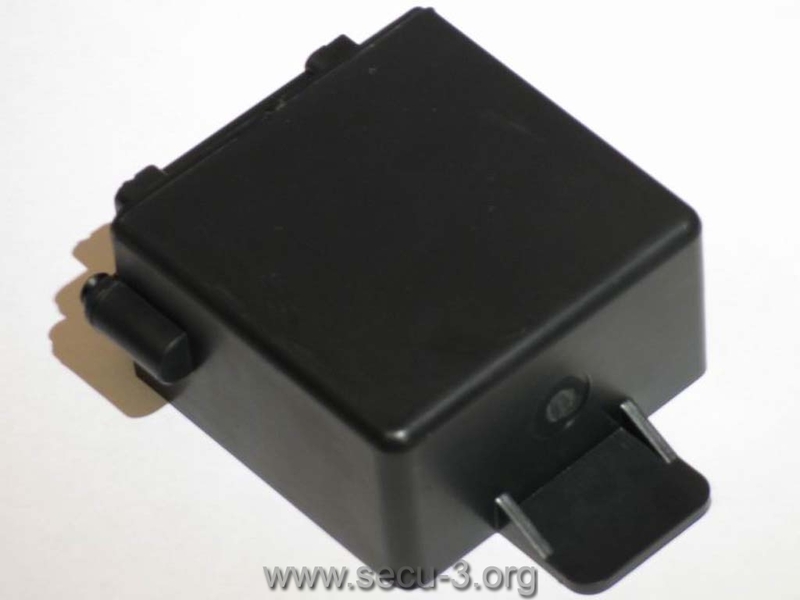 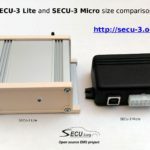 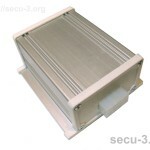 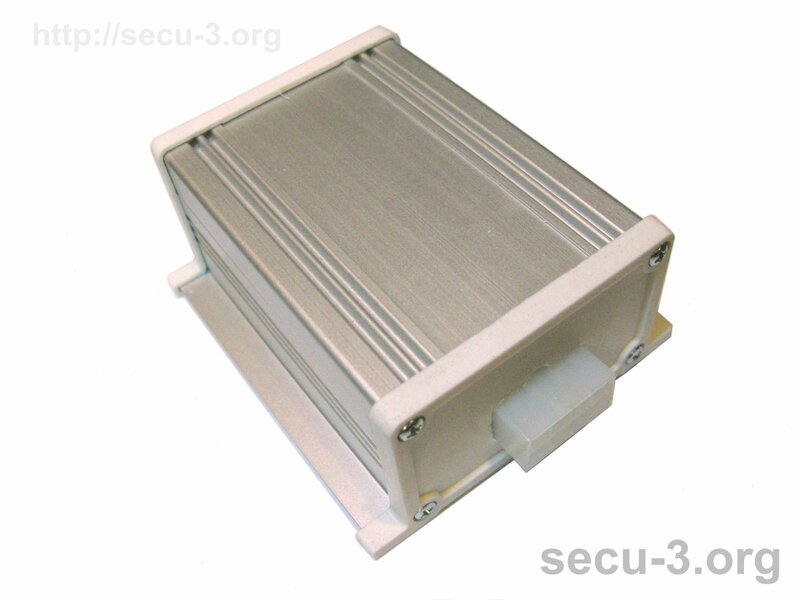 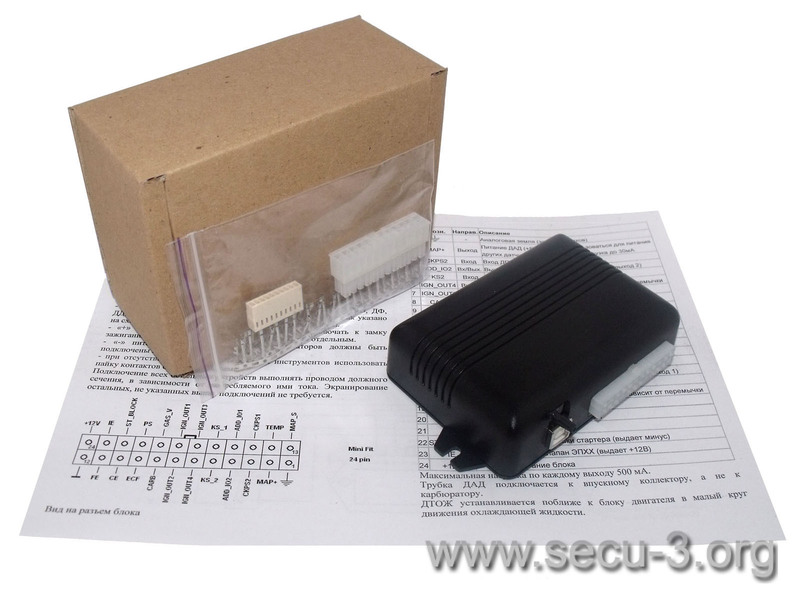 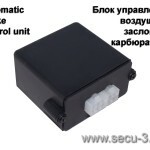 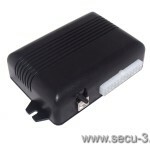 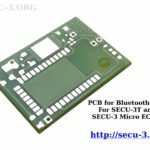 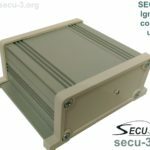 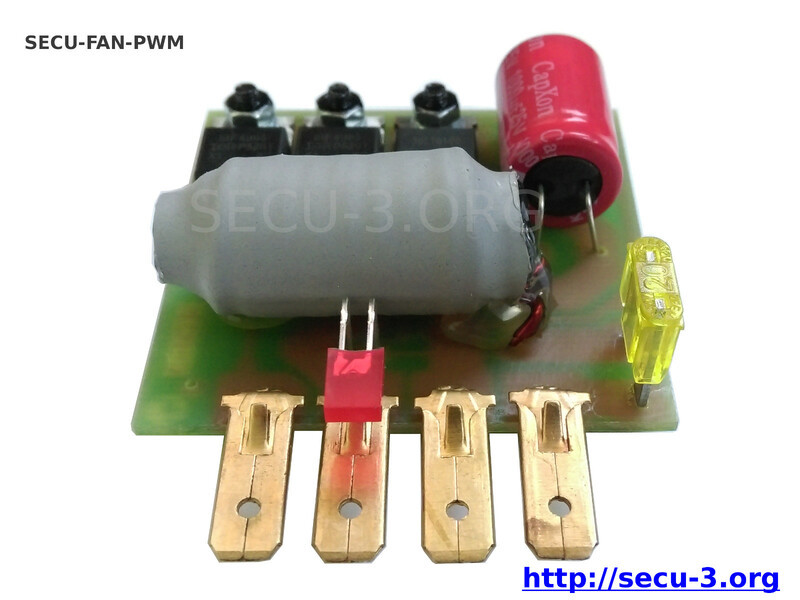 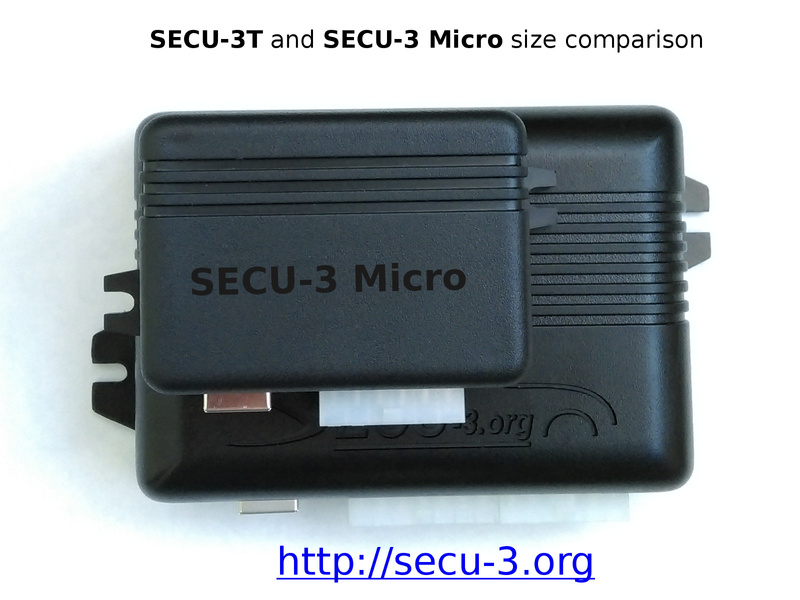 SECU-3 Micro can be seen as a very simplified edition of the SECU-3T unit and it is simplest one among other SECU-3 units (its constriction is noticeably simpler even than first SECU-3). 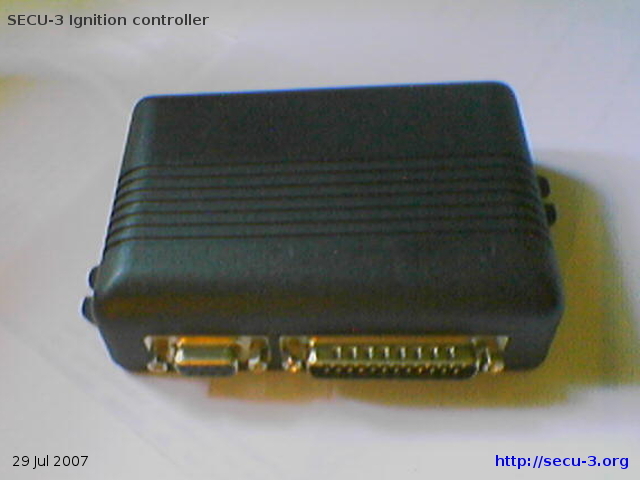 This unit is software compatible with other units. 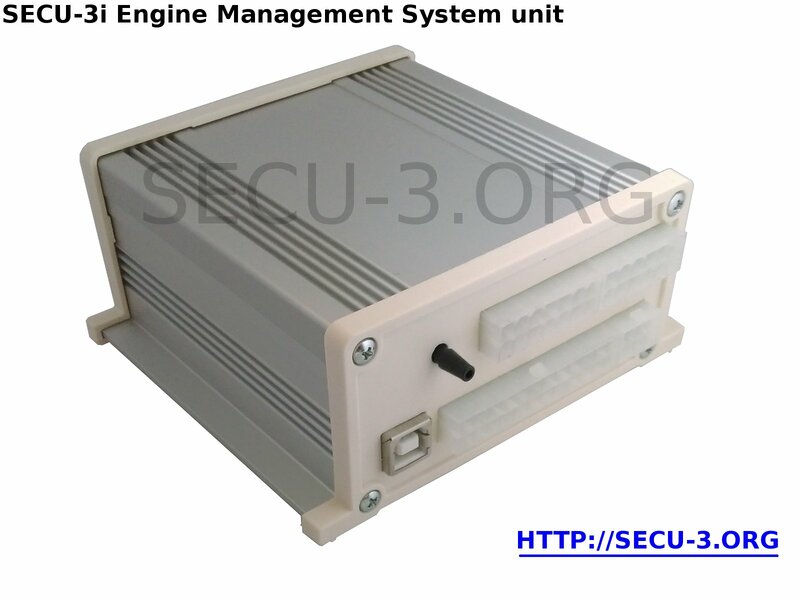 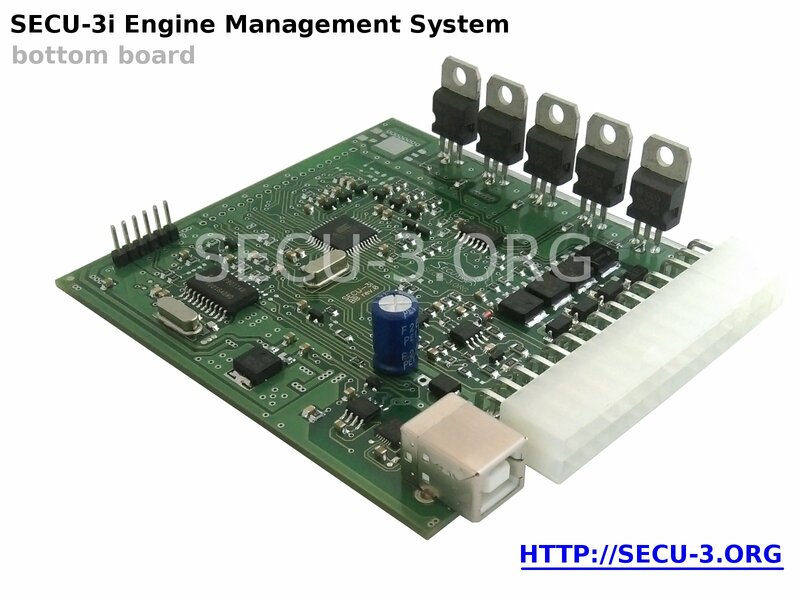 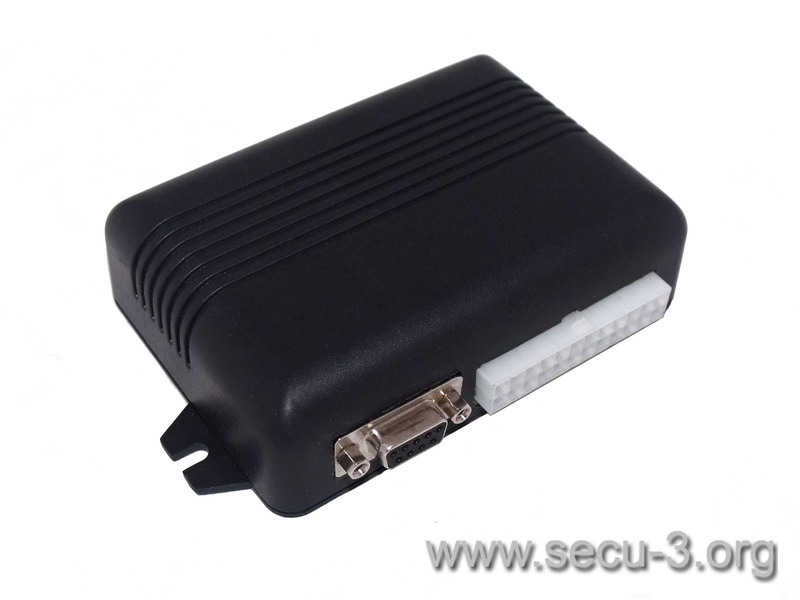 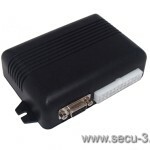 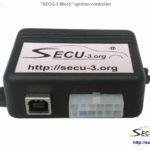 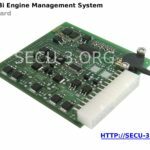 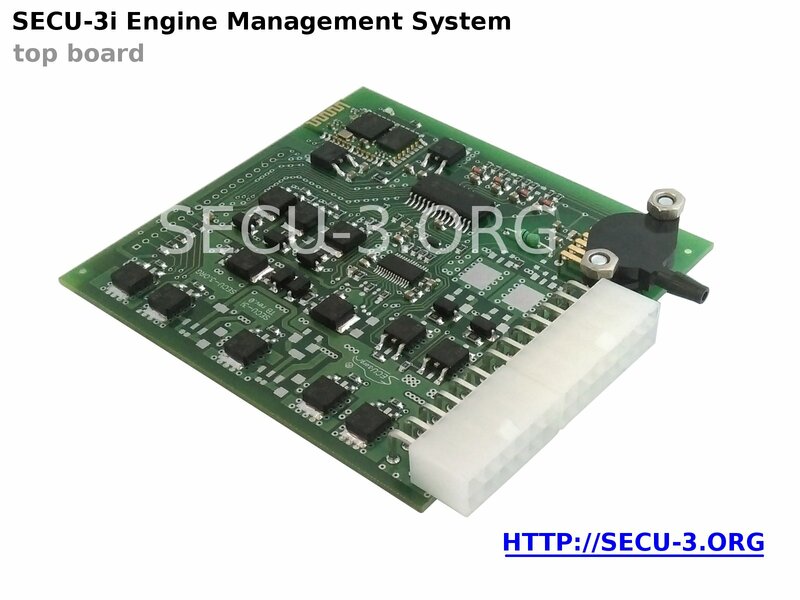 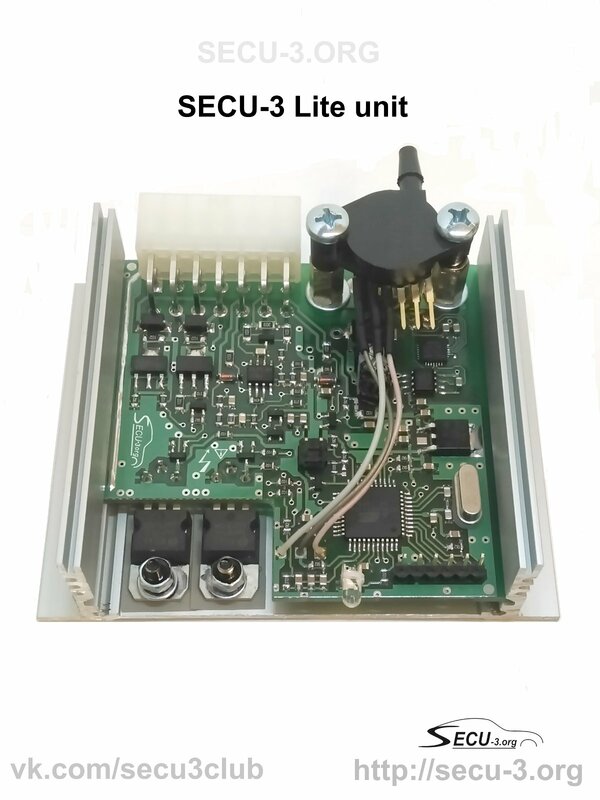 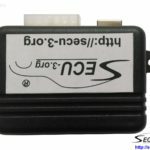 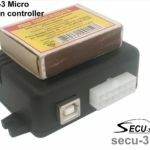 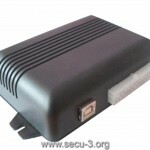 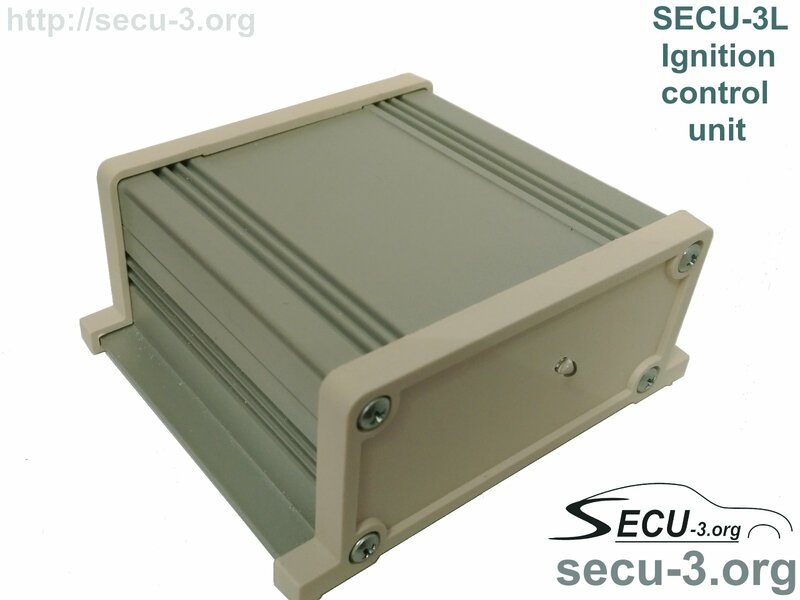 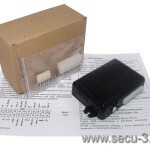 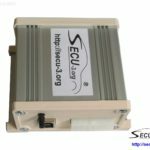 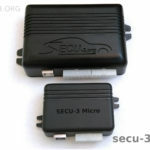 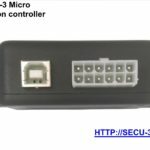 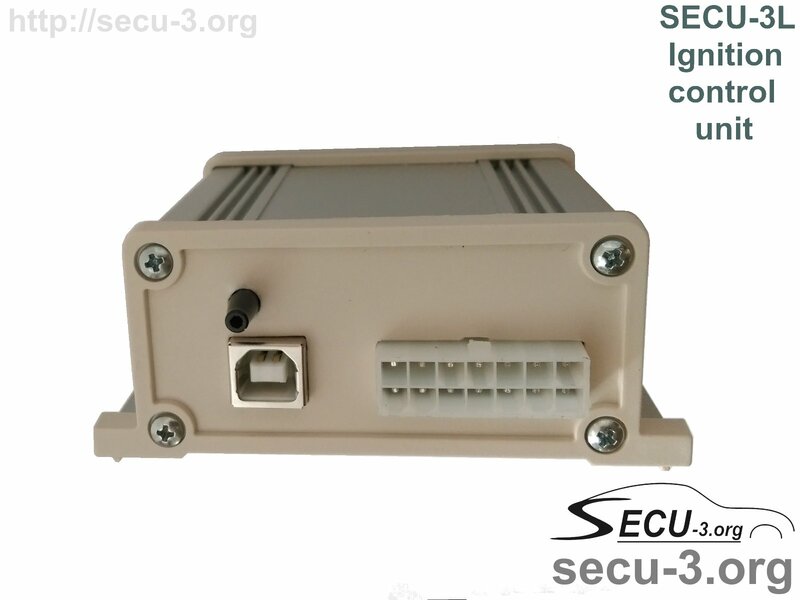 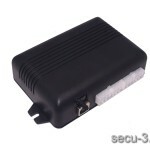 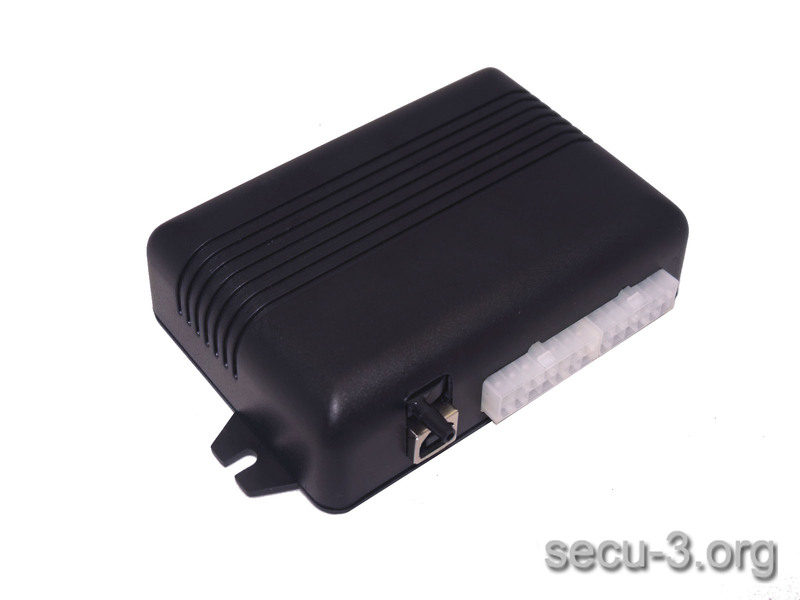 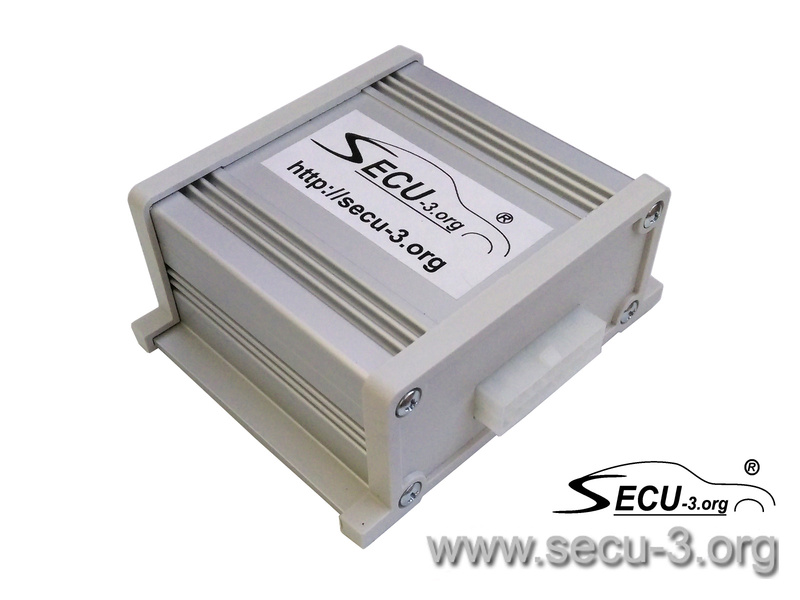 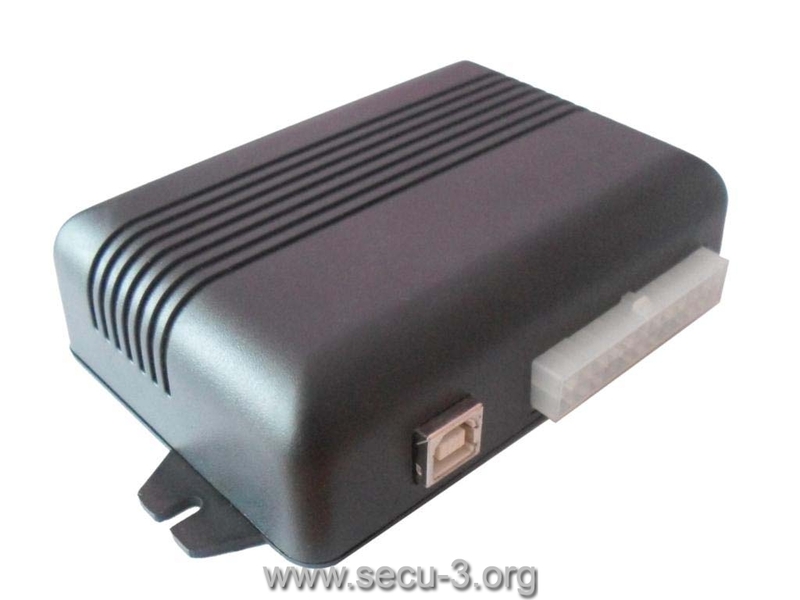 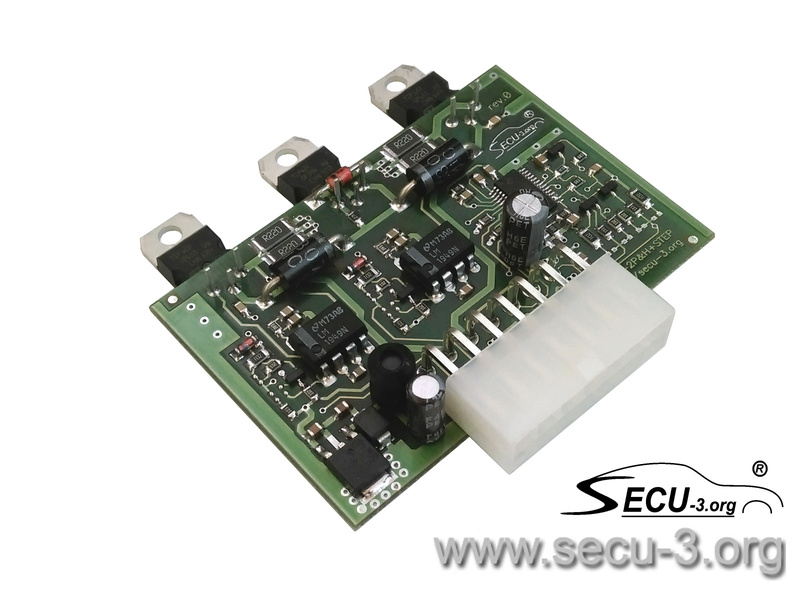 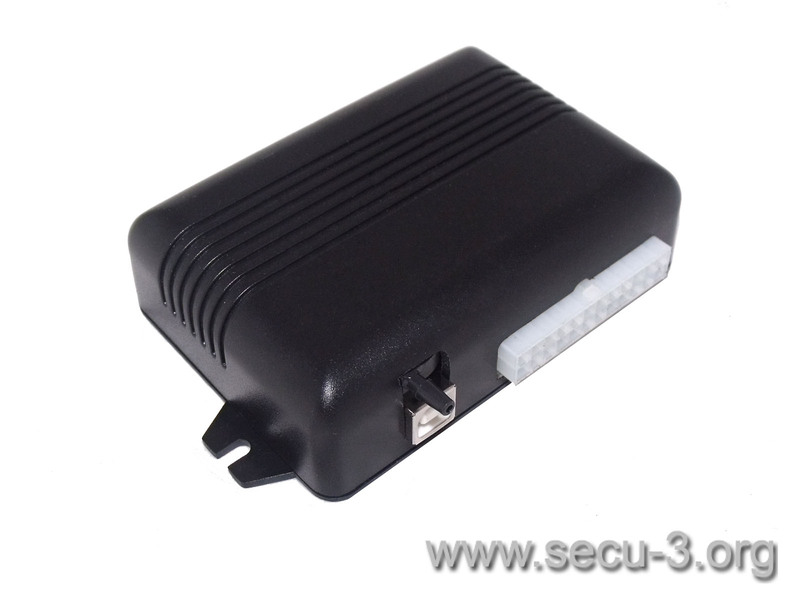 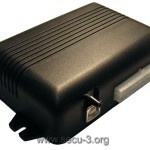 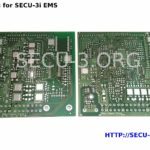 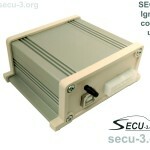 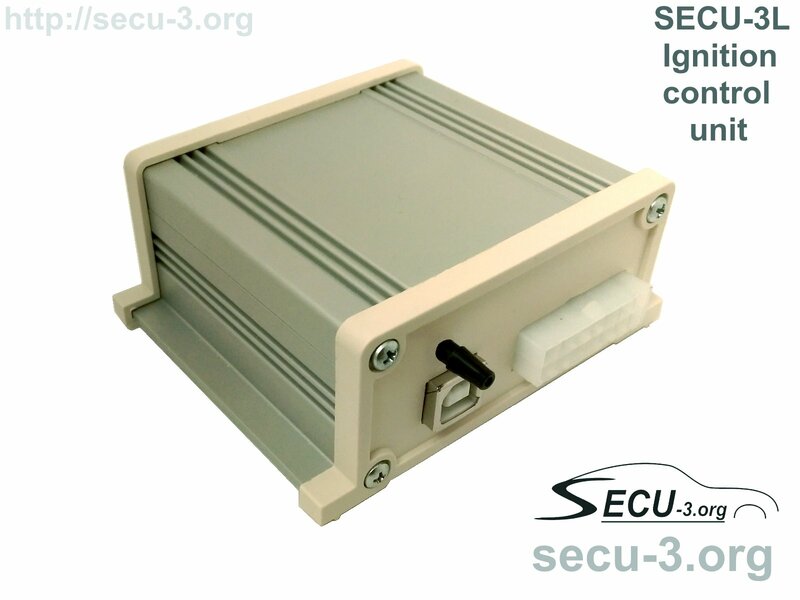 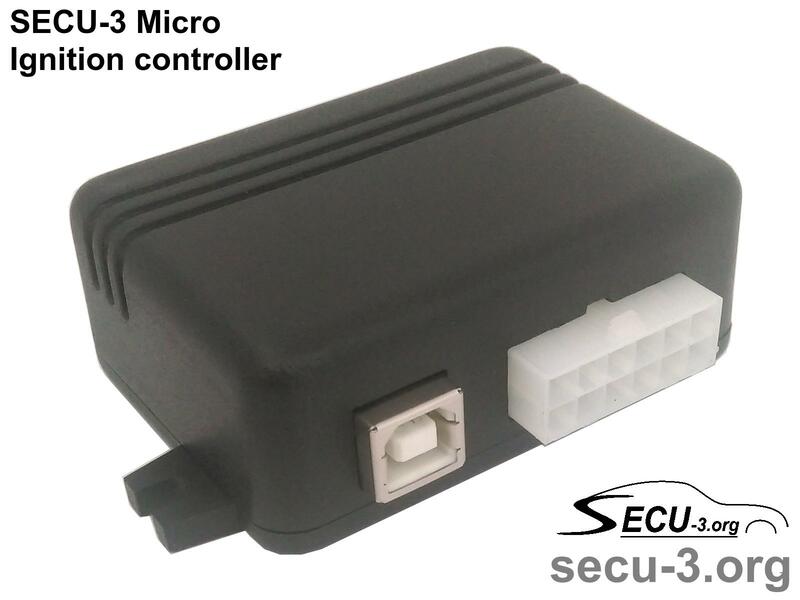 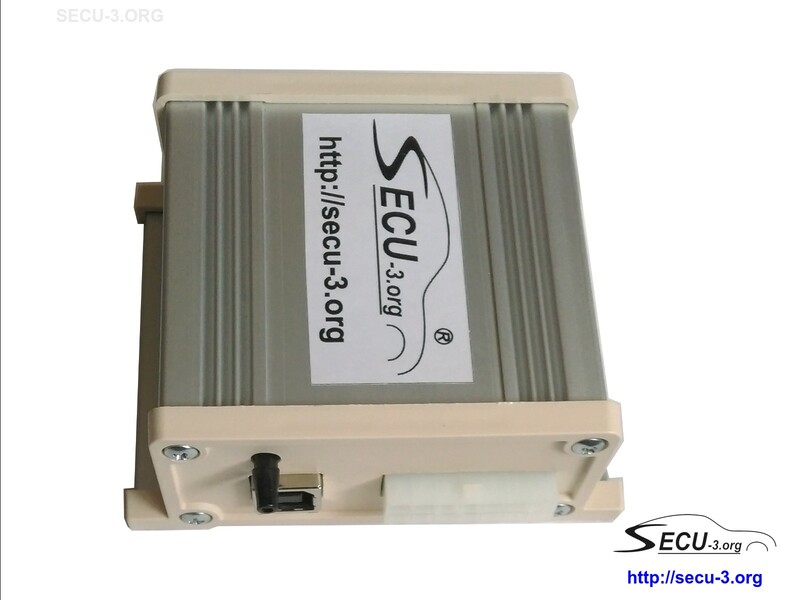 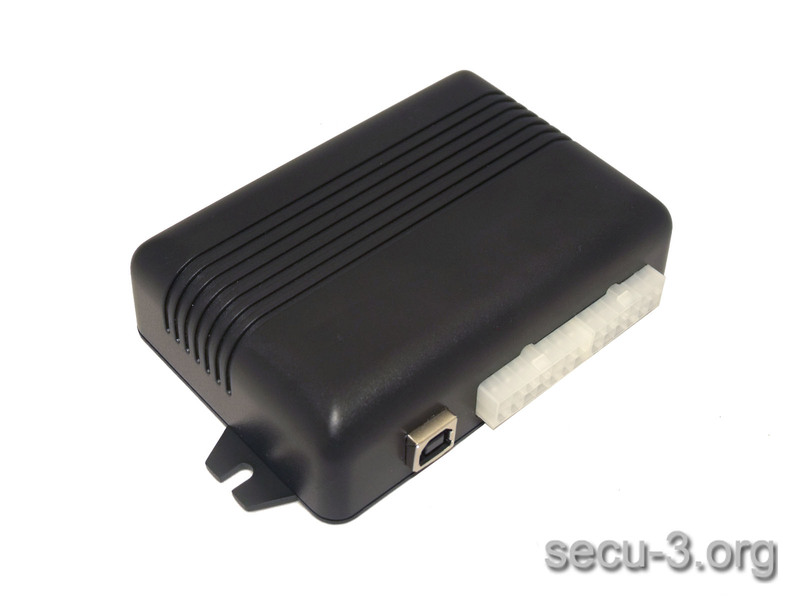 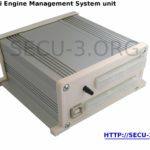 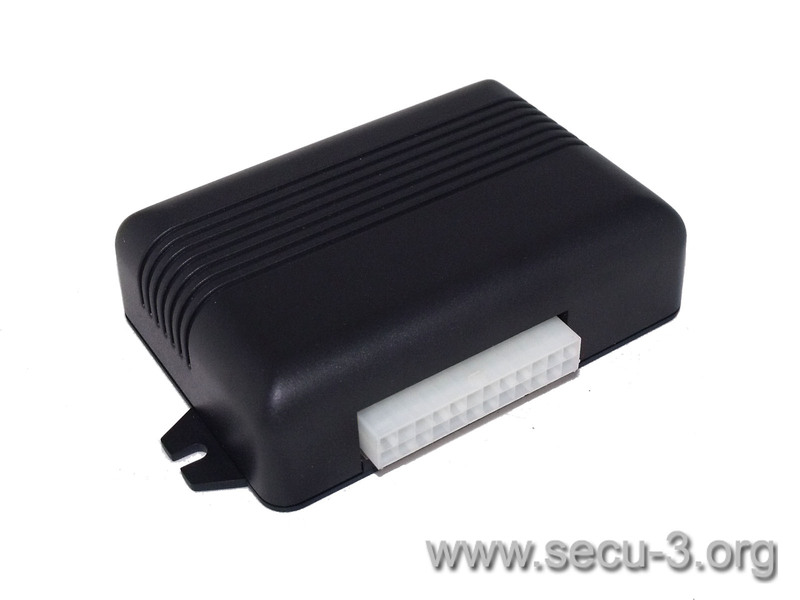 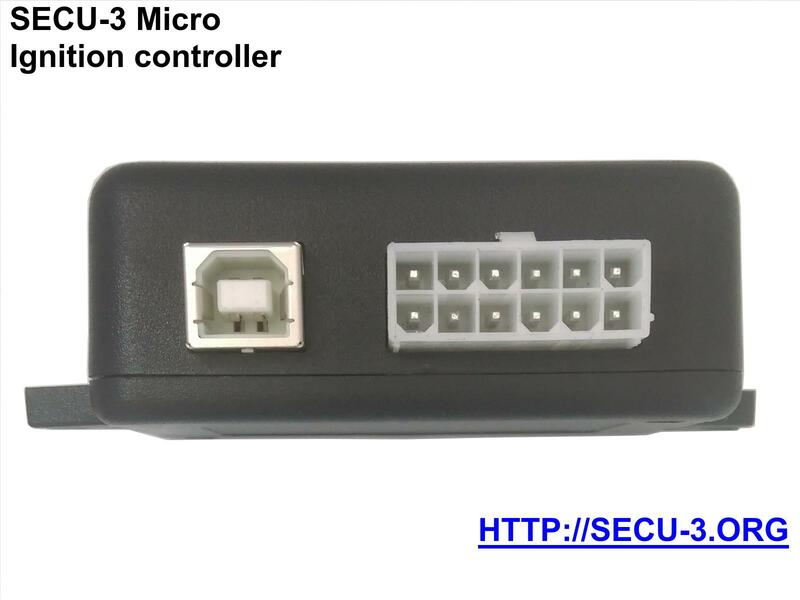 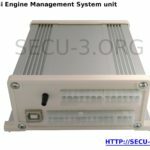 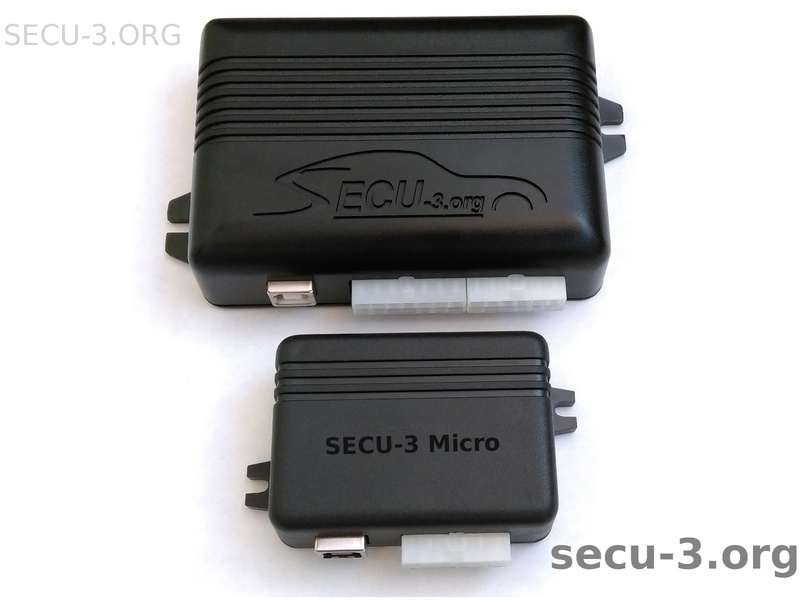 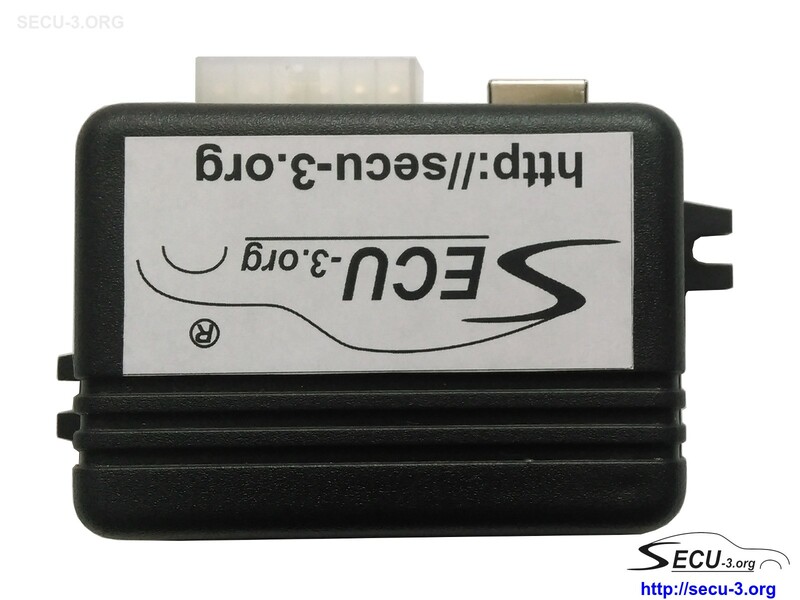 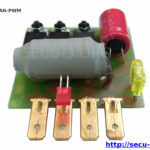 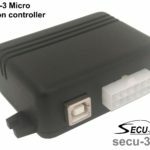 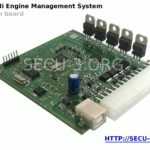 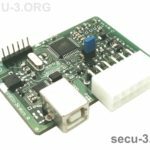 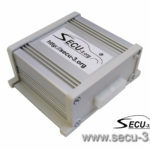 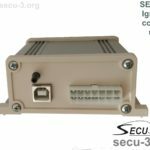 SECU-3i unit is fundamentally different from all of its predecessors and it is not ignition controller, but full featured engine management system. 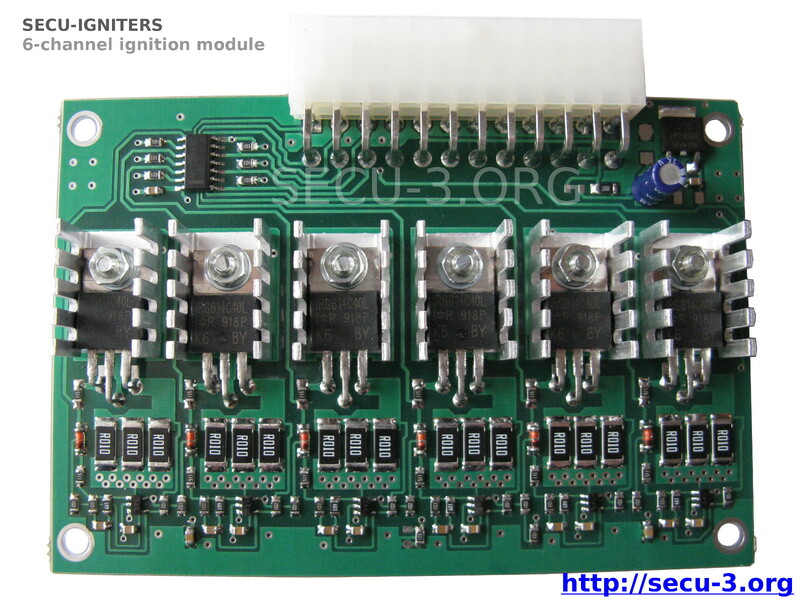 At the same time it can perform the functions of conventional ignition controllers without any problems. 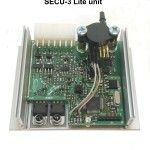 Experience gained during years of working on the project was used in development of this unit. 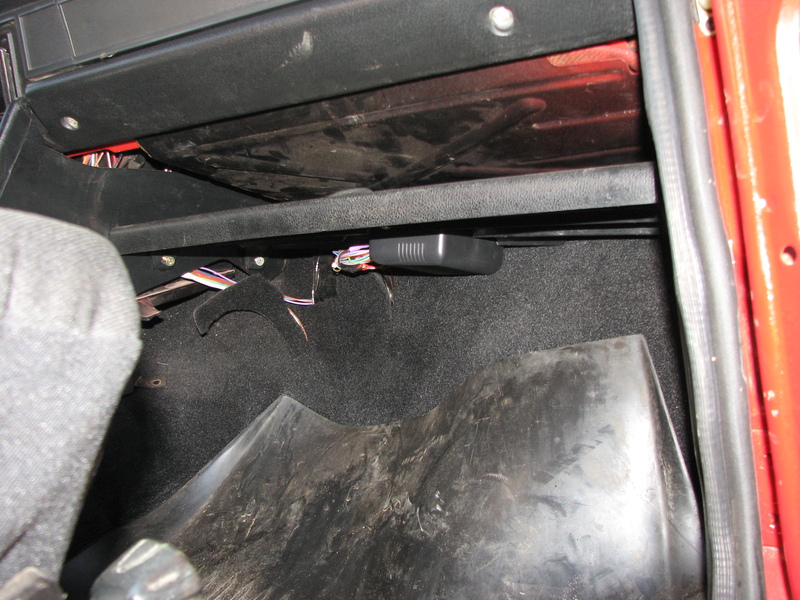 All necessary power switches and drivers are built-in inside the unit. 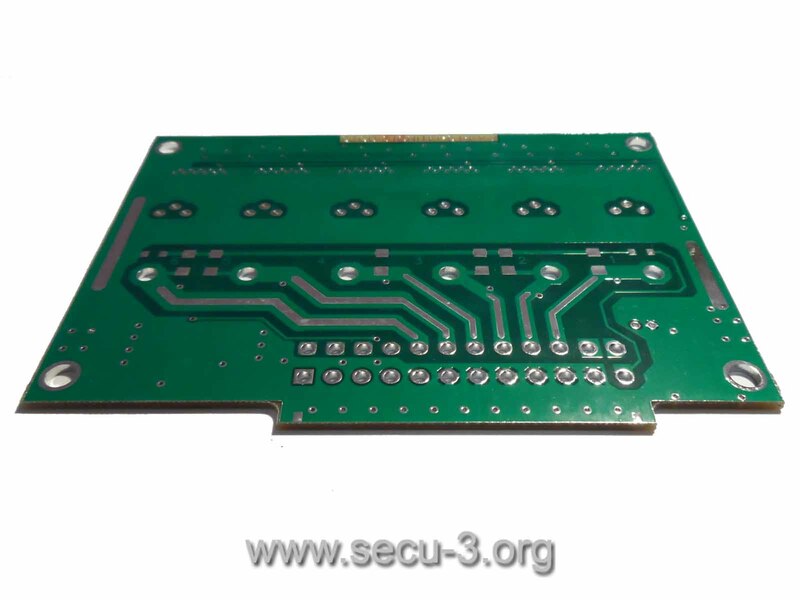 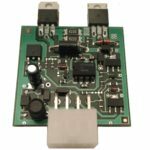 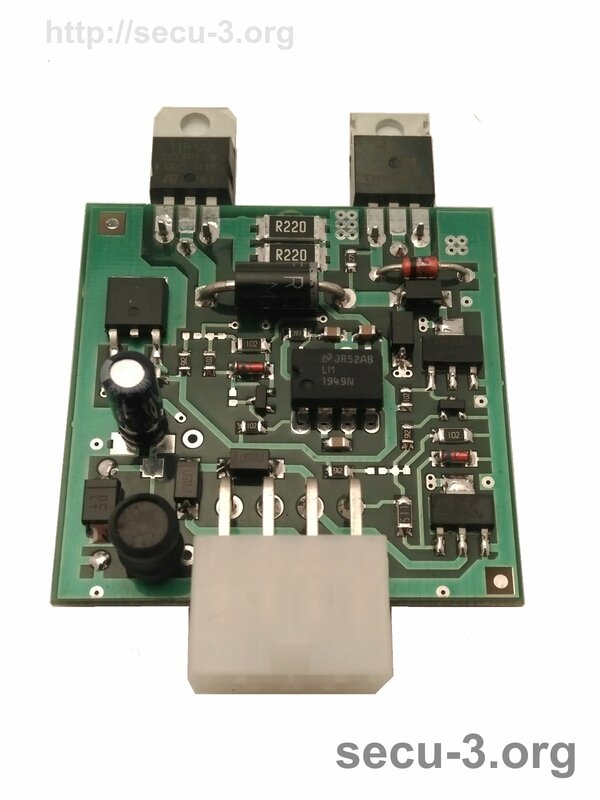 In order to obtain a compact design and versatility at minimal cost, it was decided to place the electronic components on the two boards. 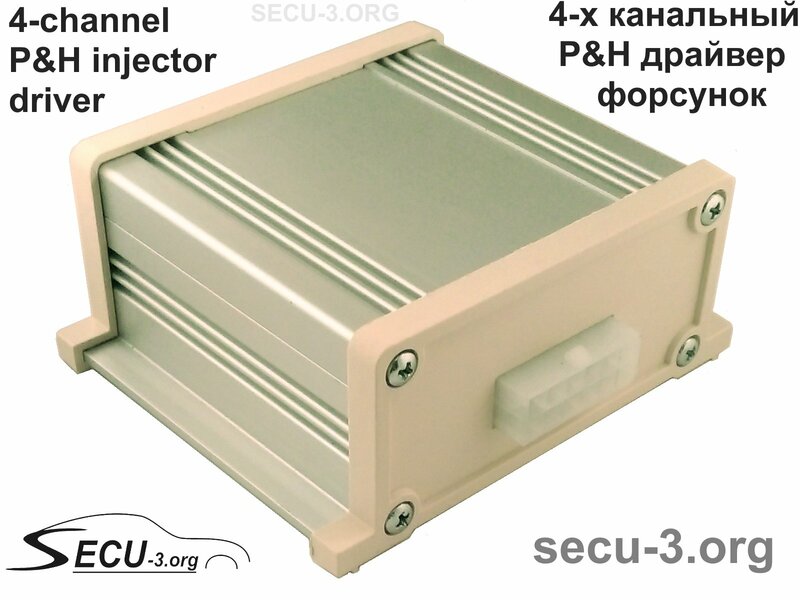 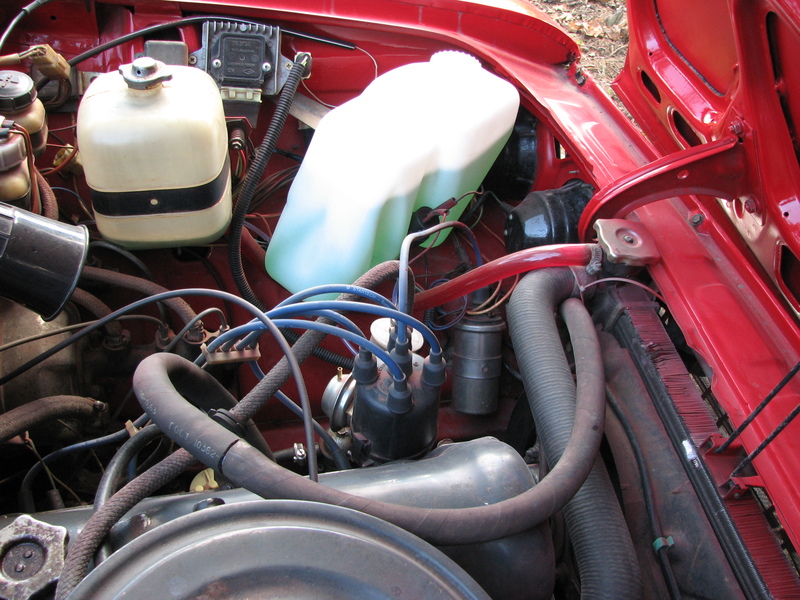 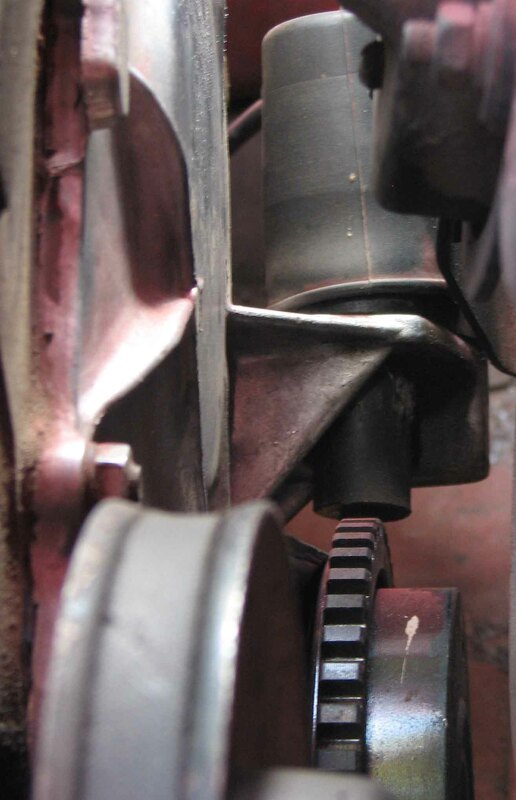 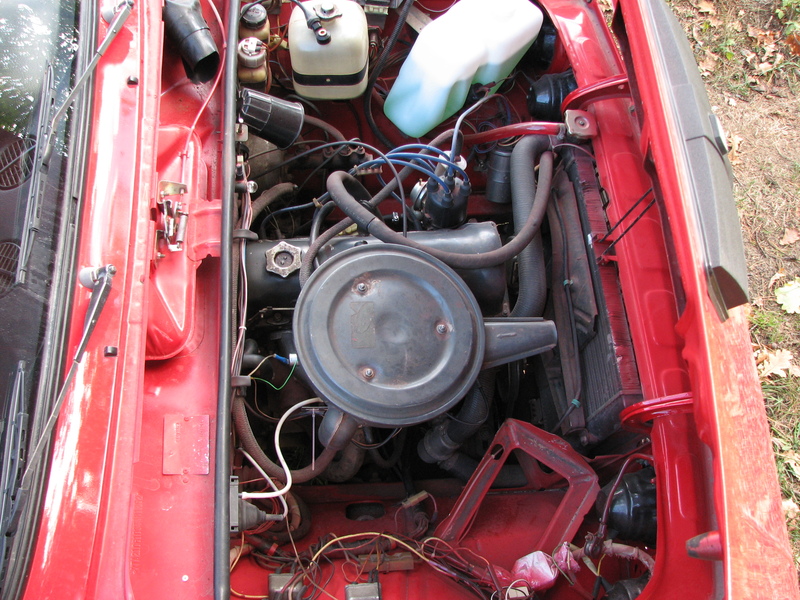 The car it all started with… Project author’s Moskvitch-2140 is the first one experienced the benefits of SECU-3. 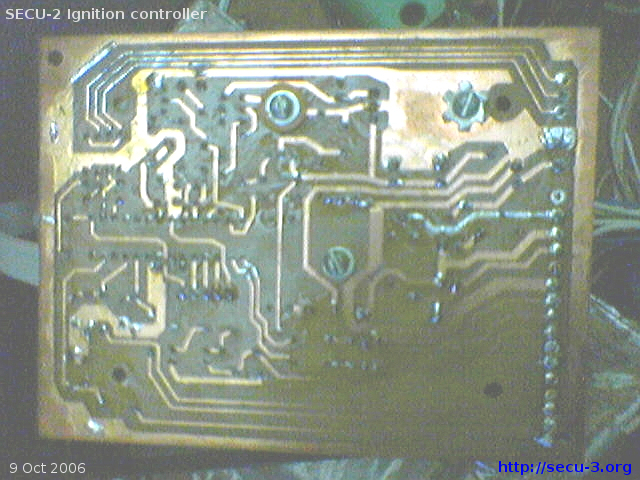 It was in October 2007. 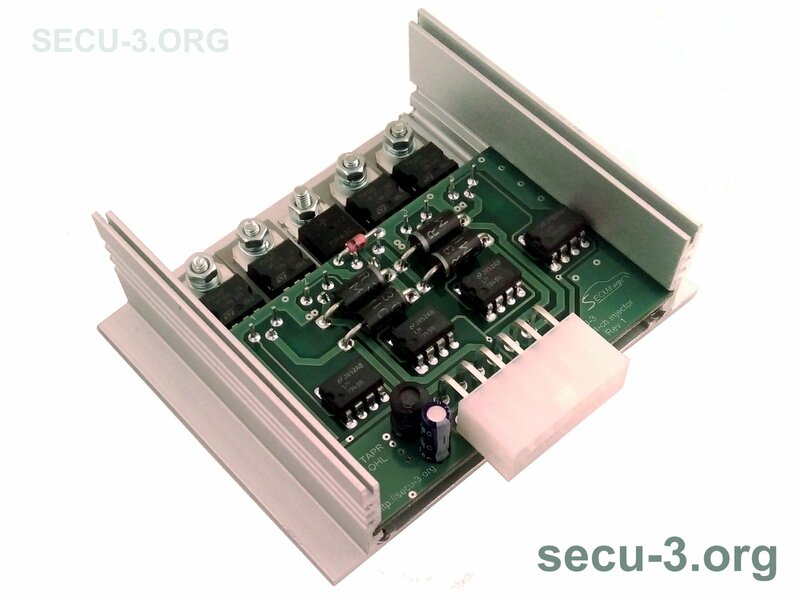 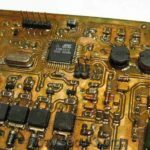 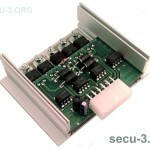 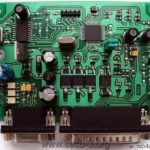 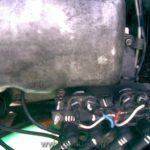 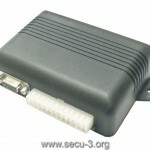 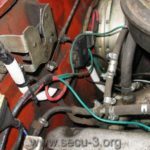 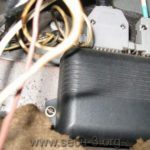 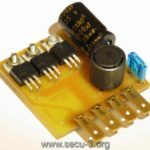 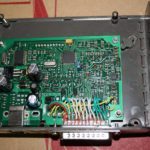 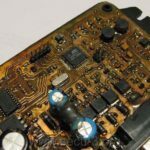 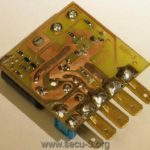 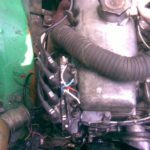 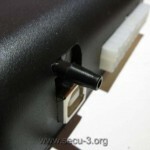 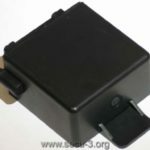 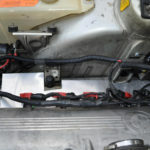 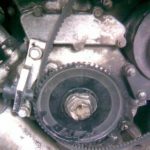 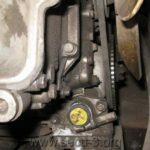 A lot of installation examples of the SECU-3 units can be found in a special section on our forum. 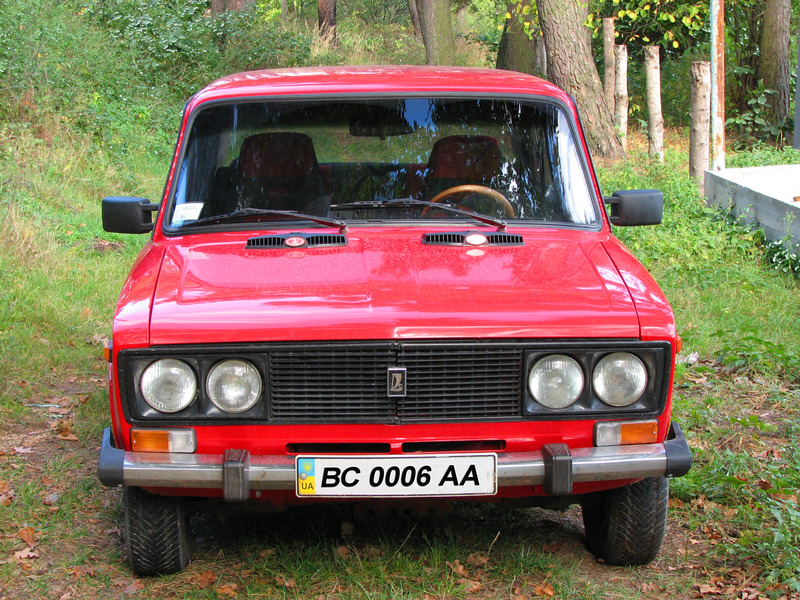 You can see also a Russian section. 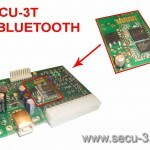 At the beginning and first few years (2007-2010) project was discussed on the ixbt forum in one topic. 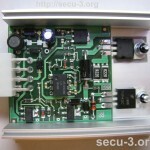 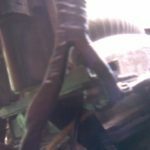 Autumn 2010 discussing of the project was started on the diyefi.org forum. 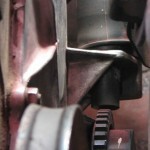 Thanks to Fred Cooke. 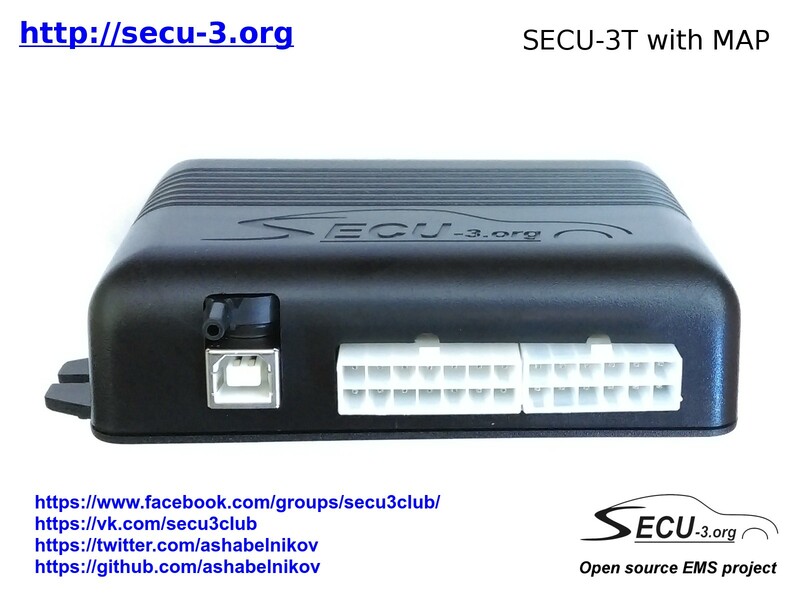 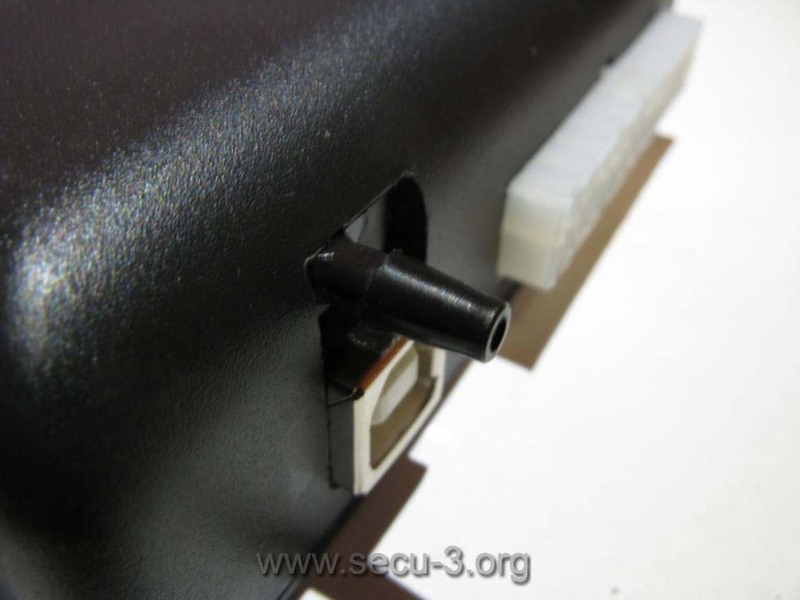 In May 2013 our own forum on the secu-3.org was launched. 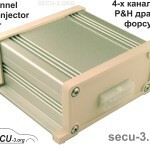 Starting from 2007 and till 2011 project’s site was on the secu-3.narod.ru domain. 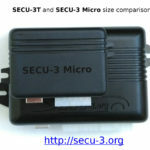 In January 2011 our site migrated to its own domain secu-3.org. 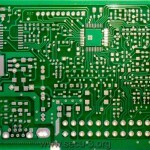 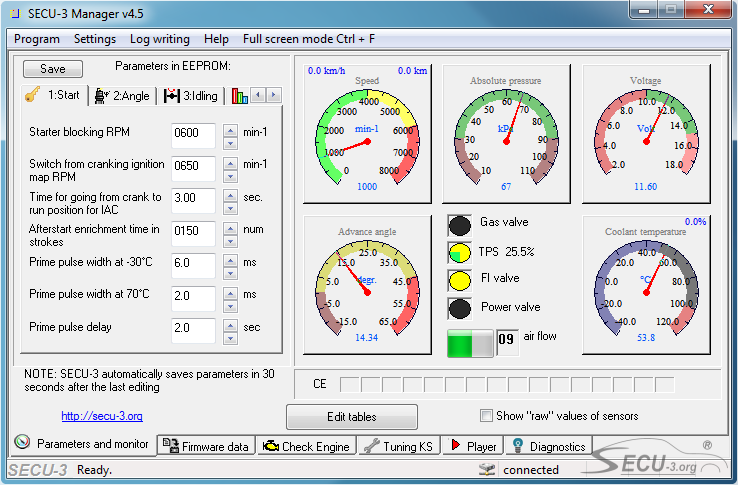 15.09.2012 New file format *.s3f for saving of advance angle maps and other data	20.09.12 PCB is updated. 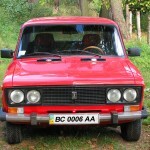 Now revA.